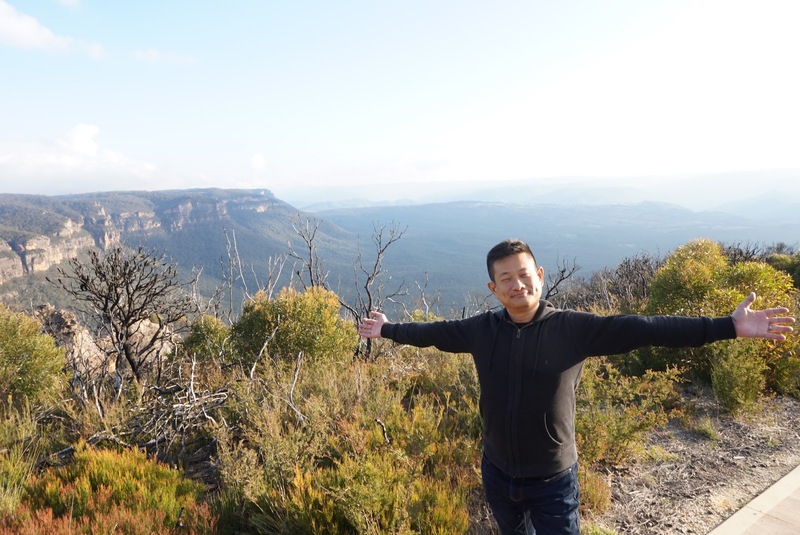 As iconic as the Sydney Harbour Bridge and Sydney Opera House, the Blue Mountains National Park is a must visit when coming to Sydney. 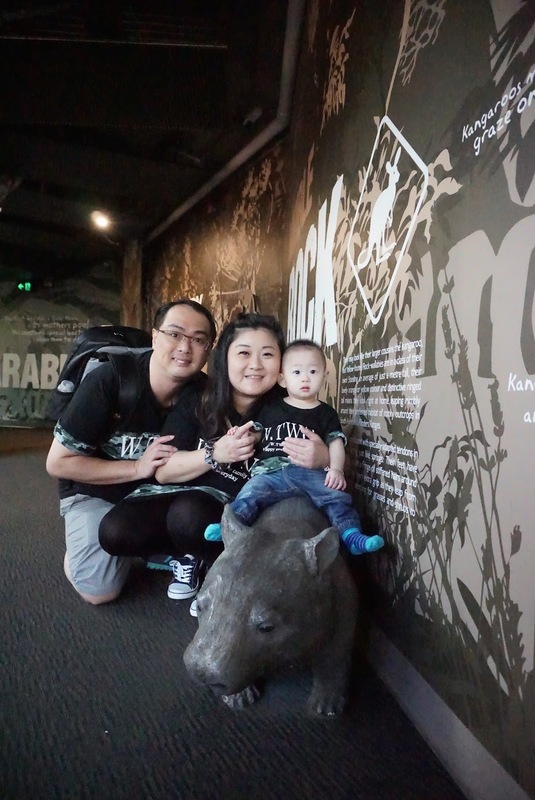 We planned to visit this national park during weekdays to avoid most of the crowd and indeed visitorship is rather thin on this Monday at the time of our visit. 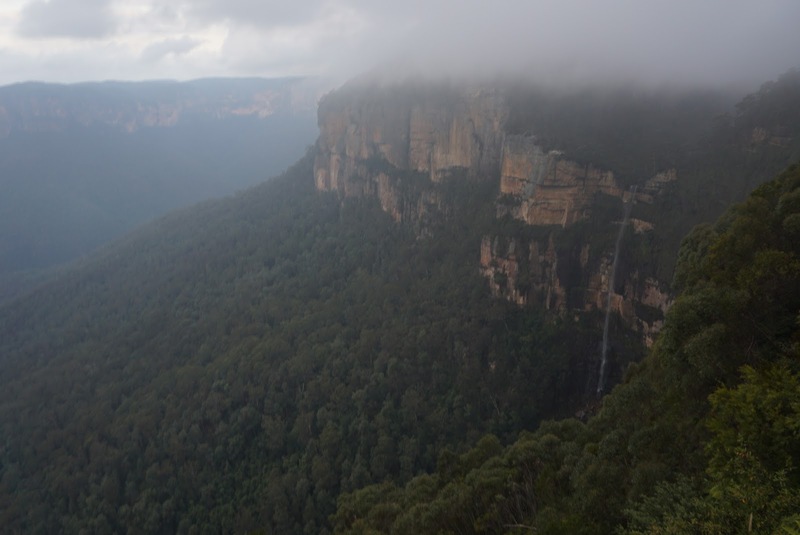 Blue Mountains is located about 100km West of Sydney and took us 1½ hours to drive from Sydney Olympic Park. 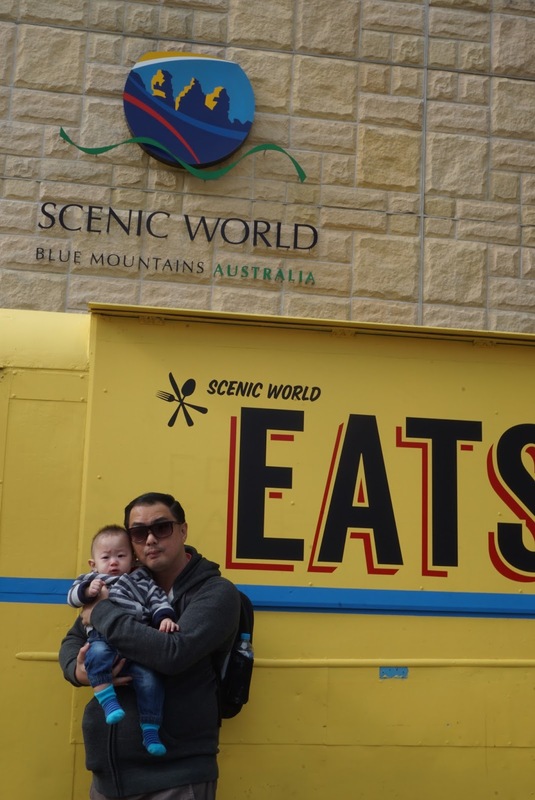 Our first stop is Scenic World, which is a great place to start the trip to Blue Mountains National Park. 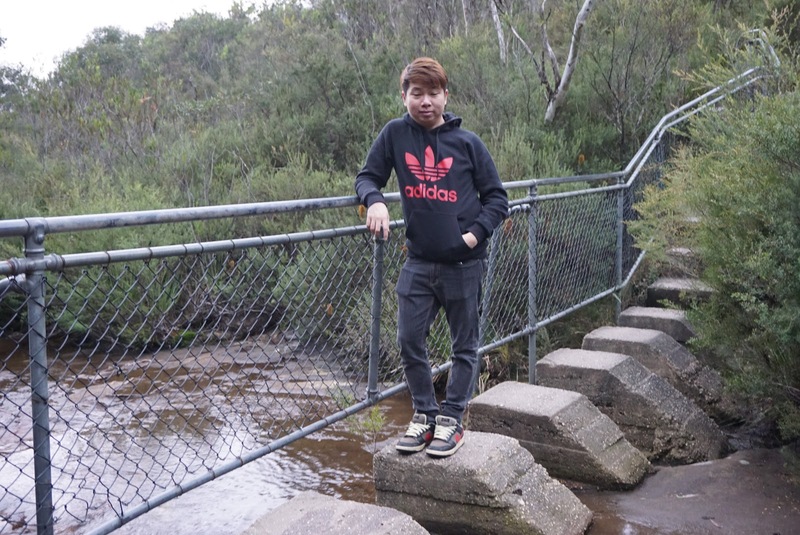 Scenic World overlooks the Jamison Valley where the famous Three Sisters is located. 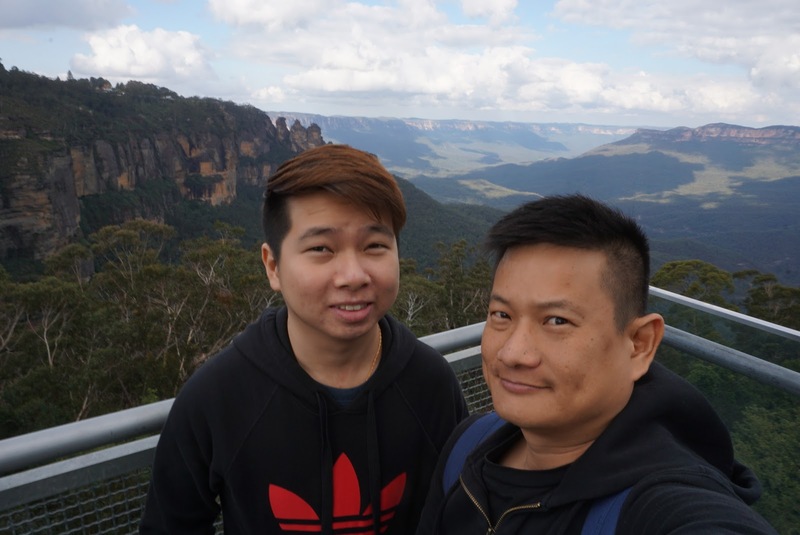 This is also where we bought our day pass that allowed us unlimited rides on all 3 modes of transportation for us to appreciate the beautiful Blue Mountains. 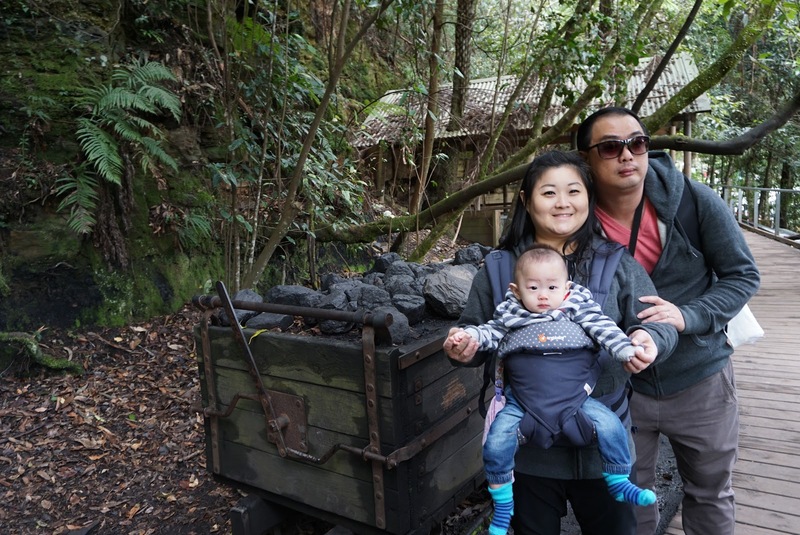 Visitors are free to customise the way they wanted to use the 3 modes of transportation when visiting scenic world. 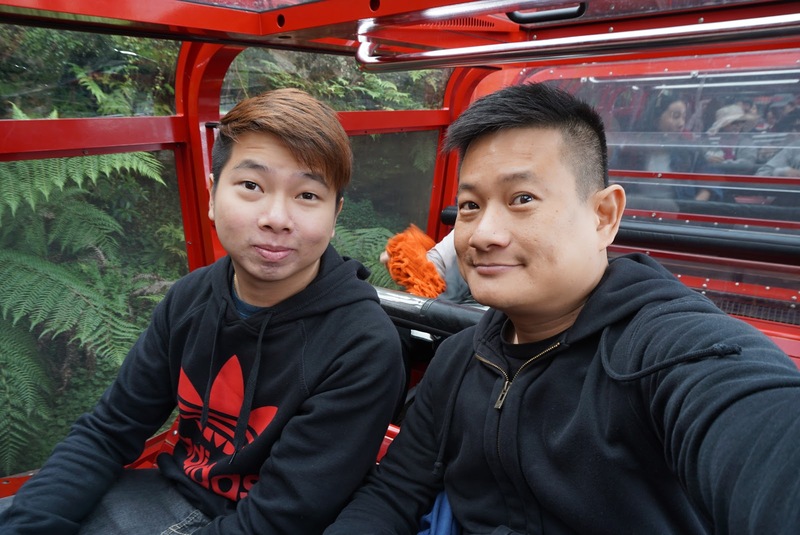 For us, we took the Scenic Railway to the valley floor, did a short walk and took the Scenic Cableway up to Scenic Top Station and took the Scenic Skyway to the East Station and back. 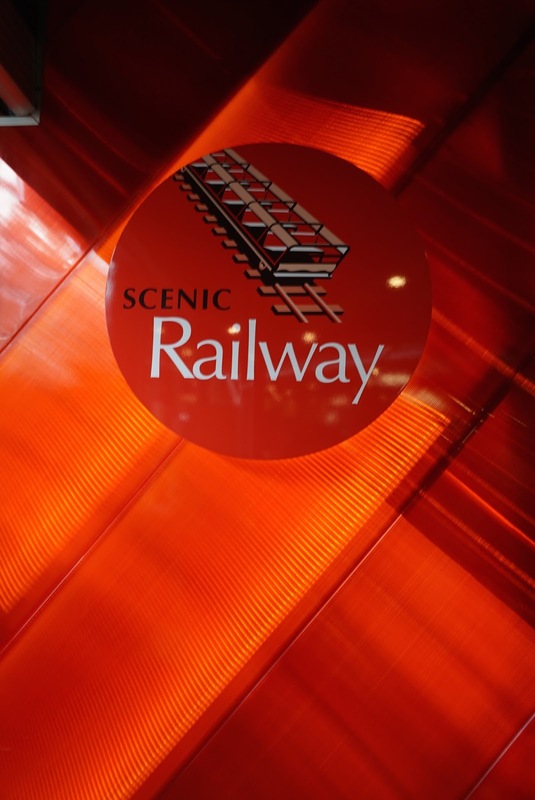 Scenic Railway is boasted as the world’s steepest passenger railway with a inclination of 52°. 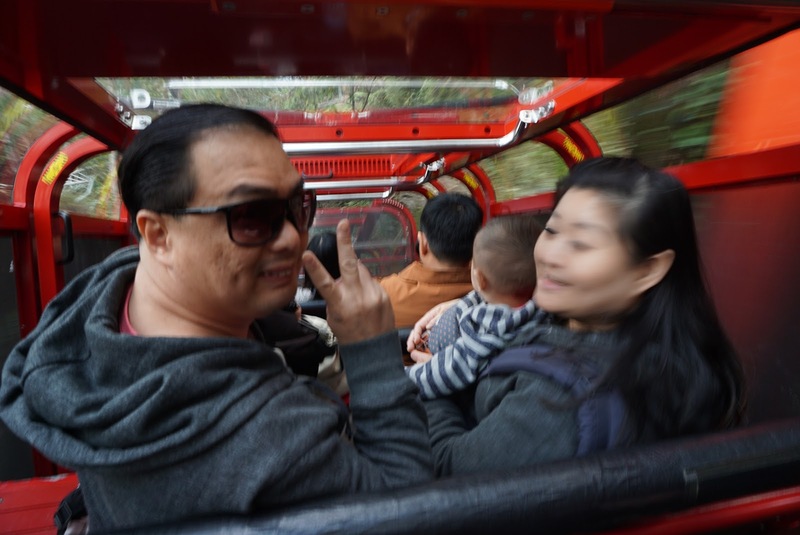 I thought riding the railway down to the valley floor is more fun than riding it up backwards. The train brought us down 310m into Jamison Valley and takes about 5 mins. 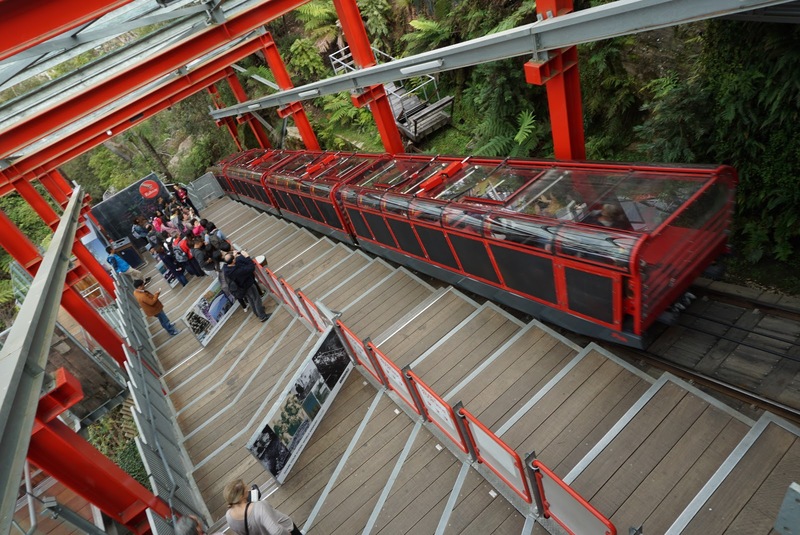 There are options for passengers to customise the way they want to ride the Scenic Railway. 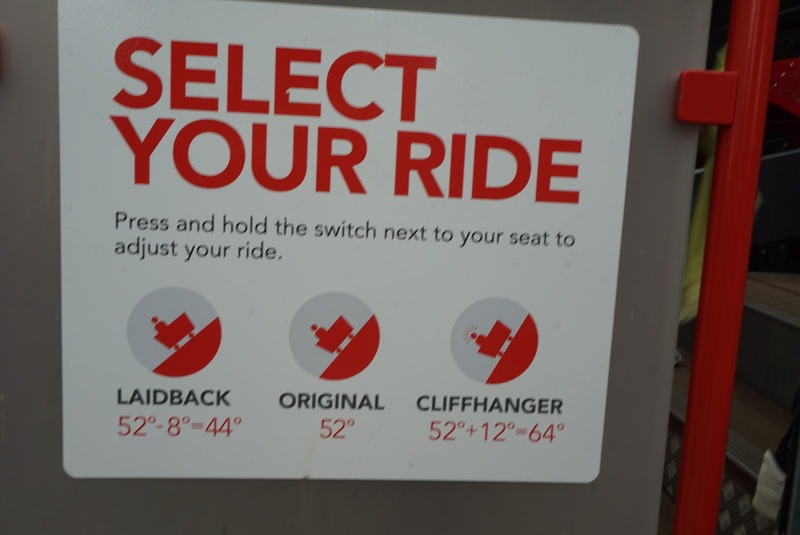 My friend and I opted the “daredevil” Cliffhanger mode, which allowed us to ride the railway at 64° inclination. As there are no seat belts on the seats, half the time we were trying to prevent ourselves from sloping towards the seats in front of us. 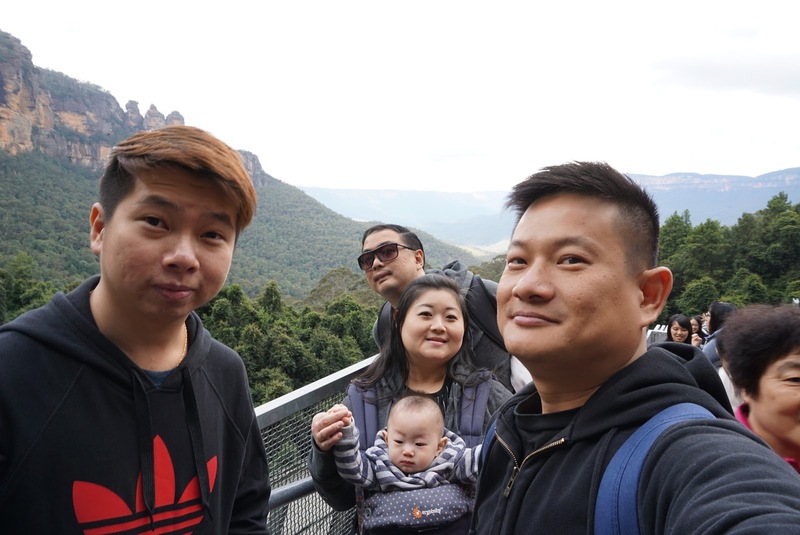 Nonetheless, we were glad we rode the train in their cliffhanger mode and had a great time riding the world’s steepest passenger train. 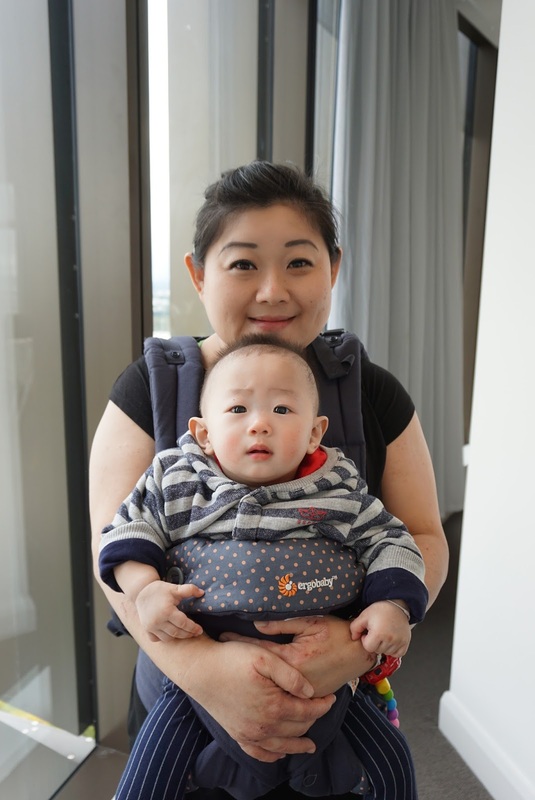 As my sister and her family had a baby in tow, they opted the laidback mode, riding the train at about 30° inclination. 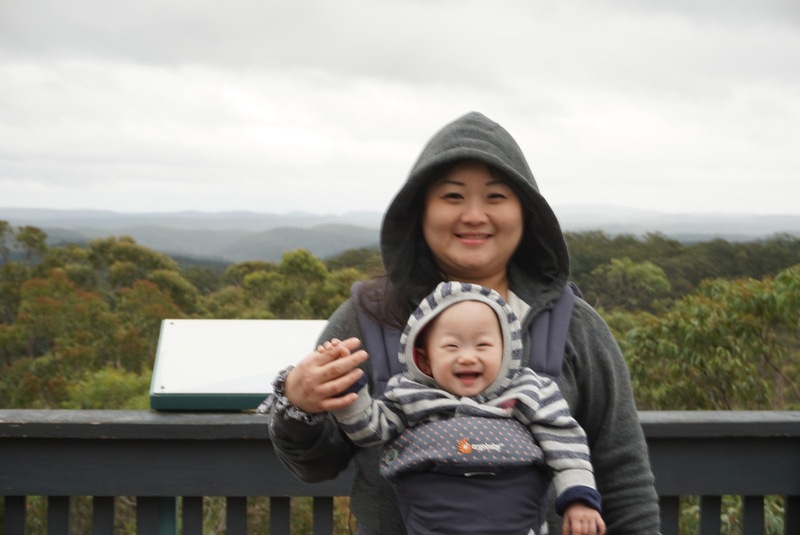 My nephew, despite being only 9 months old, enjoyed his ride down to the valley floor on the Scenic Railway. 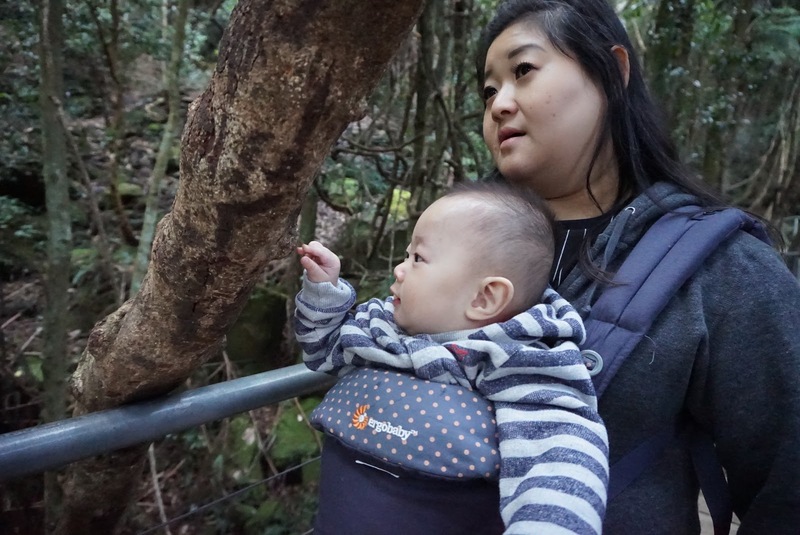 As no prams are allowed in this ride, visitors with prams or wheelchairs are not able to take this ride, there is still the Scenic Cableway option down to Jamison Valley. The ride down to the valley floor, started with a gentle slope. 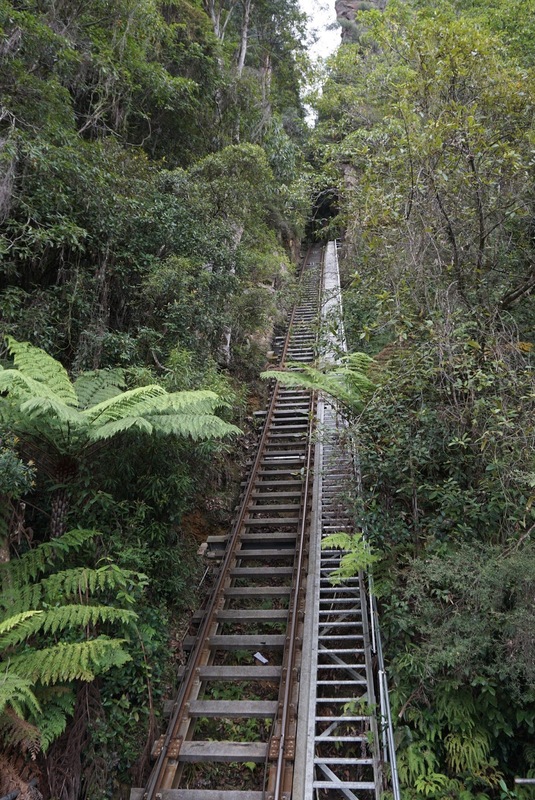 In the beginning we were not able to feel the steepness of the railway. 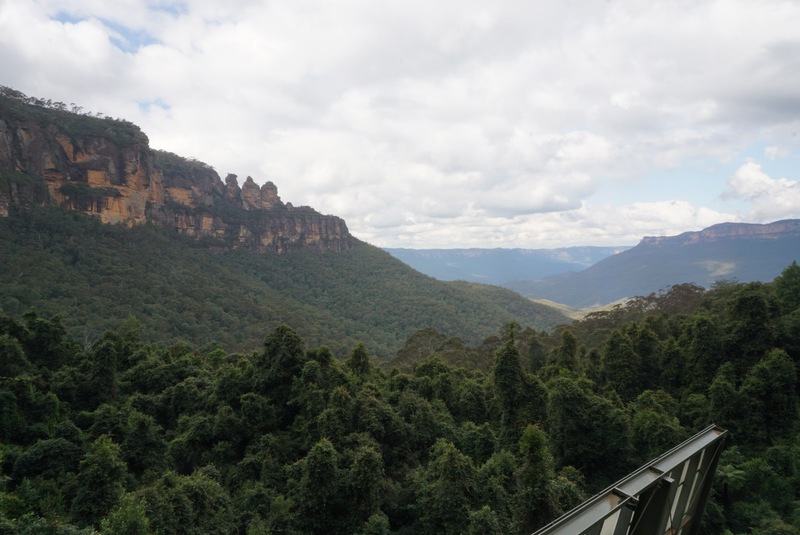 A little in the ride, the railway suddenly tilted steeper as we descend to the valley, I find the Indiana Jones theme song playing inside the enclosed train carriage a little cheesy. 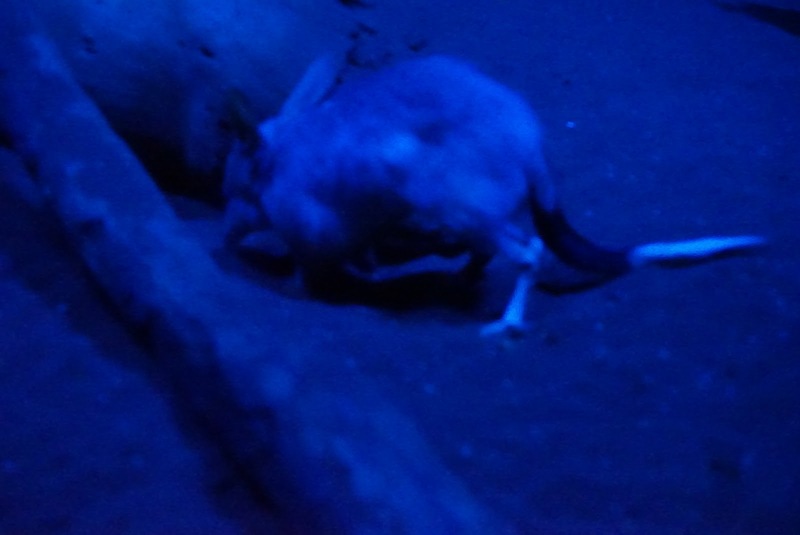 Soon the Railway reaches a cliff-side tunnel, all of the sudden everything was pitch black. 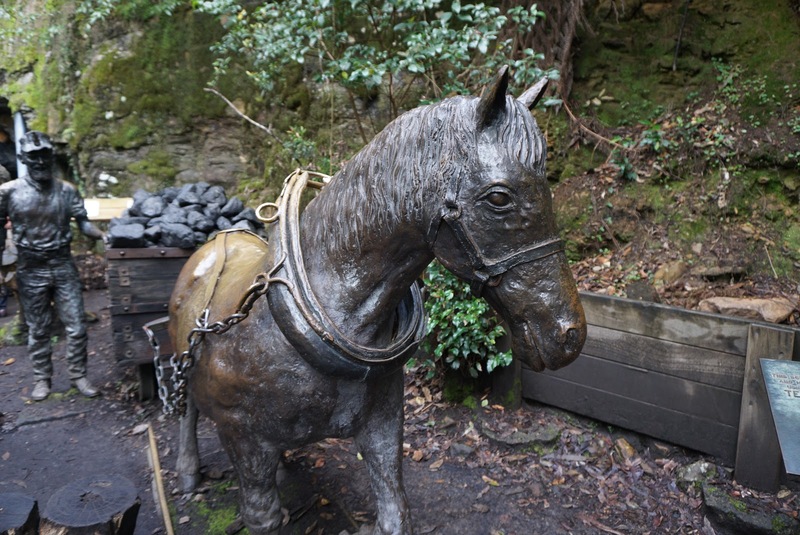 We can only hope that we don’t find ourselves sitting on the carriage floor after we pass the tunnel. 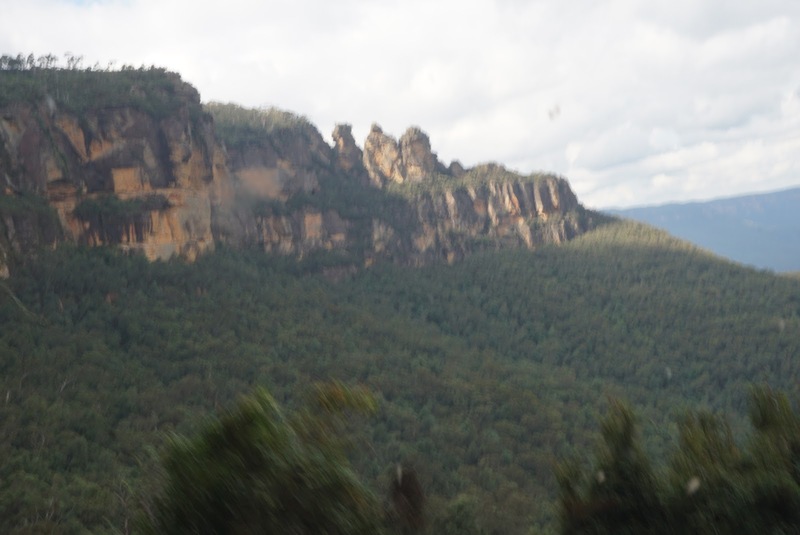 As the train descends further into Jamison Valley, we were out of the tunnel. The view from the left side of the train is spectacular! 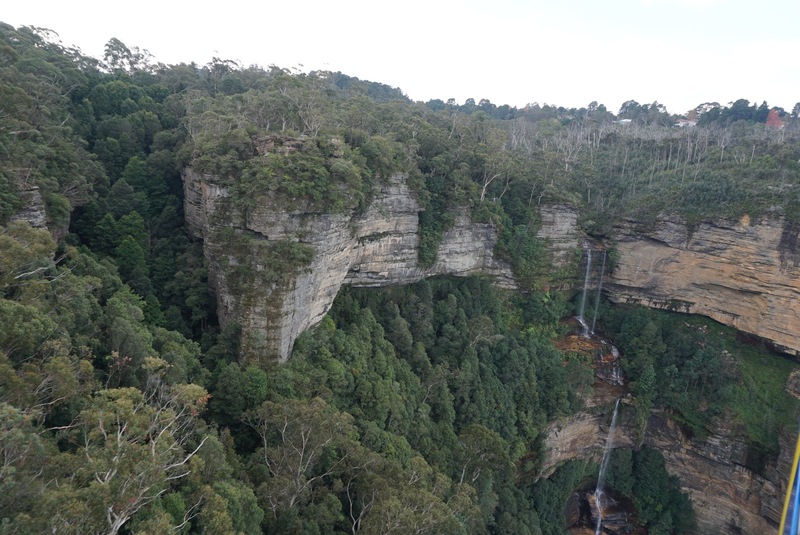 I can see part of a waterfall and the Three Sisters peeking through the canopies of the forest. The inclination of the railway turns gentle once more, we know our ride is over as we were at the Scenic Railway Bottom Station. Exiting the Railway, we stopped briefly at the side of the station. We felt so small being enclosed by the cliff where the Three Sisters sit and the vastness of the land that seem to stretch forever. 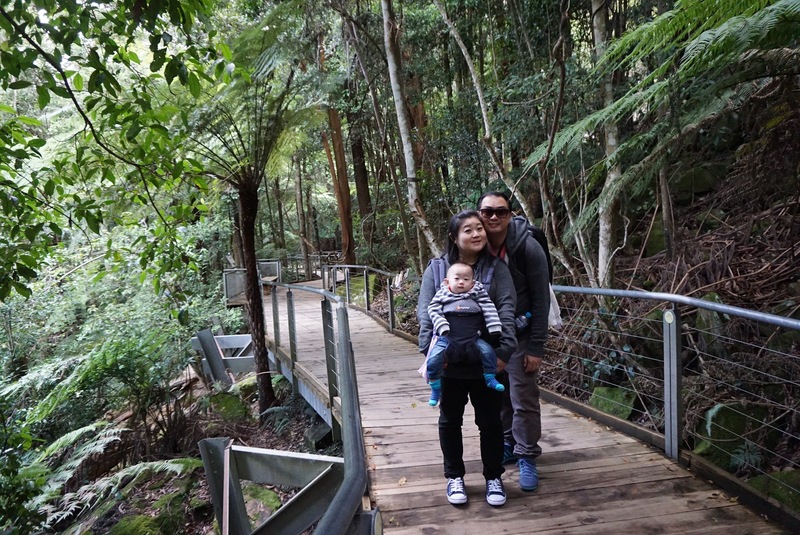 After snapping a few more pictures, we headed to the Scenic Walkway in the Jamison Valley floor. 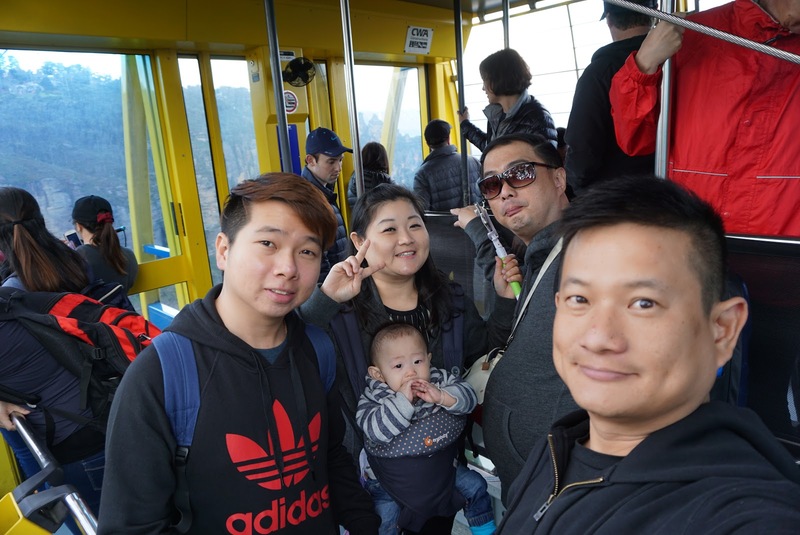 There are 3 routes that we can take in the Scenic Walkway, all of which end up in the Scenic Cableway Bottom Station. 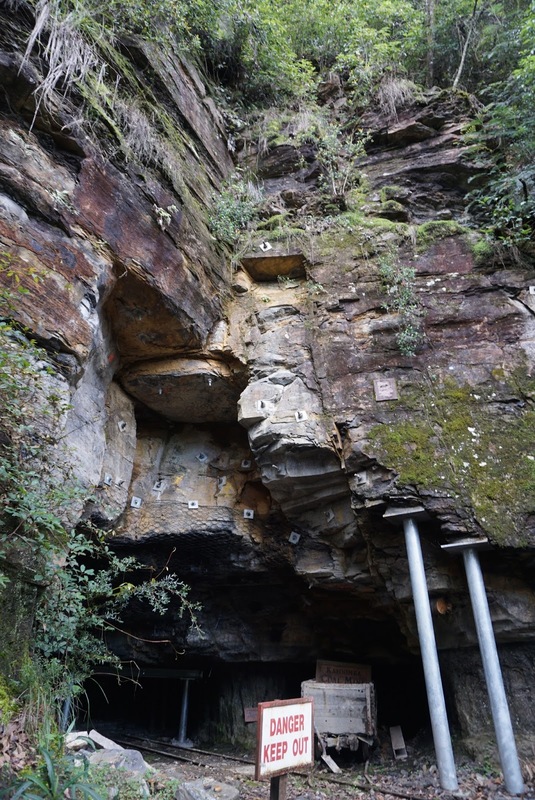 We took the shortest of the 3 route – Coal Mine Route, which took us around 15 mins to reach the Scenic Cableway Bottom Station, the other routes are the Lillipilli Link (30 mins) and Yellow Robin Link (50mins). 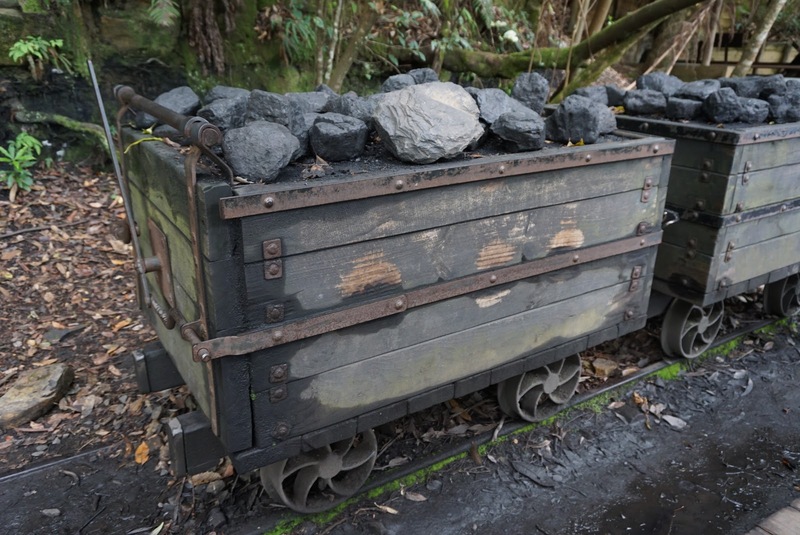 True to its name, there are a couple of coal mines along the Coal Mine Route. 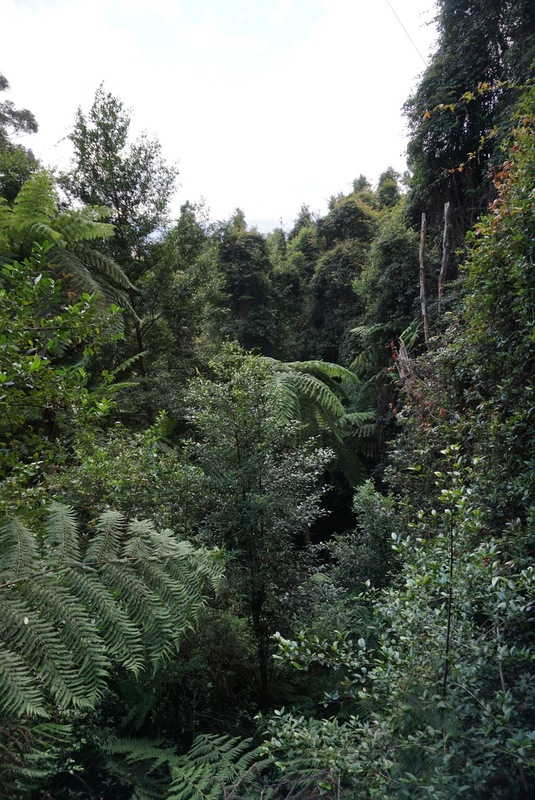 The air is indeed fresh down at the valley, with the freshness of the rainforest. 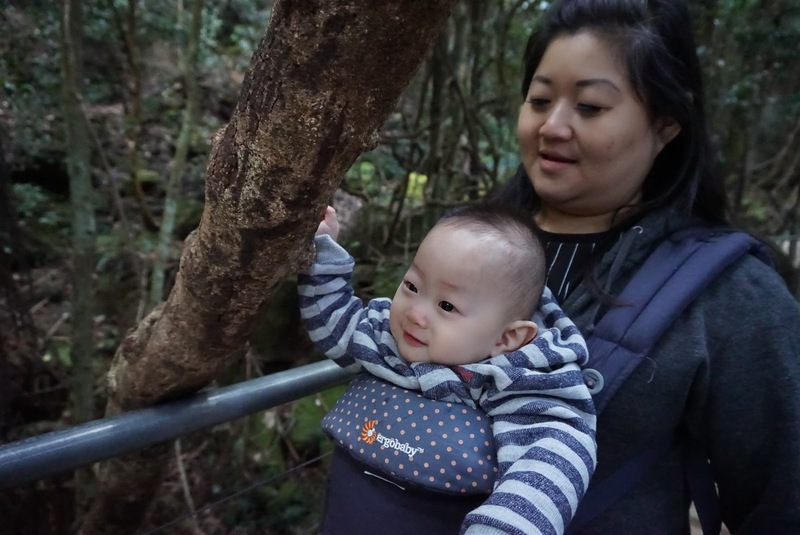 My nephew seem excited about the forest walk. 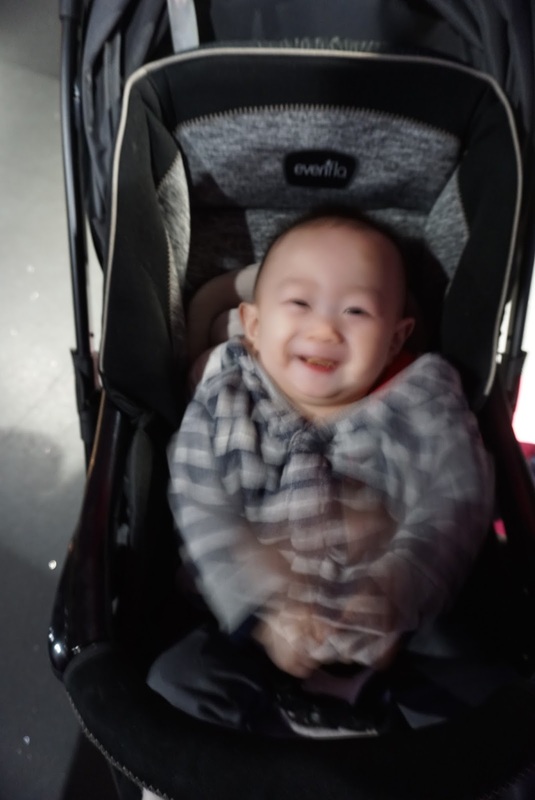 He was smiling and very curious about the things around him. We passed a closed mine shaft, that used to be an entrance to the coal mine. 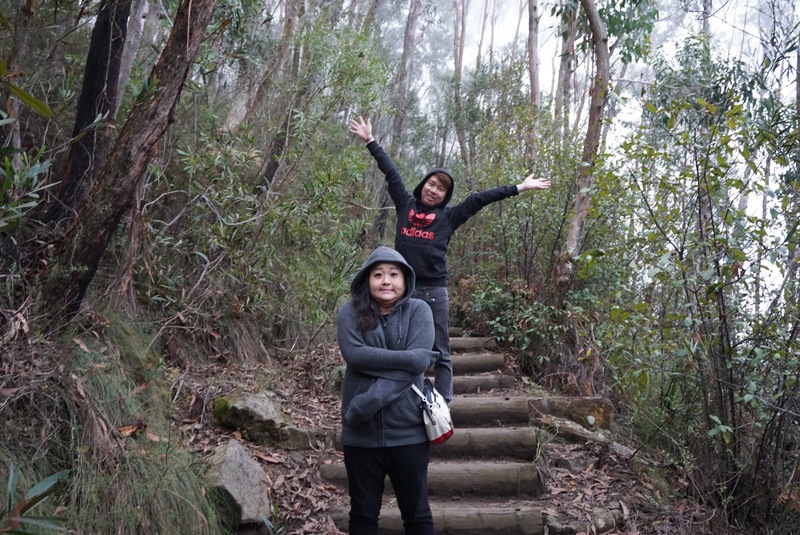 These days it is a tourist spot that served for photo opportunity for tourists. Further down the path, there is another bigger entrance to the coal mine. Despite being unsealed and armed with a sign saying “Danger Keep Out”, no one seem to be entering the coal mine. 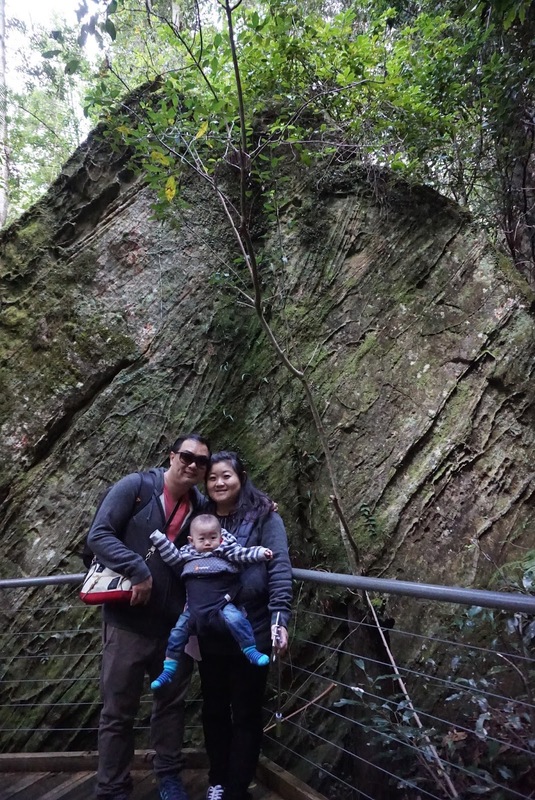 Along the path we felt as if we are in scene in Jurassic Park, the forest seem as old as time and cliffs that seem to be sheared off by a giant sword, with its near vertical cliff face. A rock sitting on the side of the pathway that seem to be nature’s creation. Very soon we found ourselves at the Cableway Bottom Station. The Cableway was just calling into the station when we reached. 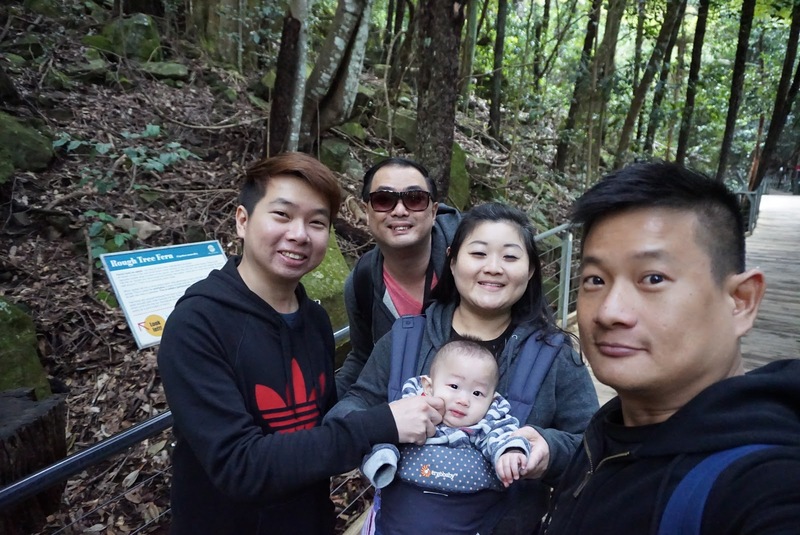 We boarded the Cableway and journeyed 510m to the Scenic World Top Station, where we started. 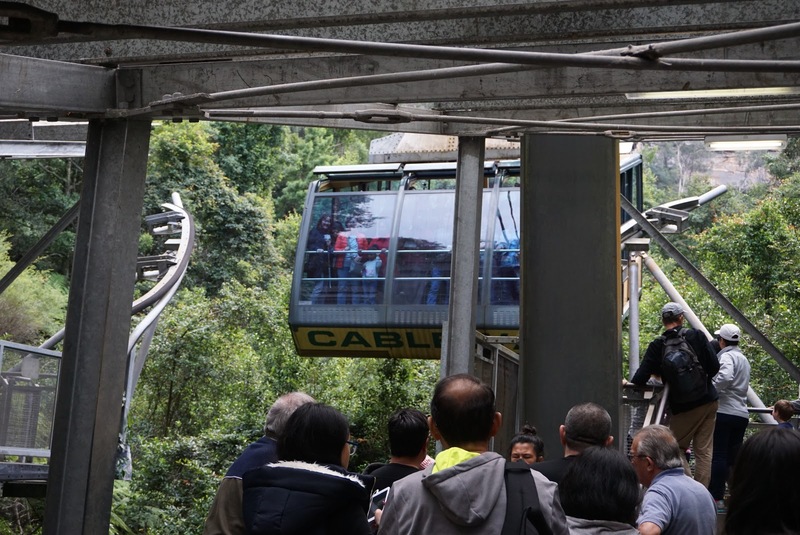 The Cableway is a huge cablecar that is designed to ferry passengers up and down the valley. 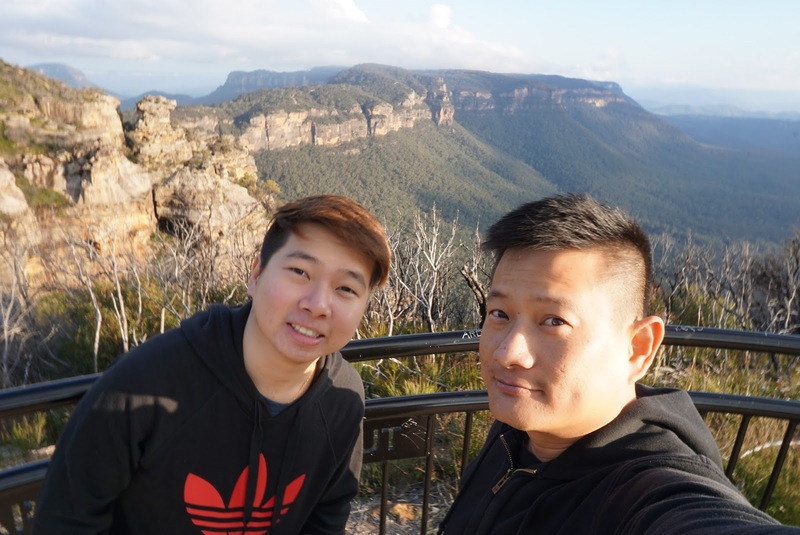 The cableway is less thrilling than the Scenic Railway, however the 10 min journey allowed us slowly enjoy this scenic part of Blue Mountains. 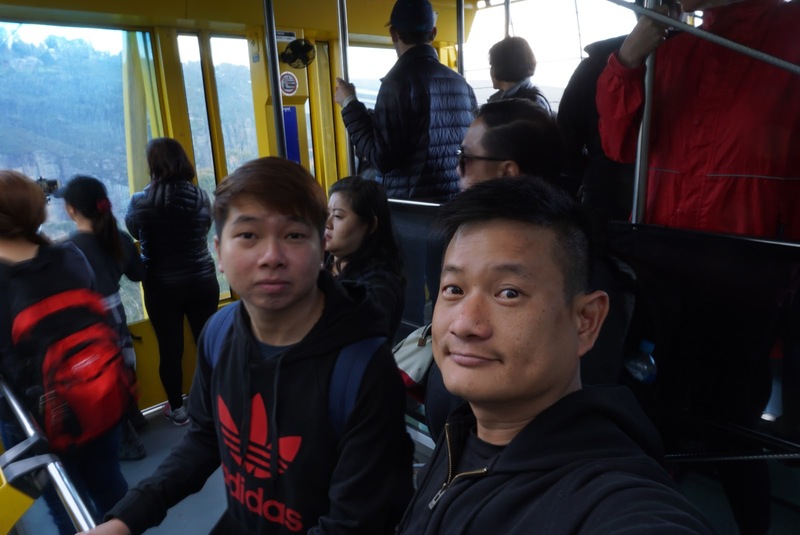 While the Scenic Railway dashes us through the rainforest cliff, the Scenic Cableway gave us a bird’s eye view of the entire valley as we ascended in it. 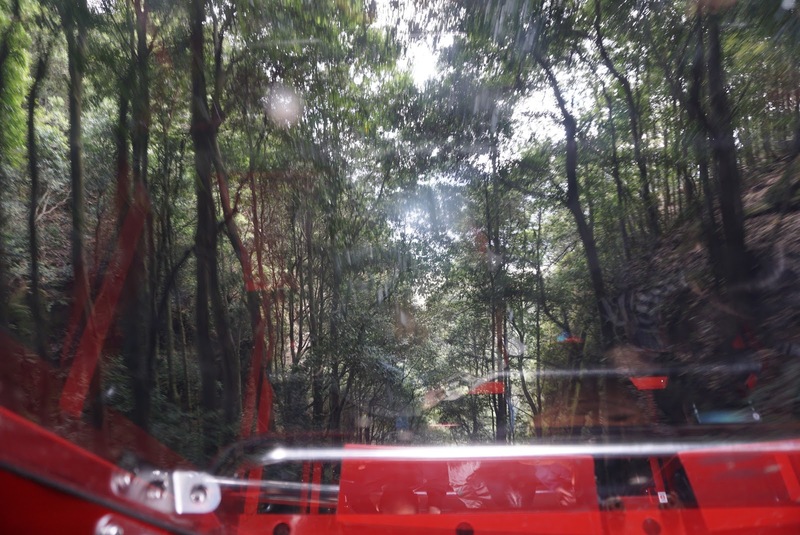 We were above the canopy of the rainforest that we were in just minutes ago. All this while, we had the Three Sisters constantly in our sight. 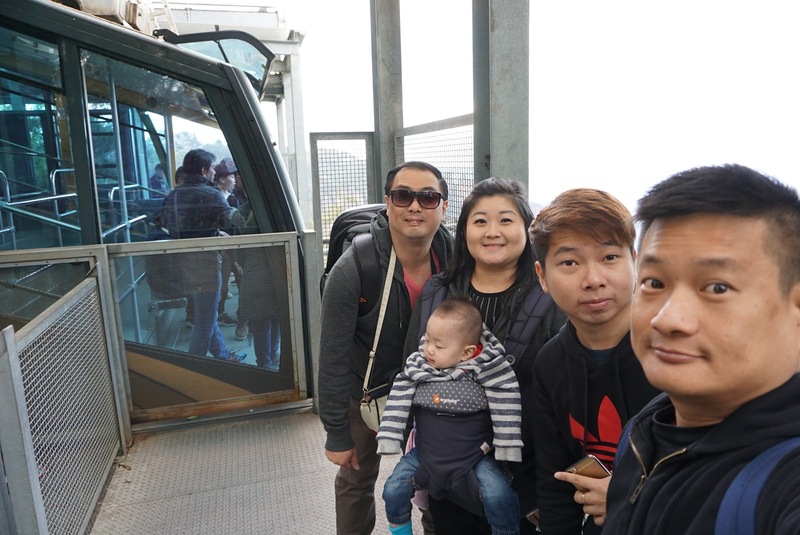 At the side of the Cableway, we seem to be narrowly passing the cliff, as though we can almost touch them if the windows are opened (well it is not exactly that close). 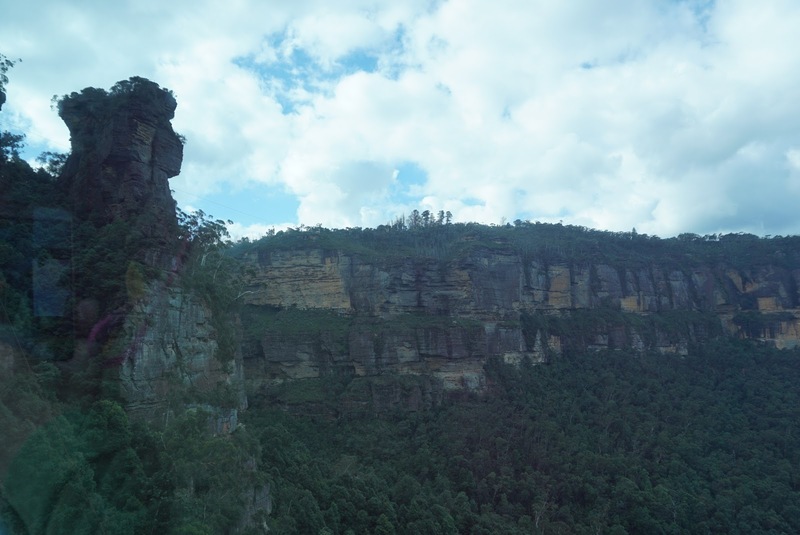 As we approach the top station, the staff in the Cableway, who has been giving commentaries about the Blue Mountains, suddenly announced a lone rock that we will be passing by, known as the Orphan Rock. The staff mentioned that there used to be a trail that leads to the top of the Orphan Rock, a wedding has even being held there. 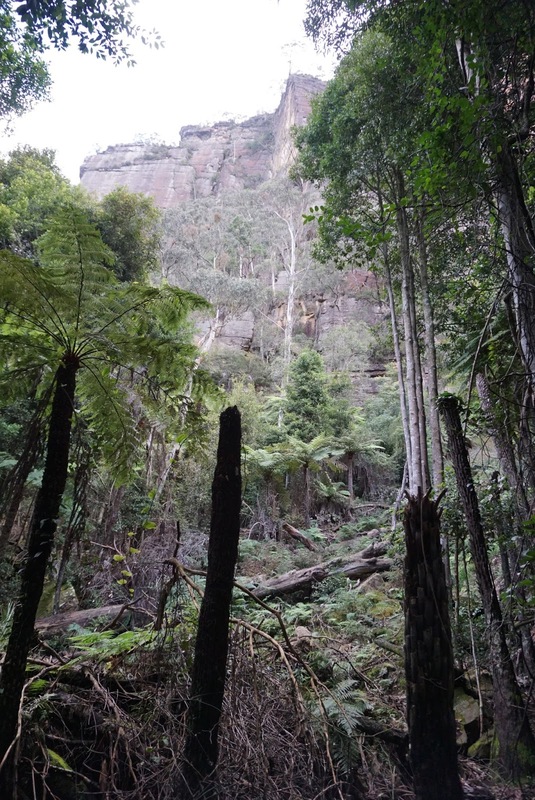 However due to corrosion, the trail to the top of Orphan Rock is closed. Nearing to the top station, I spotted some rail tracks. 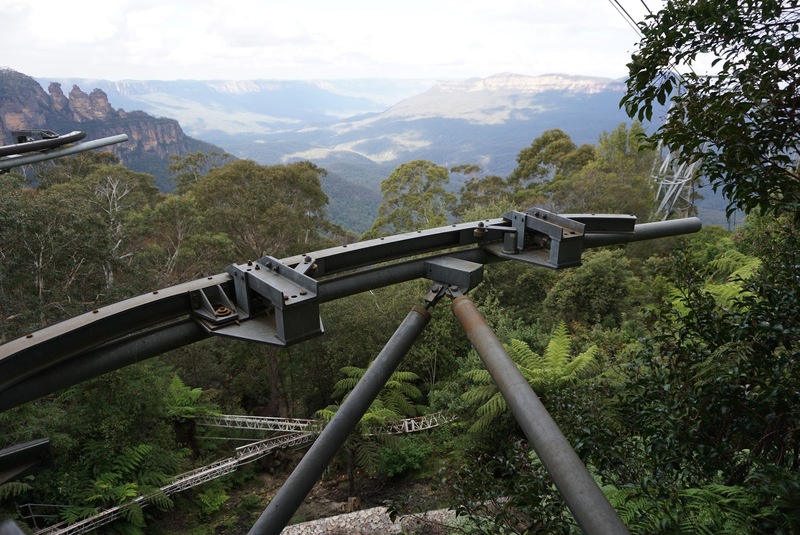 These are supposed to be a roller coaster ride that used to be one of the attractions here in Blue Mountains and has since closed in 1982. 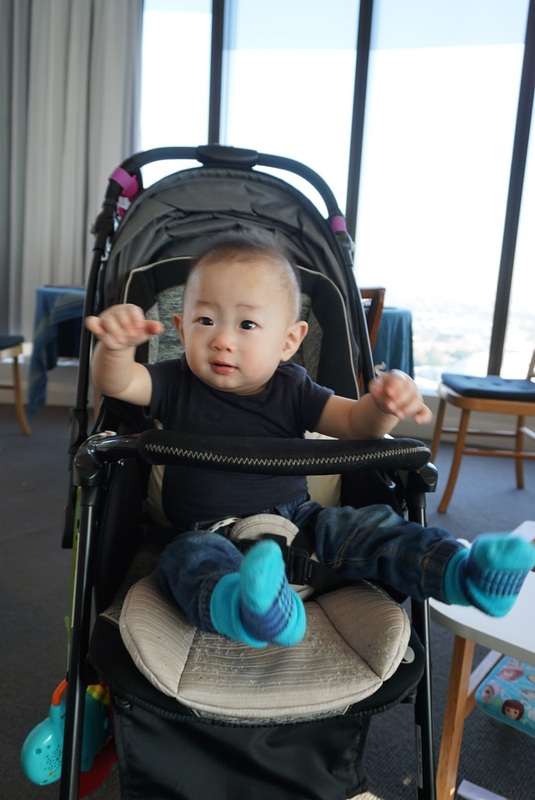 The Scenic Cableway is Wheelchair and pram friendly too. 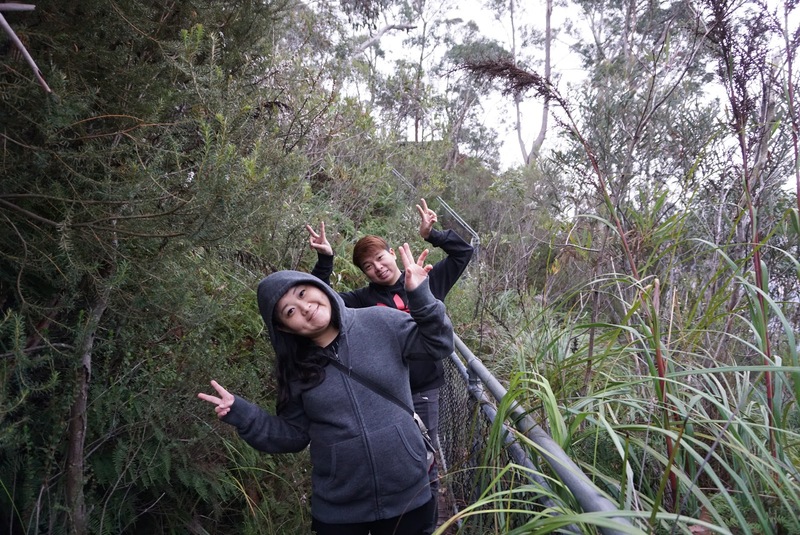 After having lunch at the Scenic World Top Station, we went for the Scenic Skyway next. 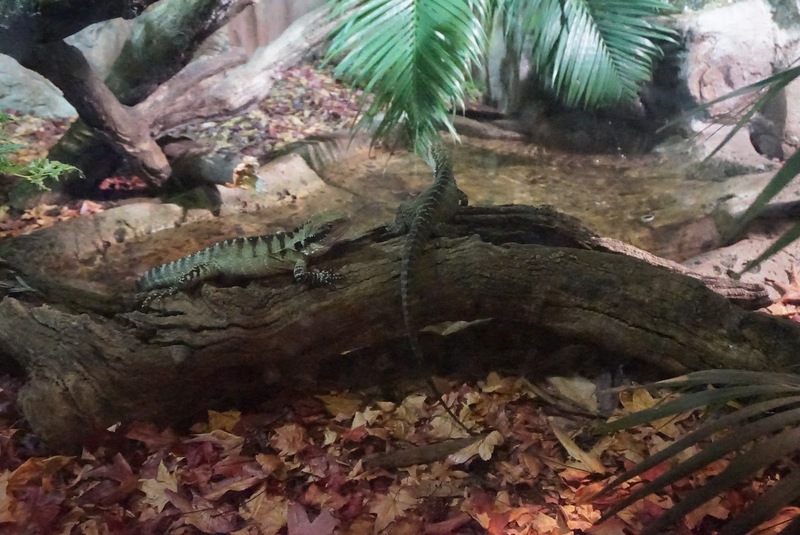 I have been to Scenic World more than 15 years ago. 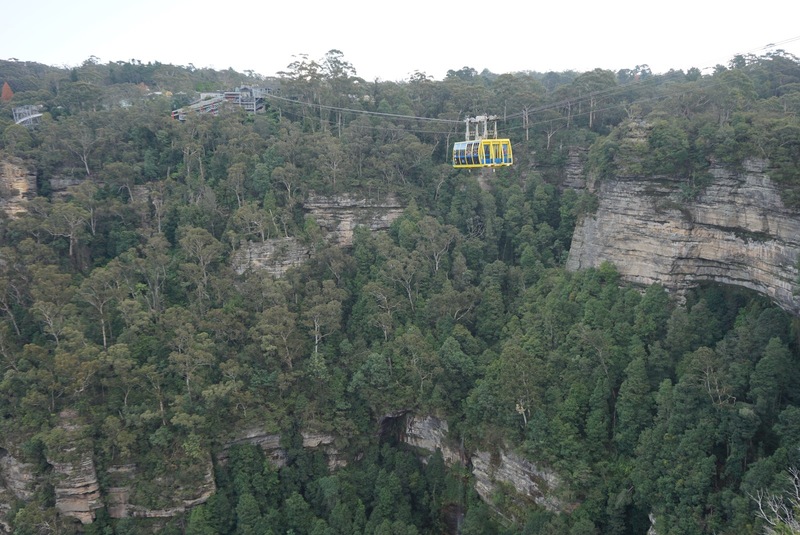 I recall the Scenic Skyway used to pull us out halfway to where the Katoomba Waterfall is and than back to the Top Station. Fast forward 15 years later, another station has been built on the other side of the cliff. 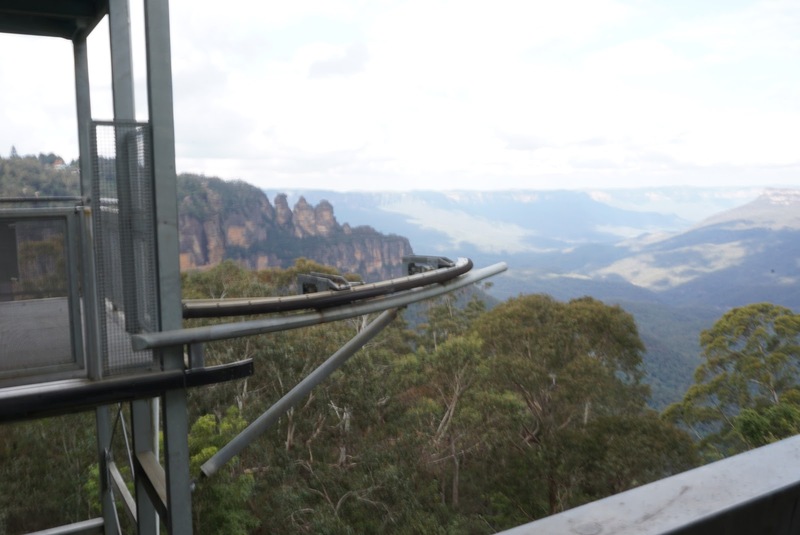 These days the Scenic Skyway brought us to the Skyway Eastern Station, where we can view the Blue Mountains from another angle. 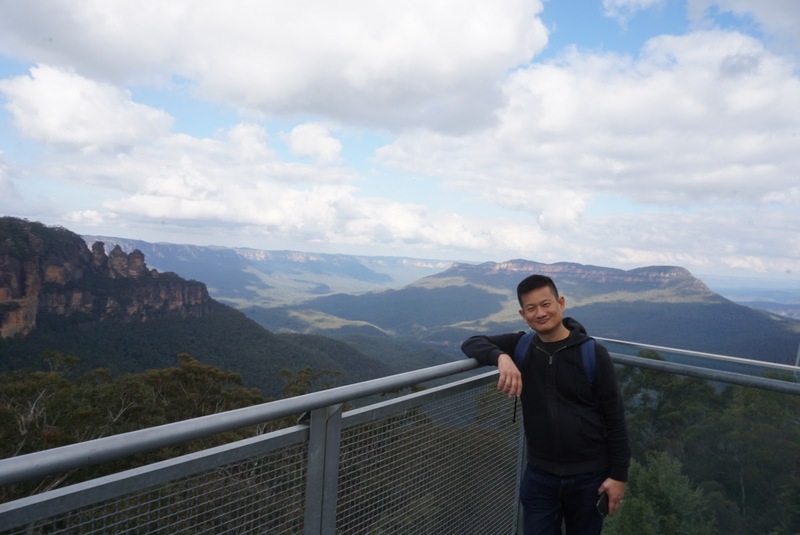 As the skyway leaves the station, I felt we are like an eagle soaring up the sky, viewing the entire Jamison valley region in the Blue Mountains from the sky. 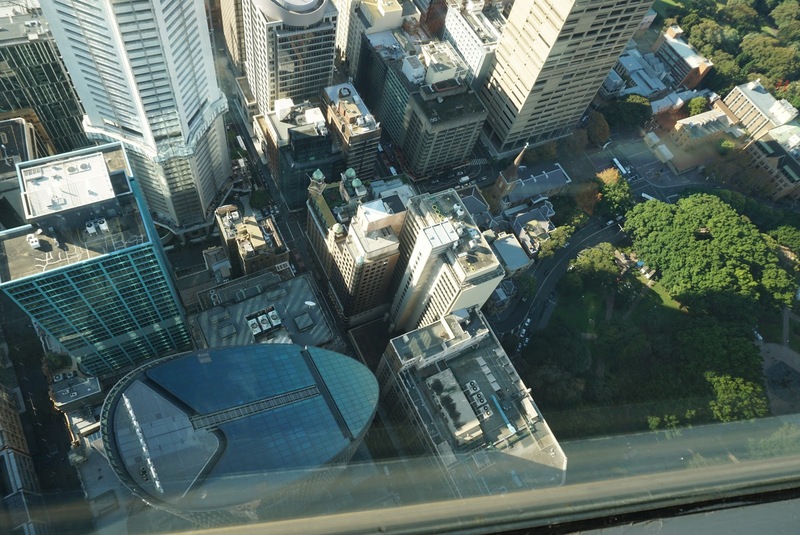 The centre of the Skyway is a panel of glass that allows passengers to step on and view the valley from high above. 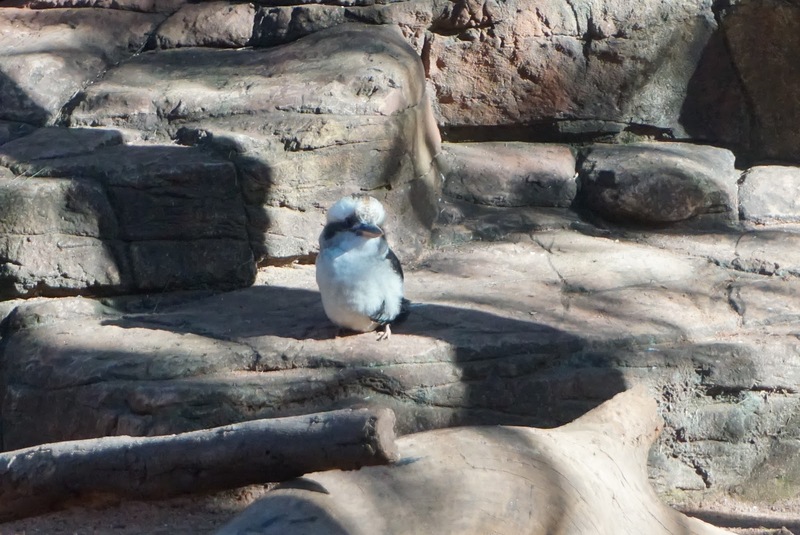 Sitting solemnly afar, rising up from the grounds is Mt Solitary. Once at the Eastern Station, we took the short trail to the left, leading us to Cliff View Lookout, which is about 5 mins walk from the station. 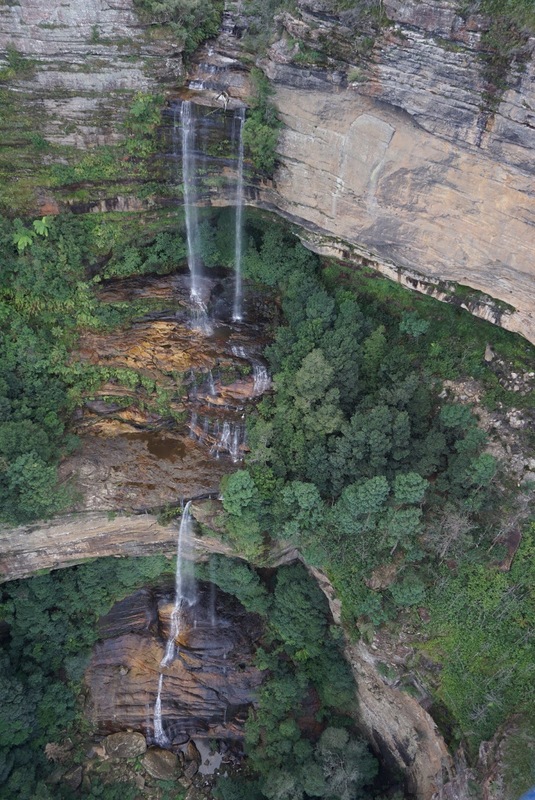 Here we can see Katoomba Waterfall on the right, with a relatively small stream of water falling 300m into Jamison Valley and Mt Solitary. 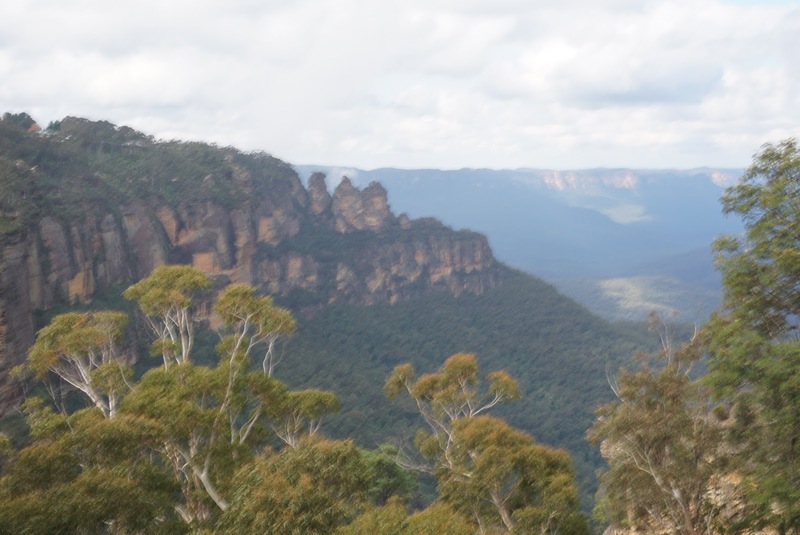 The view of Three Sisters is obscured from Cliff View Lookout. 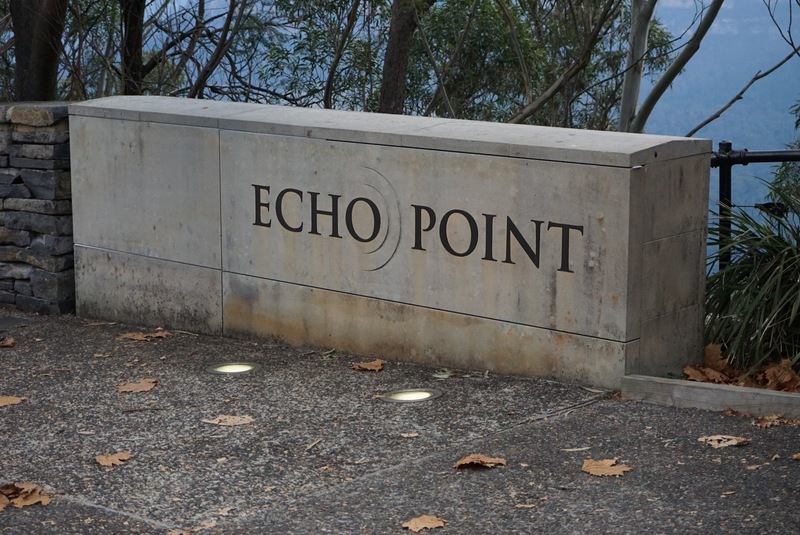 There is a trail that leads to Echo Point which takes about 45mins walk, while it will only take us 5 mins to drive there. We took the latter option. 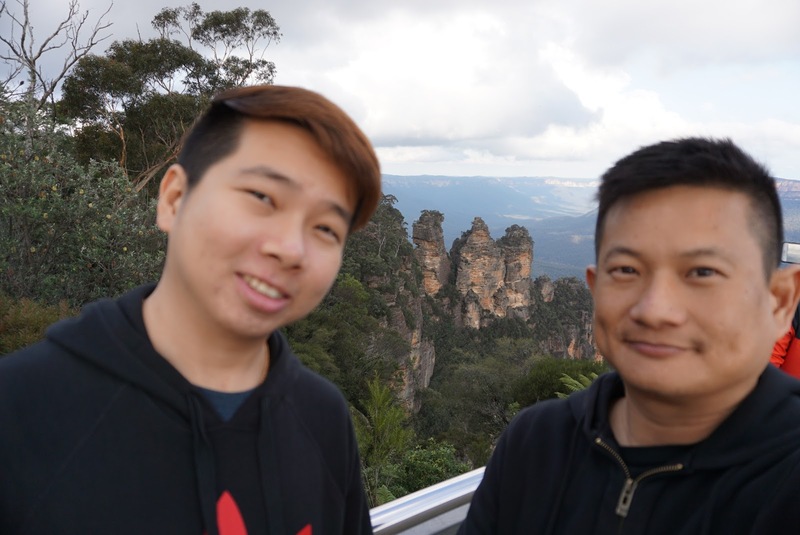 After some photos, we headed back to the Skyway East Station and took the next skyway back to Scenic World Top Station, where we drove ourselves to Echo Point. 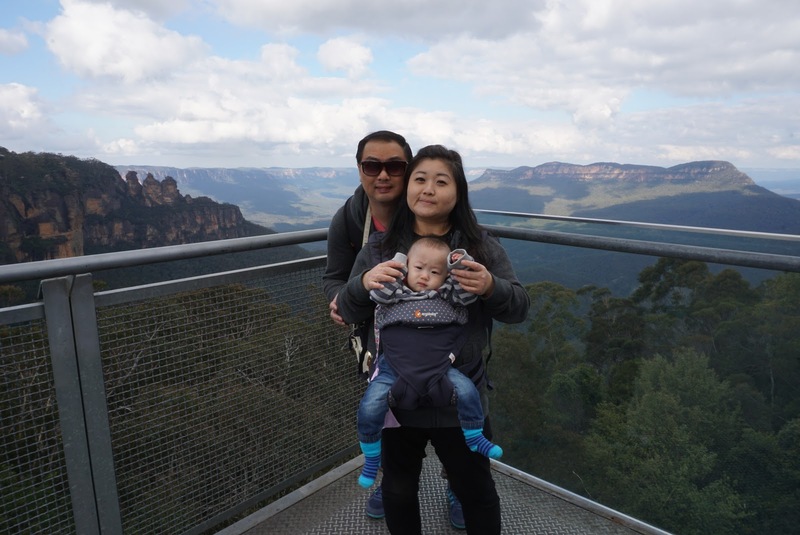 Echo Point Lookout offers the best up close view of the Three Sisters. 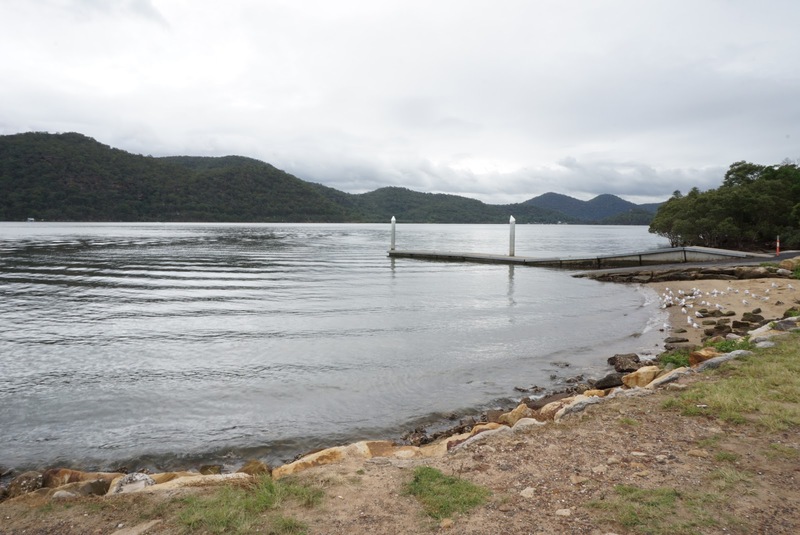 Just a 5 mins drive from Scenic World, it did not take us long to reach Echo Point Lookout. Legend has it that a witchdoctor turned 3 beautiful sisters into stones to prevent a warring tribe from forcing them into marrying into the other tribe. However the witchdoctor died before he can turn the sisters back to human. 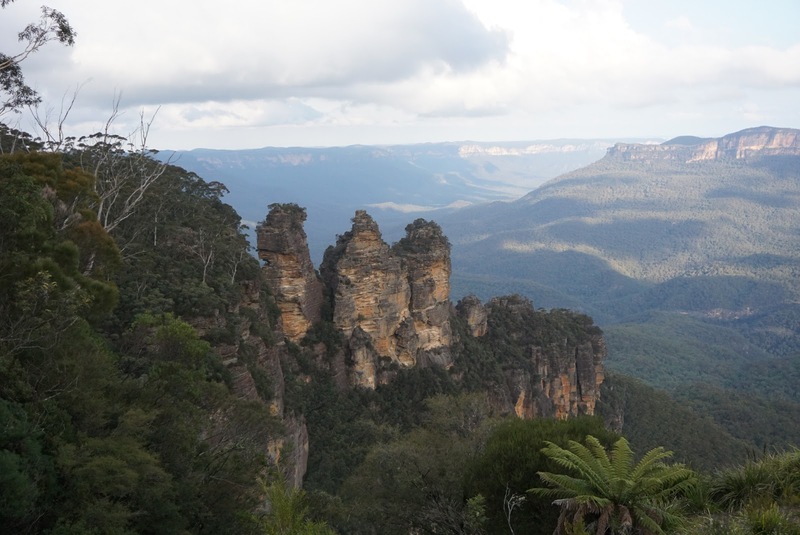 To this date, the Three Sisters sits on the cliff waiting for someone to turn them back into their human form. 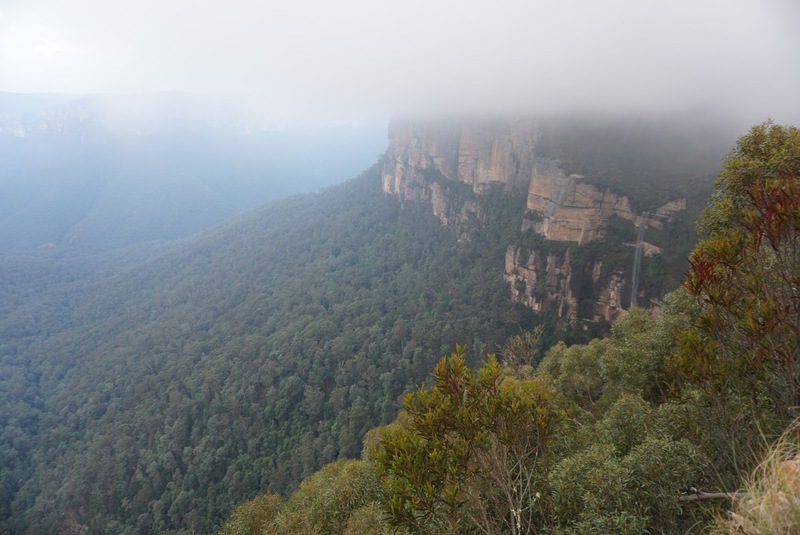 The Three Sisters are 3 cliffs that sit on top of the north escarpment of Jamison Valley. 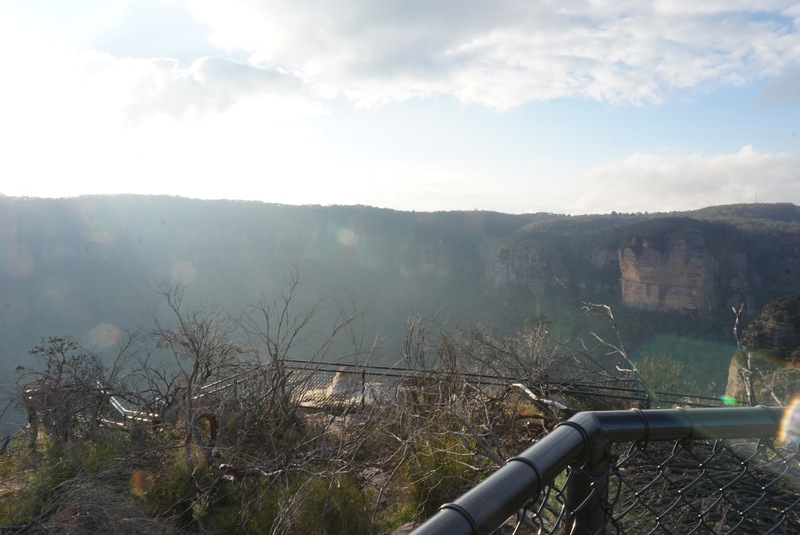 Visitors can take a short walk to the lookout below for a closer view and photo spot with the Three Sisters. It can get crowded here with bus loads of tourists here. 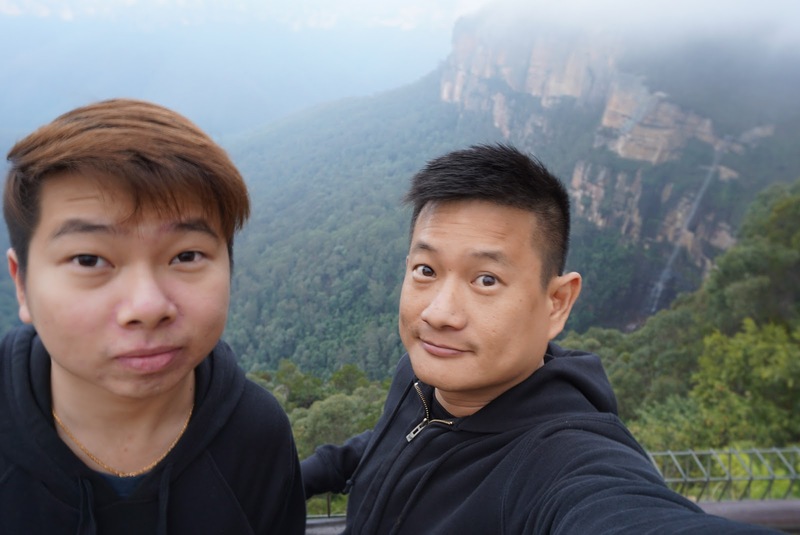 We did not stay here for too long and continued our journey to other parts of the Blue Mountains. 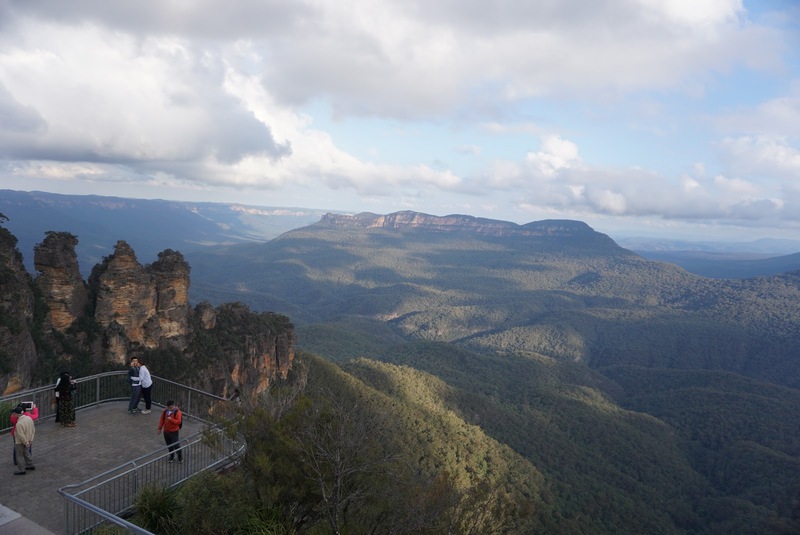 For most of the visitors, their trip to Blue Mountains will end at Scenic World and Echo Point Lookout. 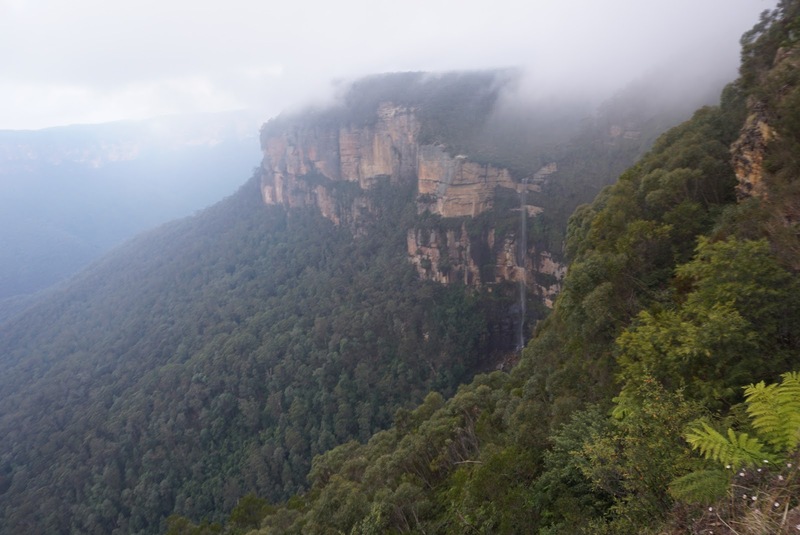 Blue Mountains has a lot to offer (if one travels here via driving). 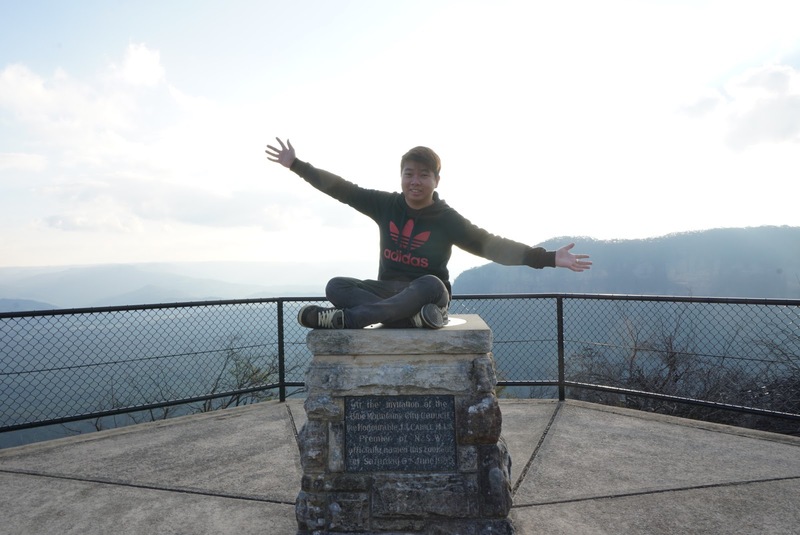 Our next destination is Boars Head Lookout and stopped by a couple of lookouts before that. 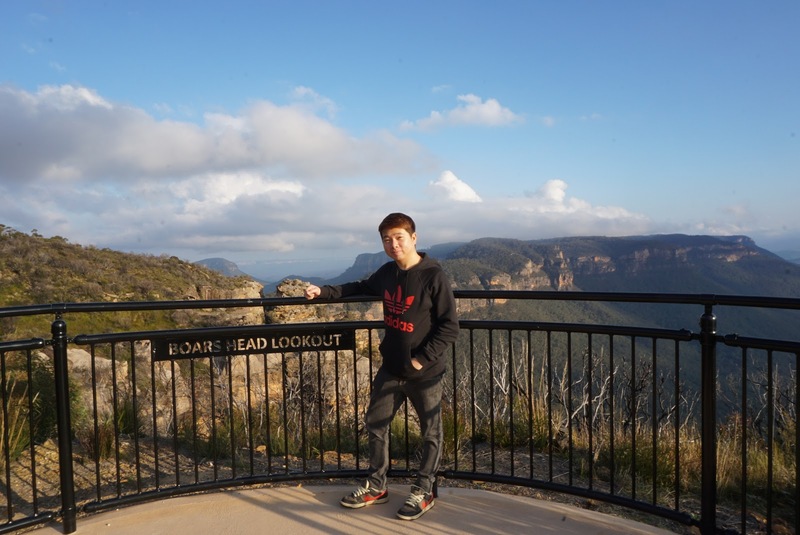 The first 2 lookouts that we stopped by, Eaglehawk Lookout and Narrow Neck Lookout, while offers views of the Jamison Valley from another perspective, the view isn’t that great. There are no proper parking spots for cars and the views are obscured. 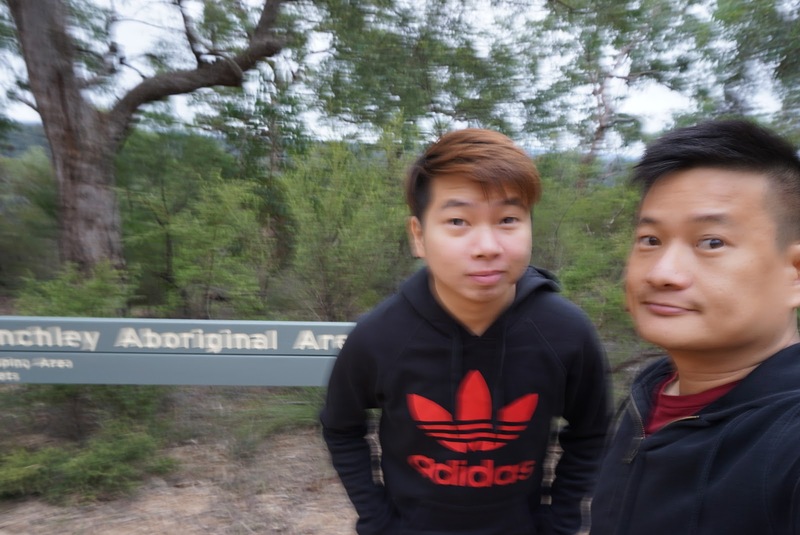 We snapped a few pictures before heading to Cahill’s Lookout. Soon we arrive at Cahill’s Lookout. 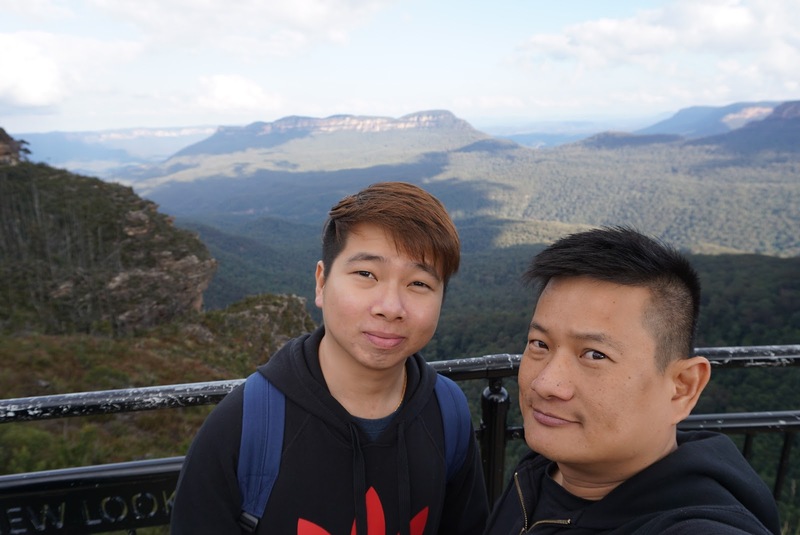 After parking the car, my friend and I headed to the lookout (my sister and her family was too tired to join us on the 3 min walk to the lookout). 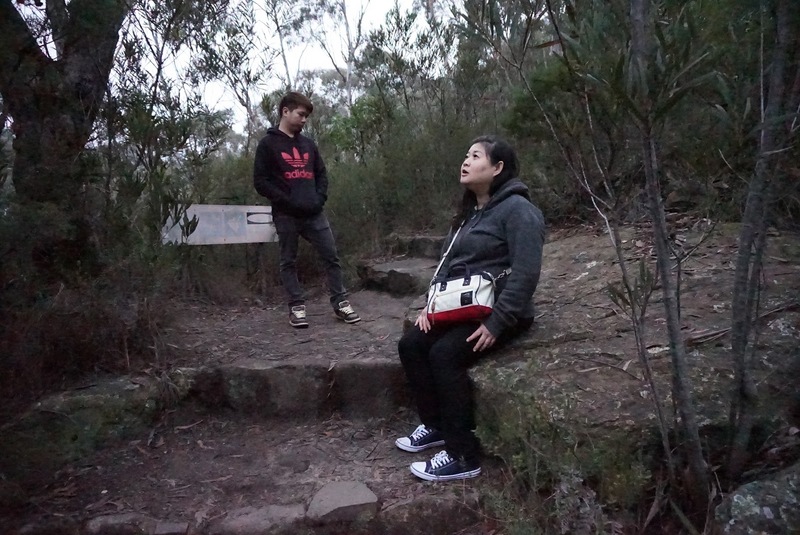 While walking to Cahill’s Lookout at which lies at the end of the pathway, we stopped by Boars Head Lookout. The view at Boars Head Lookout is magnificent! 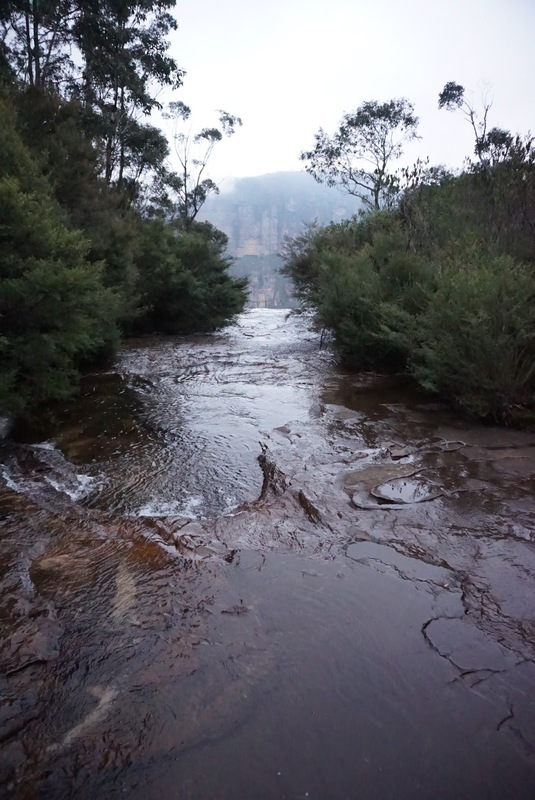 It offers a different view of Blue Mountains, other than the already popular Three Sisters and Jamison Valley. 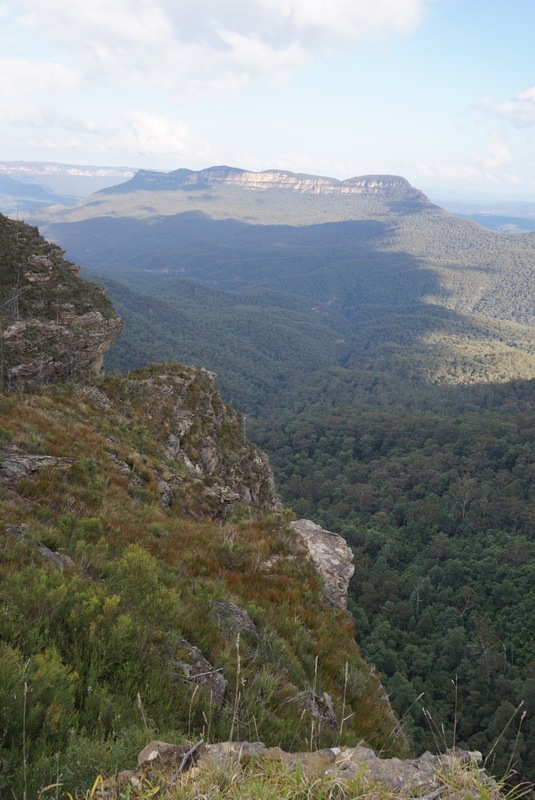 From Boars Head Lookout, we spotted the Narrow Neck Plateau that separates Jamison Valley from Megalong Valley. 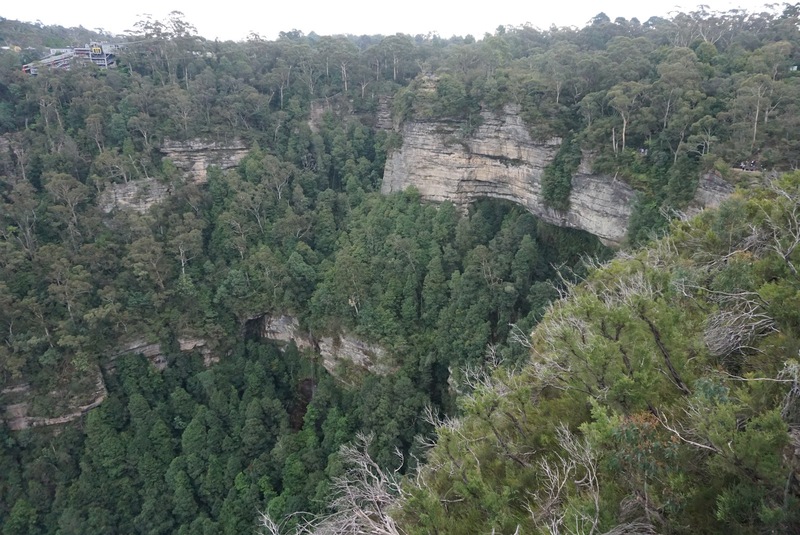 The Narrow Neck Plateau looks like the body of a dragon lies in deep sleep. The land below us seem to stretch to the end of the earth. 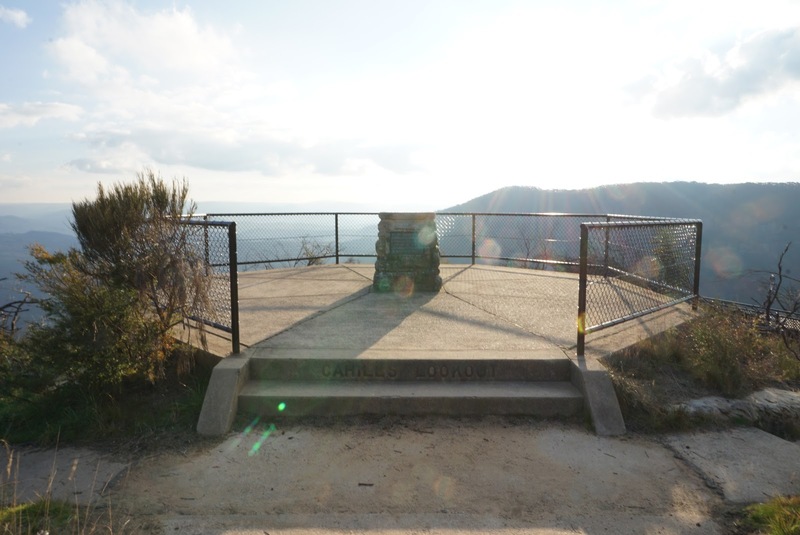 We continued our walk to Cahill’s Lookout, which is an octagon platform that looks out into Megalong Valley. 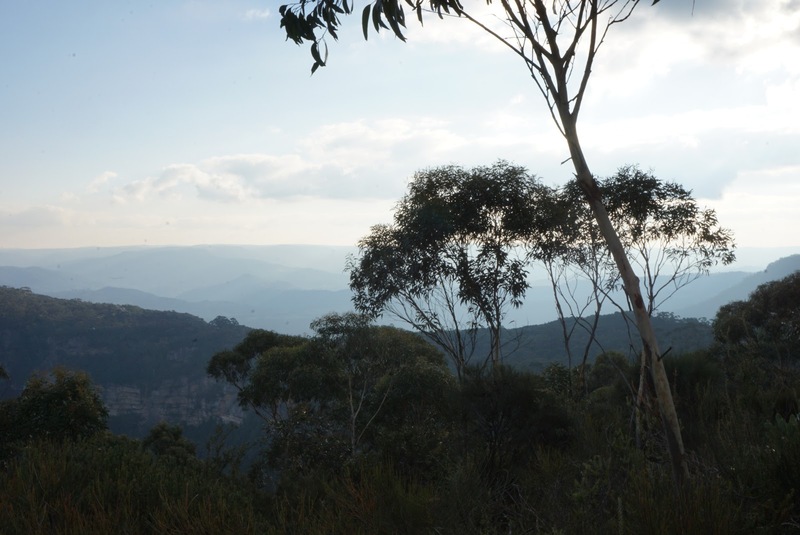 The views here is no different from that of Boars Head Lookout, except that we were able to see the cliffs off Pulpit Rock and Bonnie Doon Waterfall. As the sun is setting, we still have another spot to head to, my friend and I headed back to the car and continued our journey to our last stop of the day. 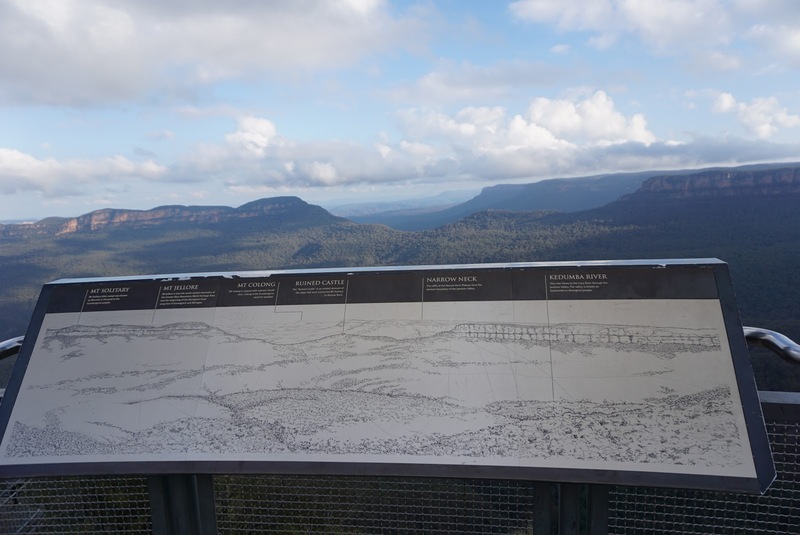 The drive to Govetts Loop Lookout takes about 45 mins from Katoomba, where the Three Sisters is located. To get there we passed by the town of Blackheath. There are signs well placed to point drivers to Govetts Loop Lookout. 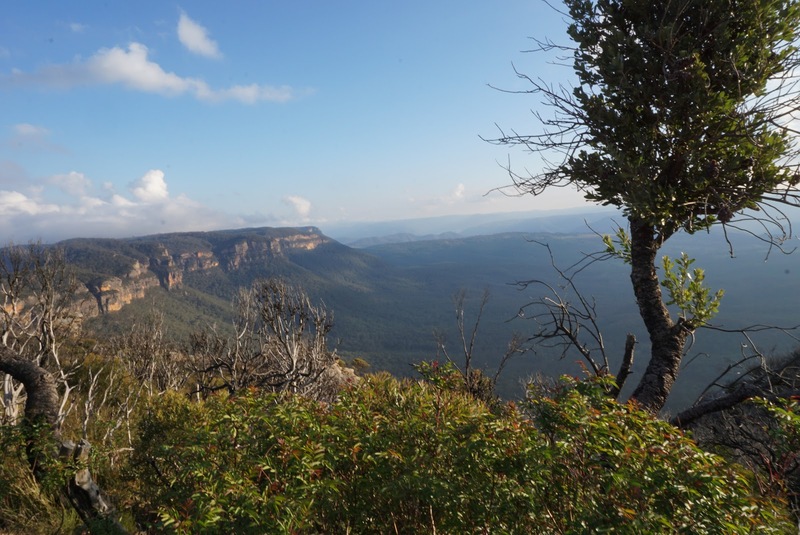 Govetts Loop Lookout offers views of the Grose Valley. Due to the low clouds, the view here looks mystical, as if it is nothing from this world. The view here felt a little like Pandora, the homeland of the Na’vi from the movie Avatar. 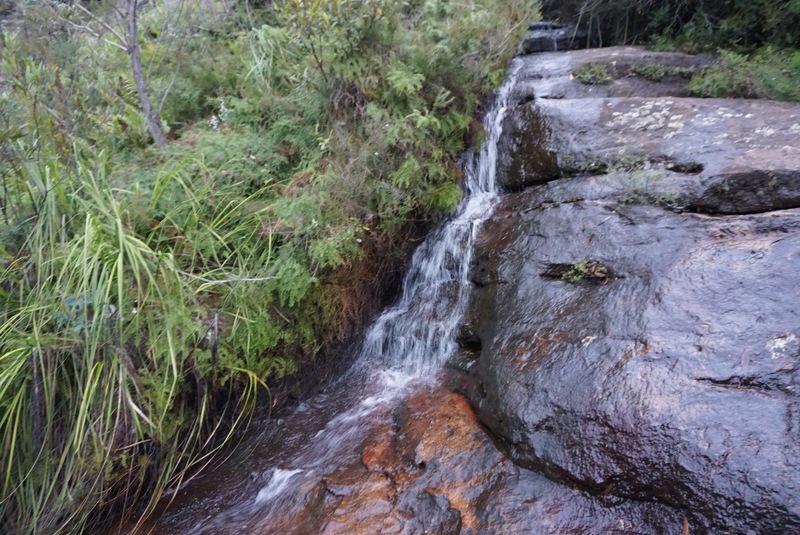 From the lookout we can see a waterfall – Govetts Loop Falls. 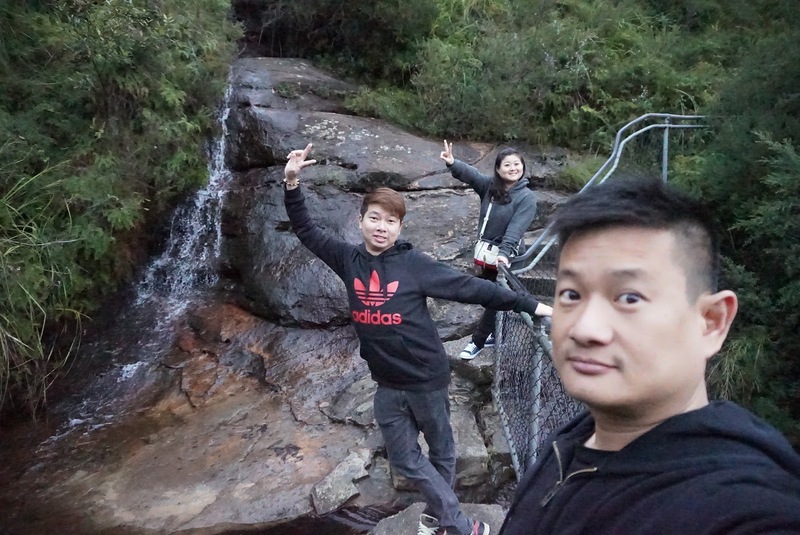 Since it is our last day in Sydney and our last stop of the day, my sister, my friend and I decided to take the 30 mins walk to the top of Govetts Loop Falls. 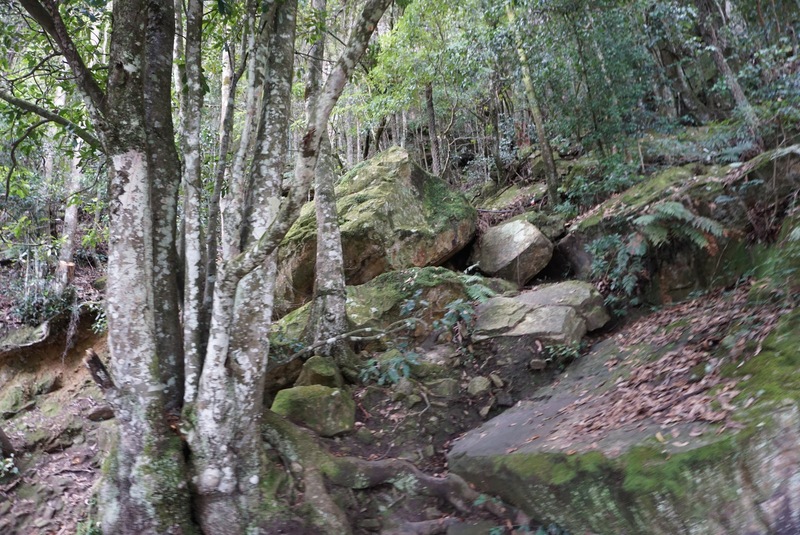 The walk to Govetts Loop Falls is downhill. The initial walk was gentle, there come a point where there are stairways carved out of the soil and at some more dangerous points railings installed to ensure the safety of trackers. 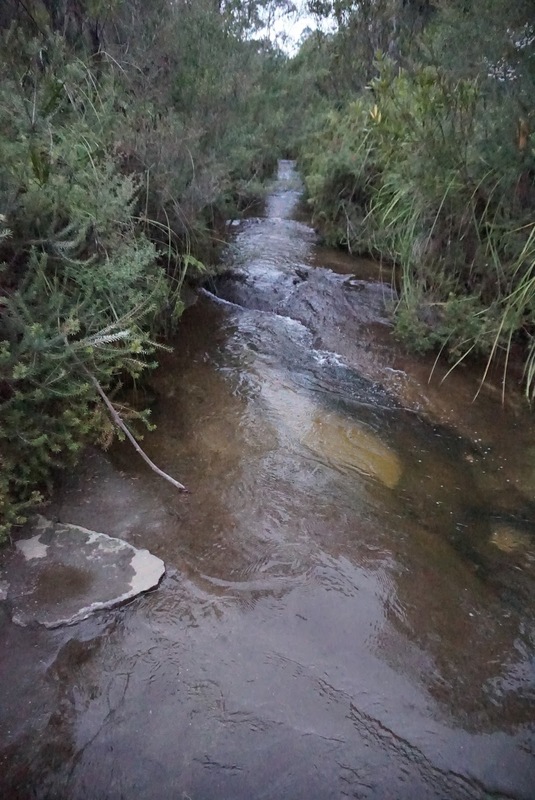 As we were walking, the sound of water appears to be closer. Not longer after a series of down “stairs” walks, we knew we arrived at the top Govetts Loop Falls. The view here isn’t that great, as the “lookout” is not overlooking into the valley. Rather we were treated to a view where the stream falls into the valley. 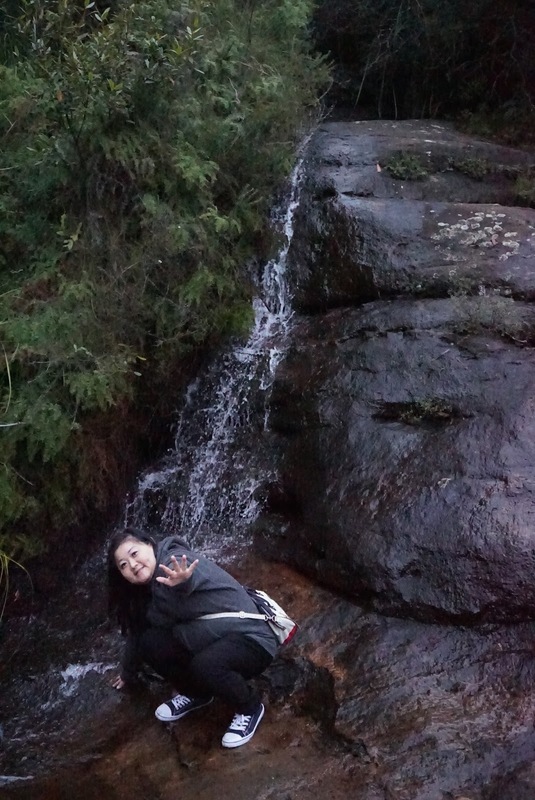 There is a smaller waterfall on the side where we came from, with gentle streams flowing from the rivers on top. At the other side of the stream, we saw part of the Govetts Loop Brook that seem to come from a forest on top of the waterfall. 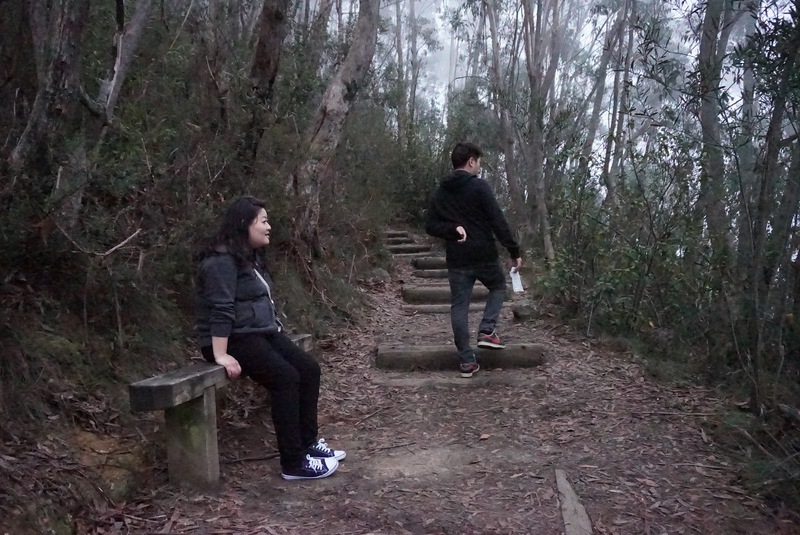 After taking some pictures, we traced back our steps from where we came from and headed back to the car. 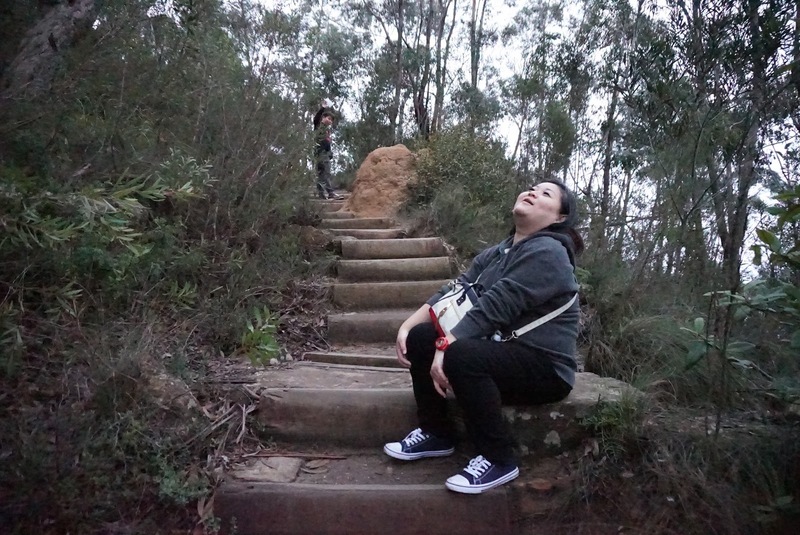 The walk back to the car park can be tiring for some as it comprises a series of stairs to climb up. 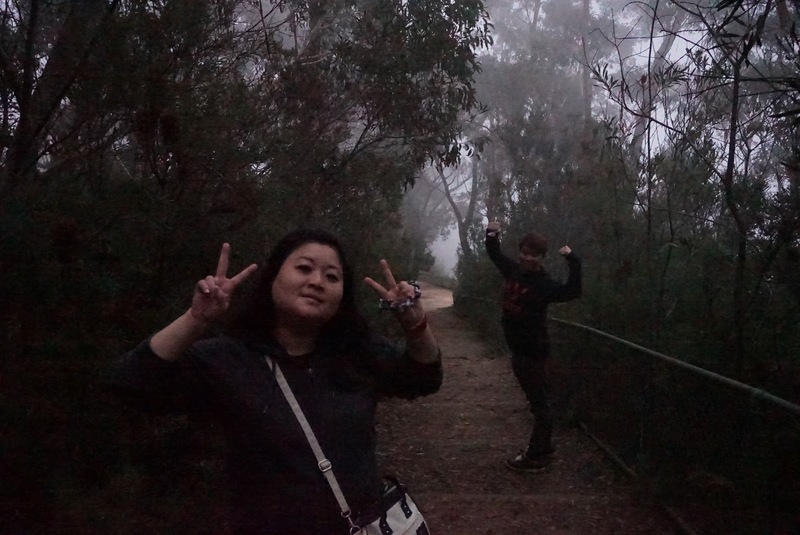 We made it back to the car before the sun sets and were on our way back to Sydney. 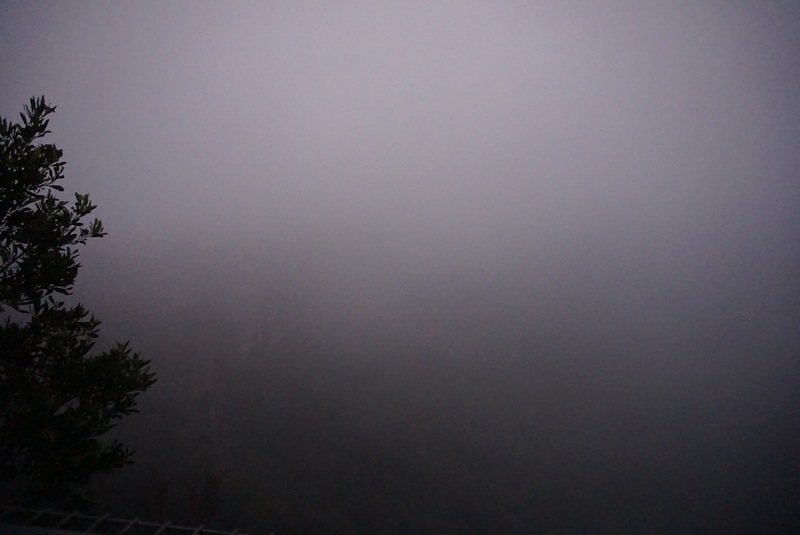 As we were driving out of Govetts Loop Lookout, the clouds are so low that the entire area fogged up. The drive back to Sydney took around 2 hours. 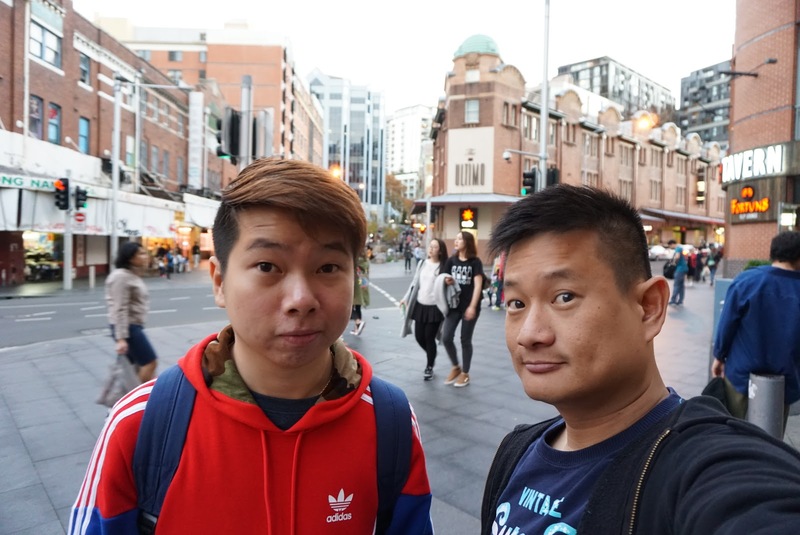 We headed back to Chinatown in Sydney for a well deserved dinner after a whole day at Blue Mountains and a way to end our trip to Sydney. 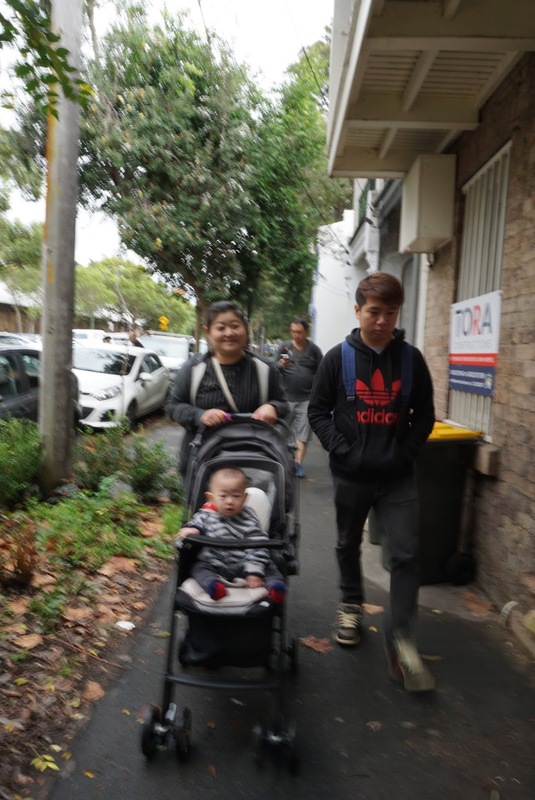 We headed back to our accommodation early to pack and rest as we fly out of Sydney the next morning. 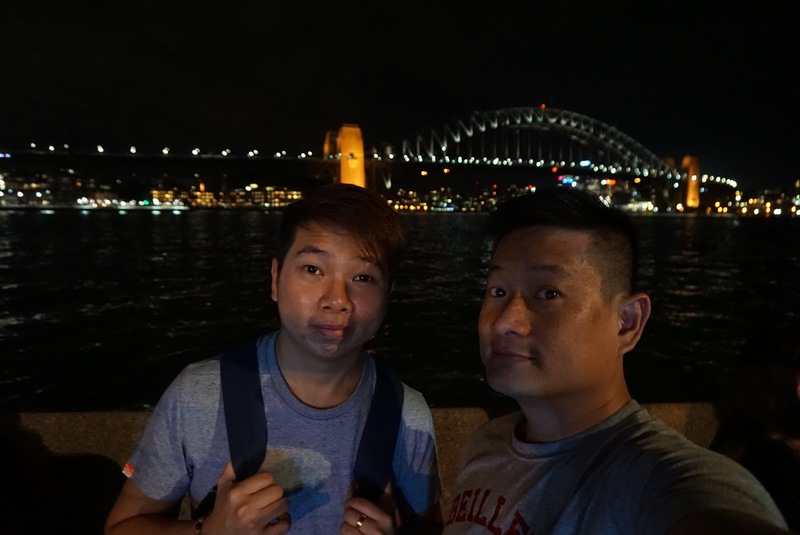 There are more places to Sydney than those we visited, given essentially only 5 days in this city, we visited most of the icons of the City. Our itinerary is pretty light today. 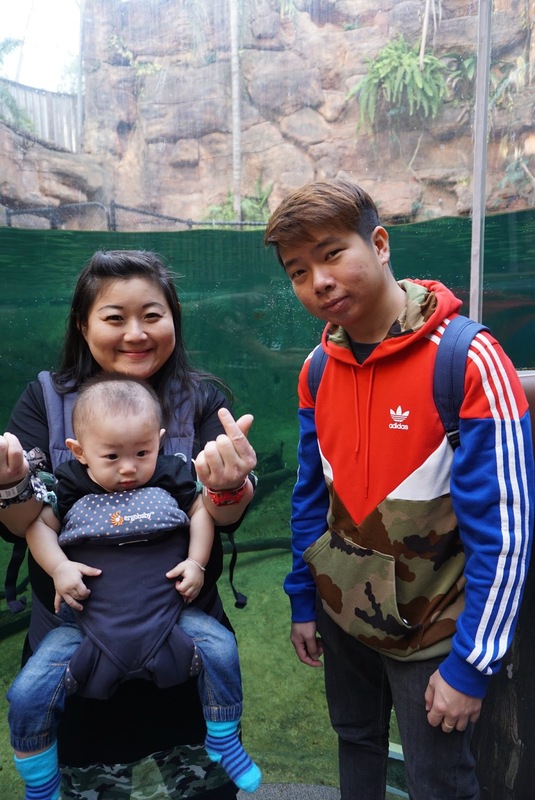 We visited the sights in Sydney and catered some time for shopping around town.Our first stop for the day is the Sydney Wildlife Zoo, located in Sydney’s Darling Harbour a 25 mins drive from Sydney Olympic Park. 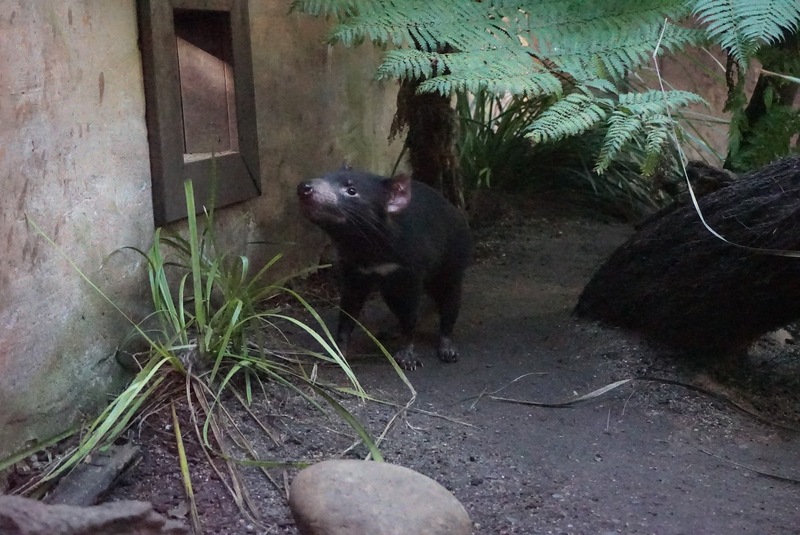 There are 2 other attractions in this area on top of the Sydney Wildlife Zoo. 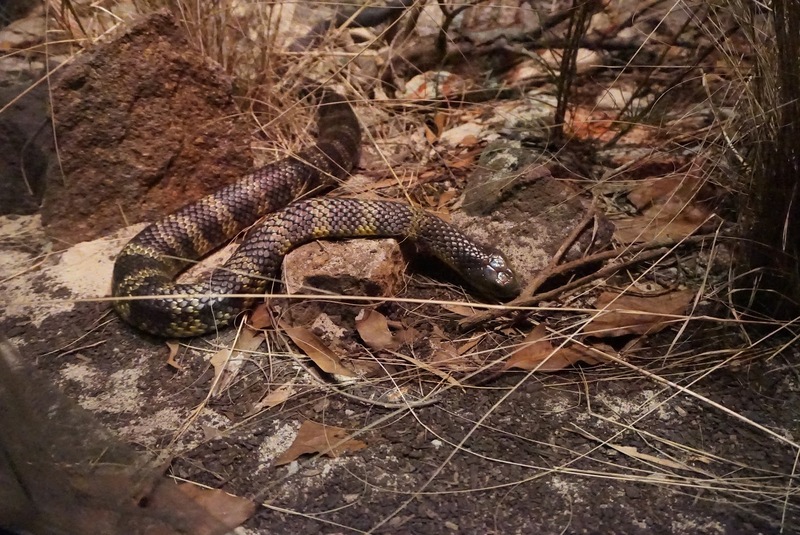 The Sydney Aquarium and Madam Tussauds are located in the vicinity. 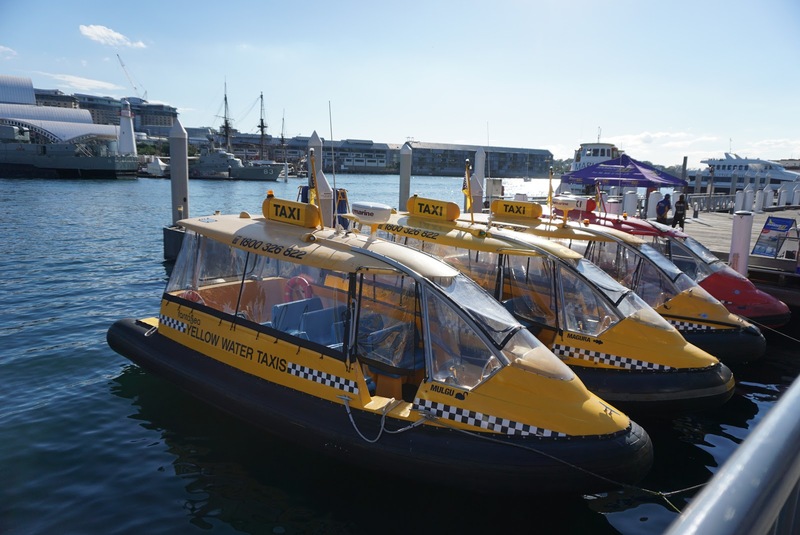 One can consider getting the multi attraction pass and visit these attractions at one go to save time and money. We used the same attraction pass that was issued to us the day before to gain entry. 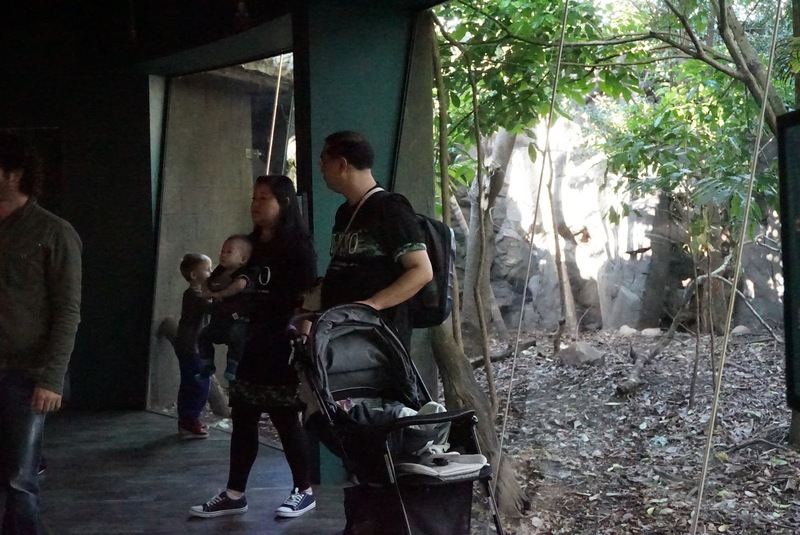 Sydney Wildlife Zoo is rather small housing in a building occupying a total space of 7,000㎡. 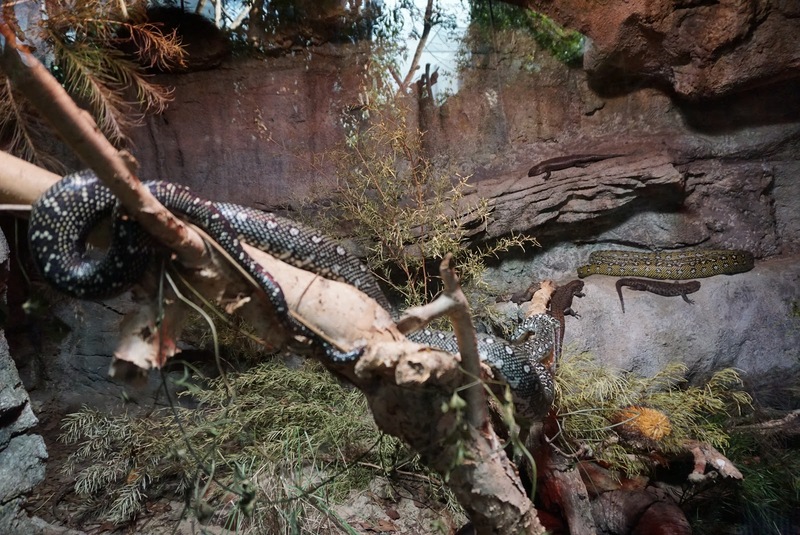 The wildlife park has a 1 km walkway that snakes through the entire Wildlife Zoo, across all 6 zones. 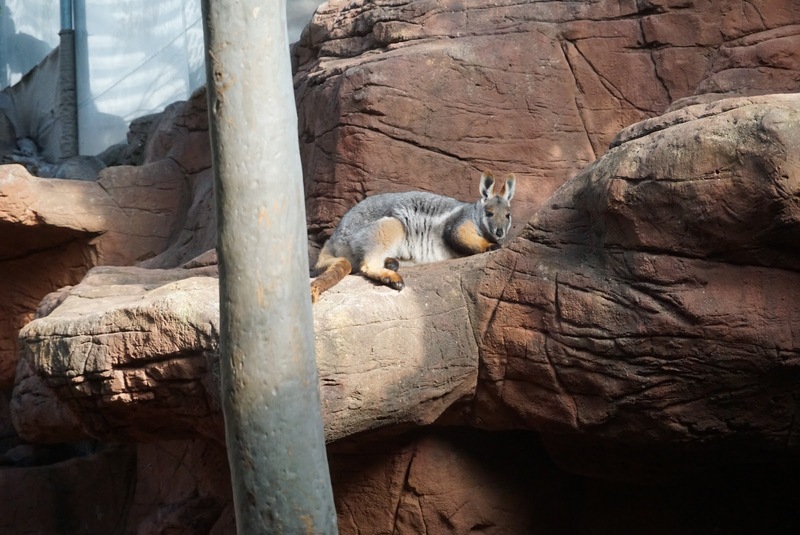 All the animals housed in the wildlife park are found in different parts of Australia. 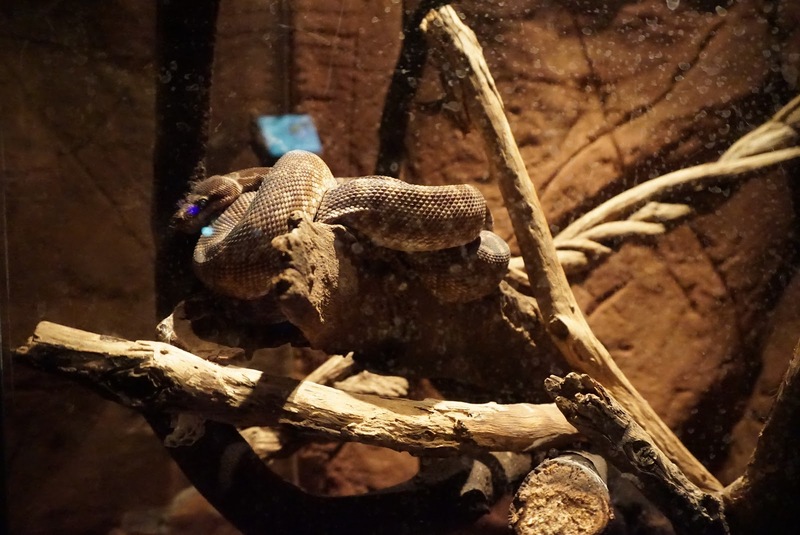 The first few exhibits are snakes As the park is rather small compared to most other wildlife parks, it only took us about 1.5 hrs to finish the entire park. We spent about 10 mins listening to one of the staff educating us on the habits of koala bear. 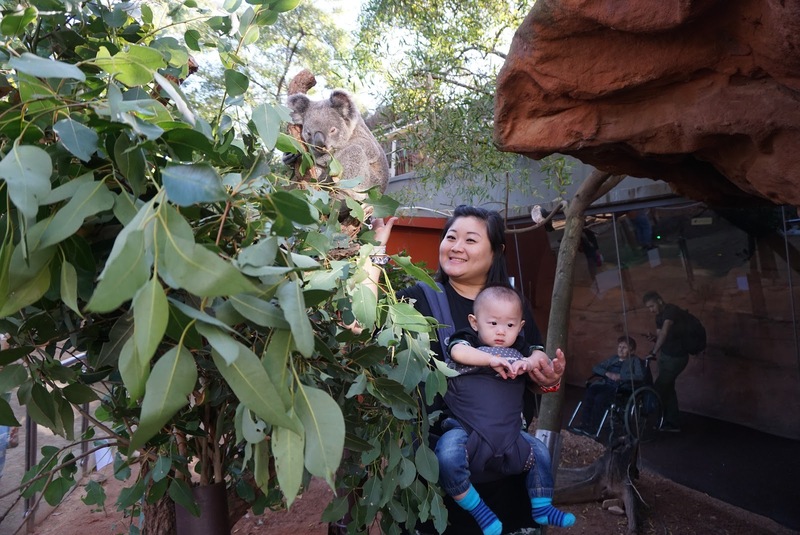 My sister bought a photo opportunity with the koala, instead of holding the animal taking pictures, they only managed to take picture with the koala at a close distance. We felt she was kind of being ripped off by the park. 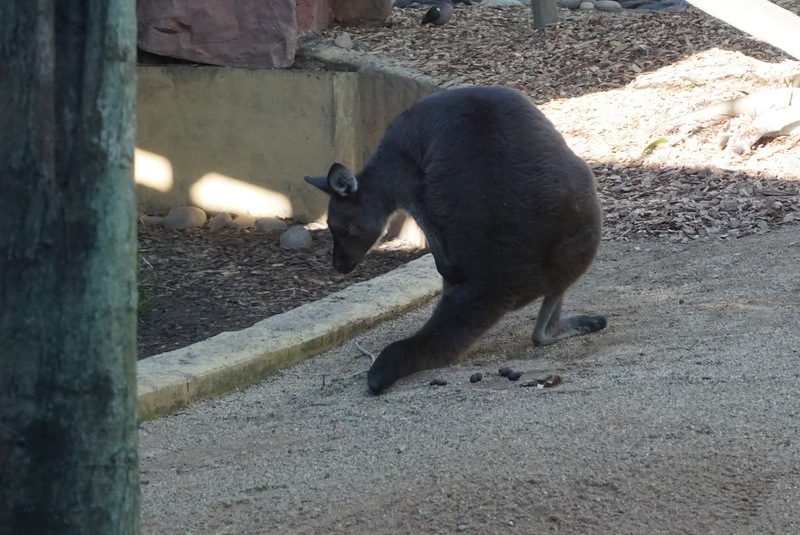 There is a Kangaroo petting area, which is rather small. 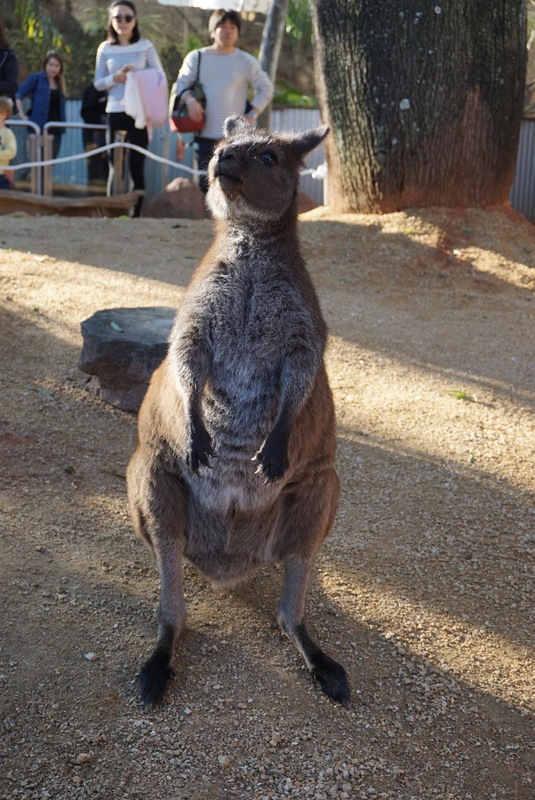 Visitors are not allowed to feed the Kangaroos, just allowed to pet them as the keeper brought the animal around the open area. 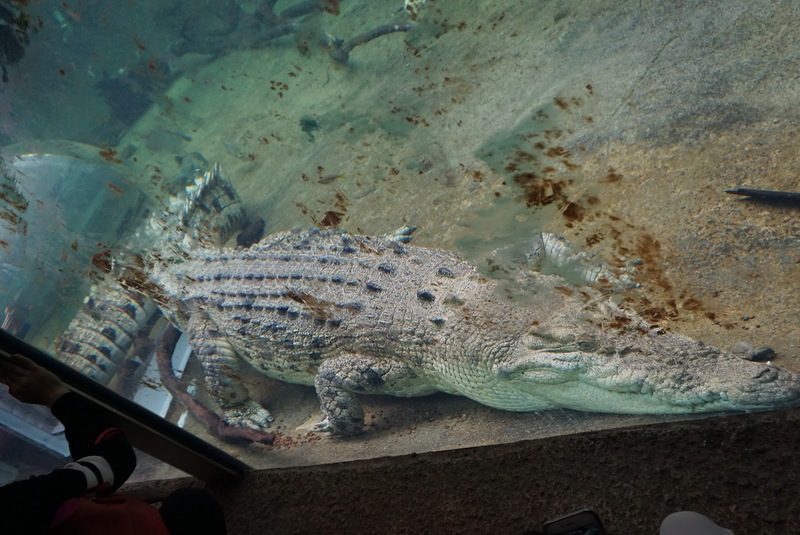 There is also another crocodile tank, which only house 1 crocodile. 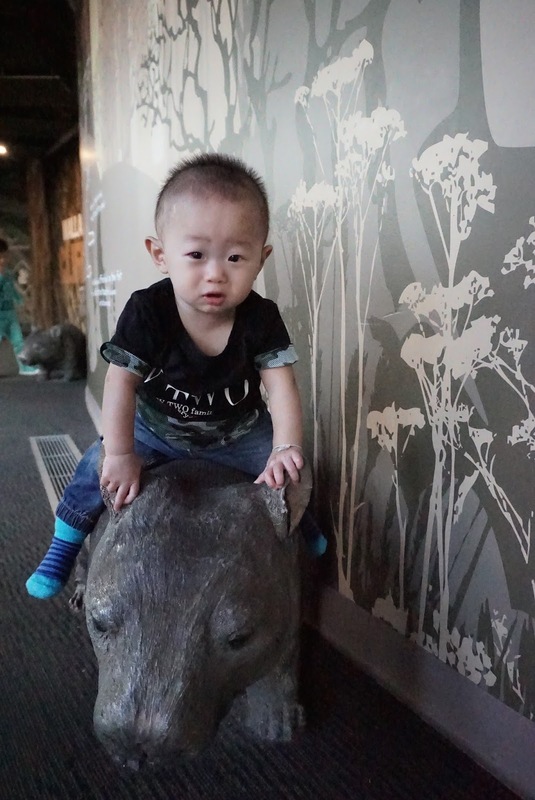 The entire Wildlife Zoo is rather disappointing (compared to the one in Gold Coast that I have visited last year), there are not much opportunity for visitors to interact with some of the animals plus Sydney Wildlife Zoo is small. 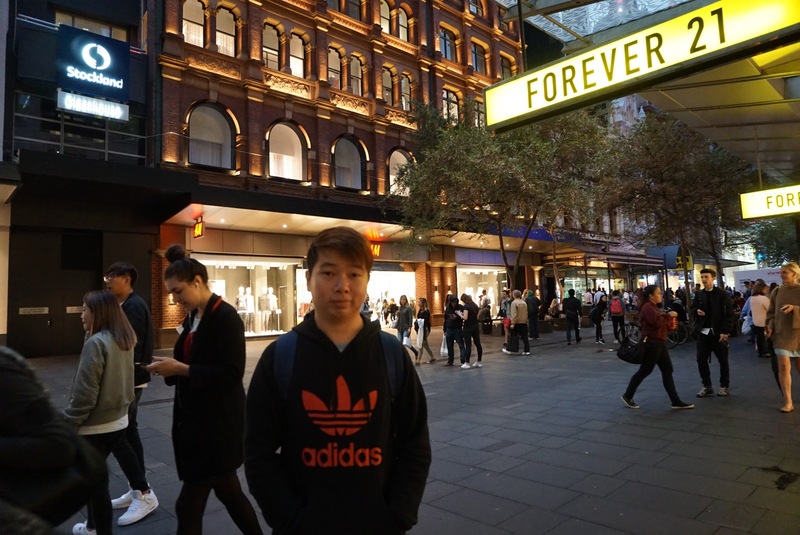 Given a chance to come to Sydney again, I would skip this place. 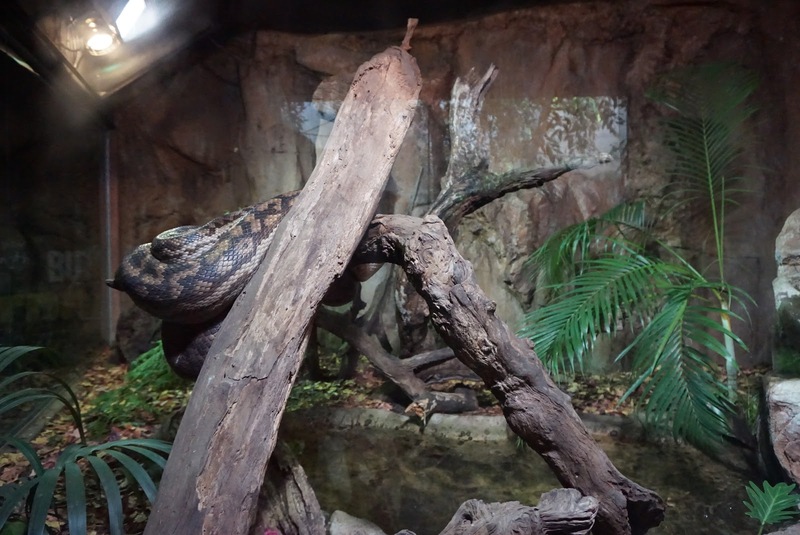 We were glad we exited the boring Sydney Wildlife Zoo. 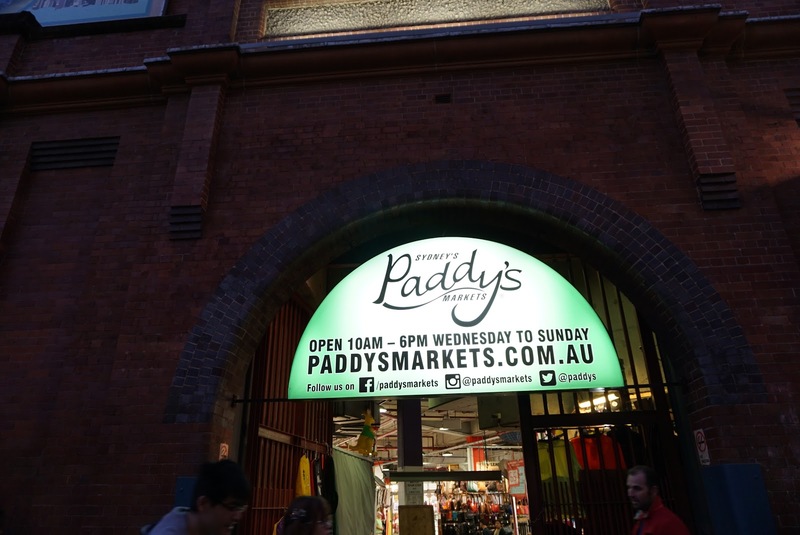 We headed to Paddy’s market at Haymarket next (which closes at 6pm). 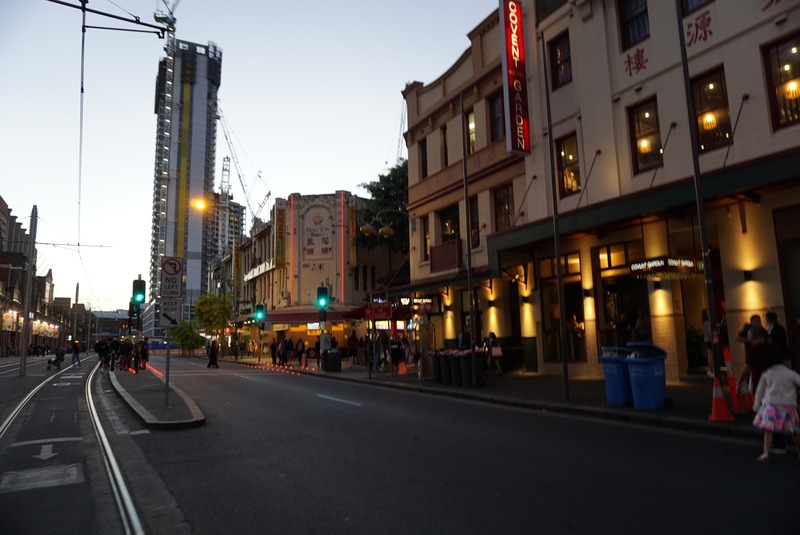 Haymarket is located in Chinatown, a 20 mins drive from Darling Harbour. The covered market place comprises of 2 levels, we spent time exploring only the first level. The stalls are well organised in neat rows and columns, which makes it very easy to navigate around. 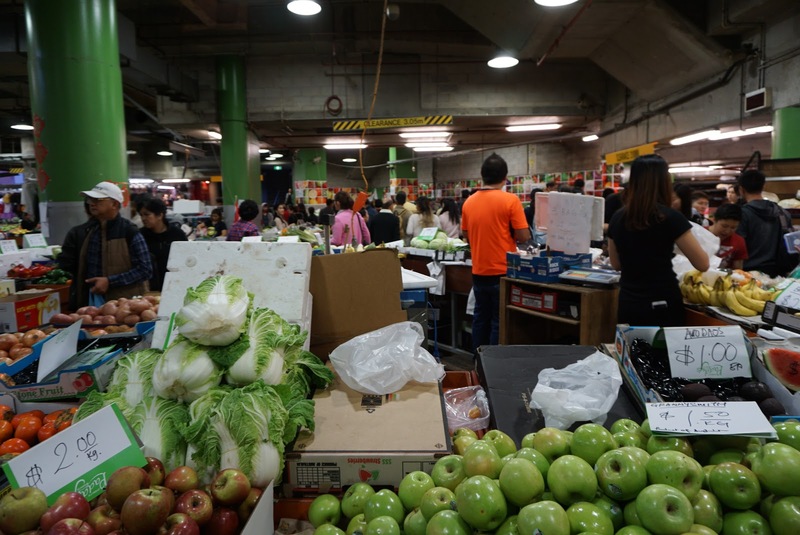 There are 2 main sections on the ground floor in Paddy’s Market. 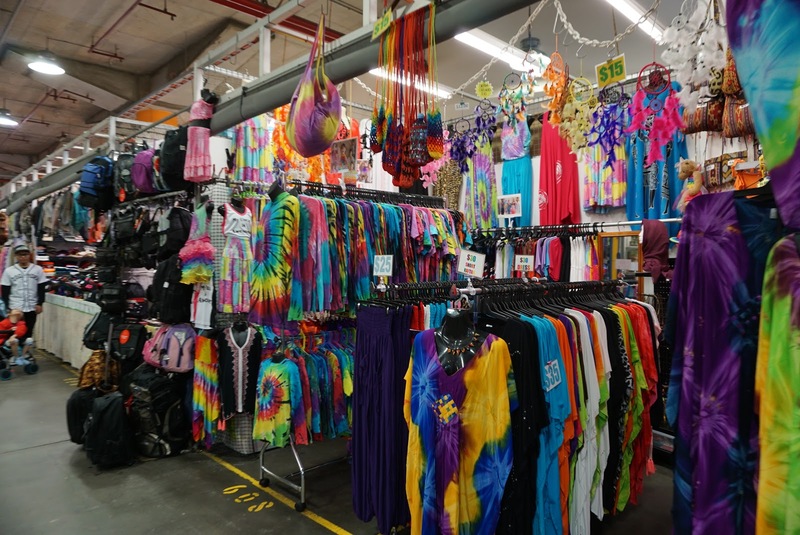 The section nearer to the entrance sells mainly clothing and souvenirs. This area occupies 2/3 of the ground floor. 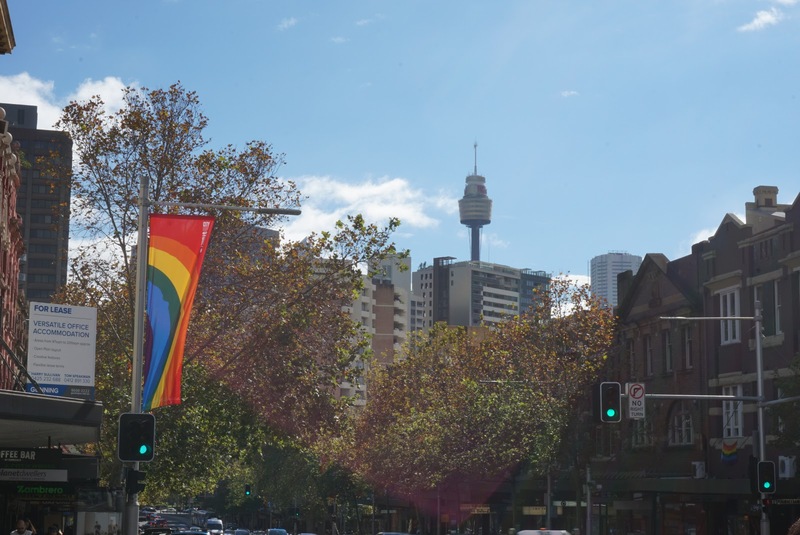 Things on offer here are reasonably priced and is definitely cheaper than some of the tourist attractions and downtown Sydney. 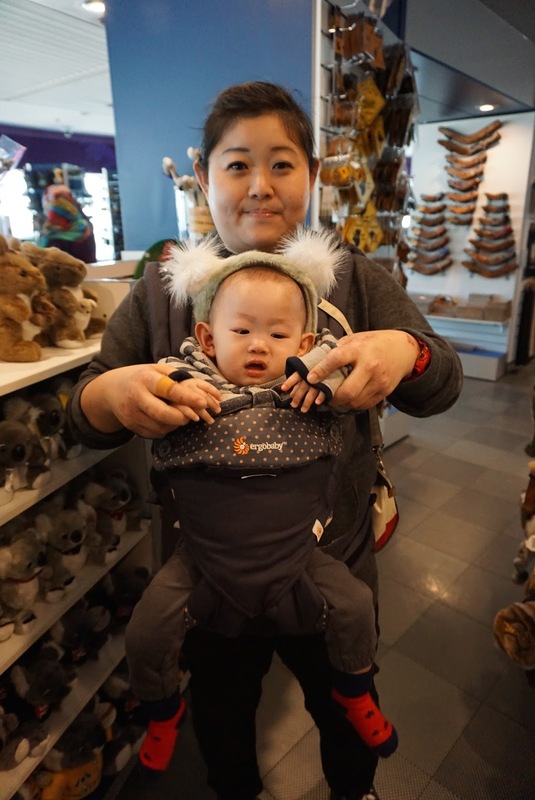 The common souvenirs such as T-shirts, kangaroo skins can be easily found here. There are also stalls selling nougats and locally produced chocolates. 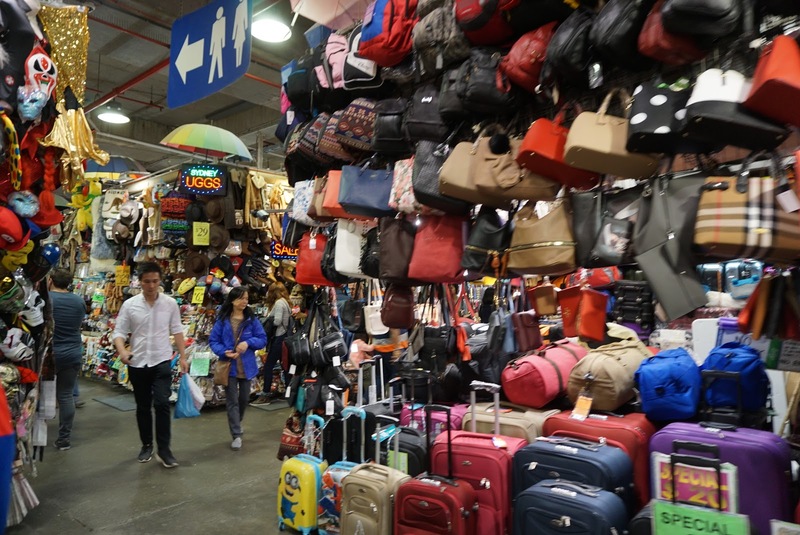 Paddy’s Market is a great place to stock up on souvenirs of all sorts. Further into Paddy’s Market is a section selling fruits and vegetables. These produce seem fresh and is reasonably priced. One can get a pint of strawberries for A$5. This area is very lively, we could hear vendors shouting the price of their products on sale. It might be closing time is near, the vendors in market place here are trying to close as many deals as possible. Compared to the section further out front, this section seem more crowded with shoppers, probably due to the smaller area. As it is near to closing time we got out of Paddy’s Market. 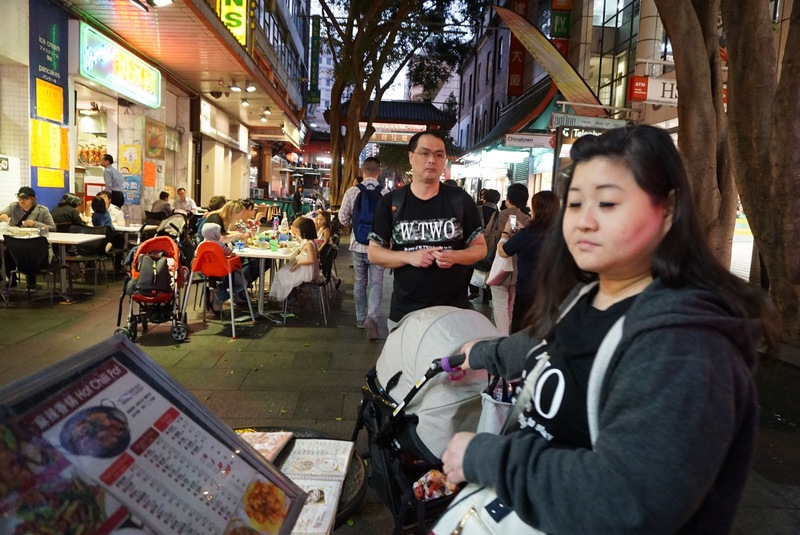 The night is still young and hunt for dinner around Chinatown. 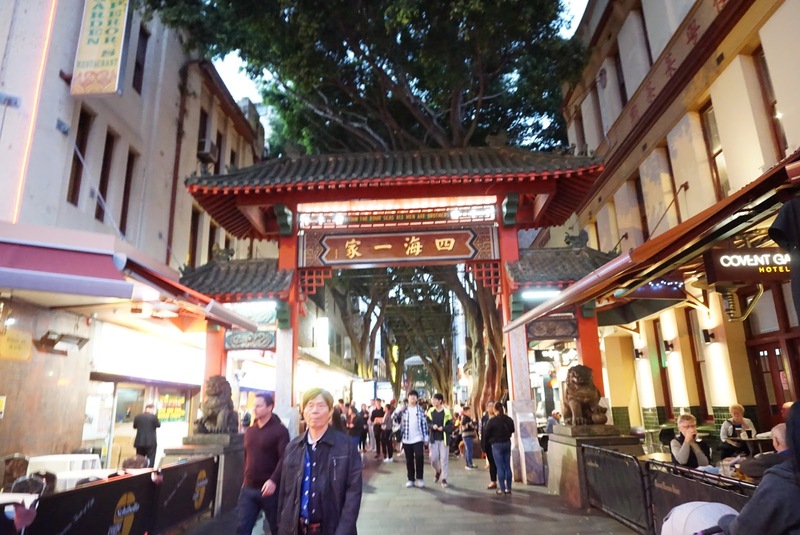 Across the road from Paddy’s Market is a Chinese styled red archway, seem to tell visitors we are in Chinatown. 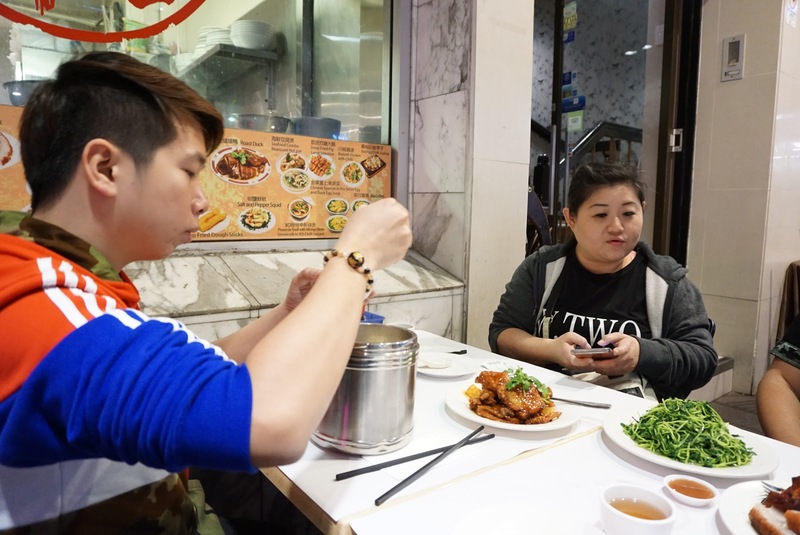 There are no lack of Chinese Restaurants pass the archway, mainly selling Cantonese cuisines operated by Hong Kong immigrants. We settled our dinner in one of these restaurants. 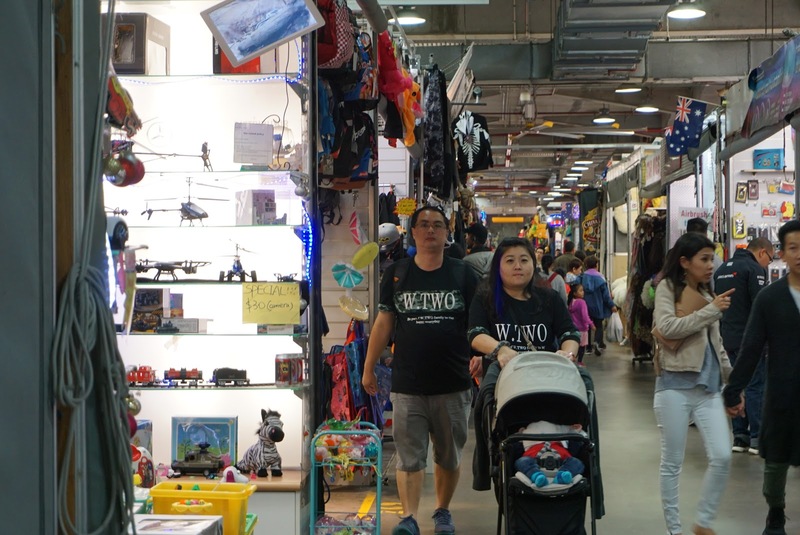 There are also shops that opens till late at night, selling mostly the same stuffs, Australian souvenirs of all sorts that can also be found in Paddy’s Market. The price is more or less the same as that in Paddy’s Market. 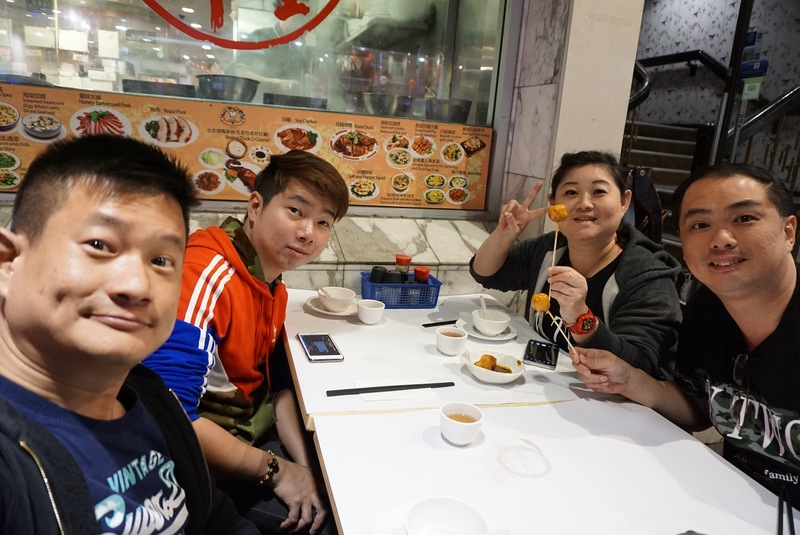 After dinner, we walked around Chinatown. 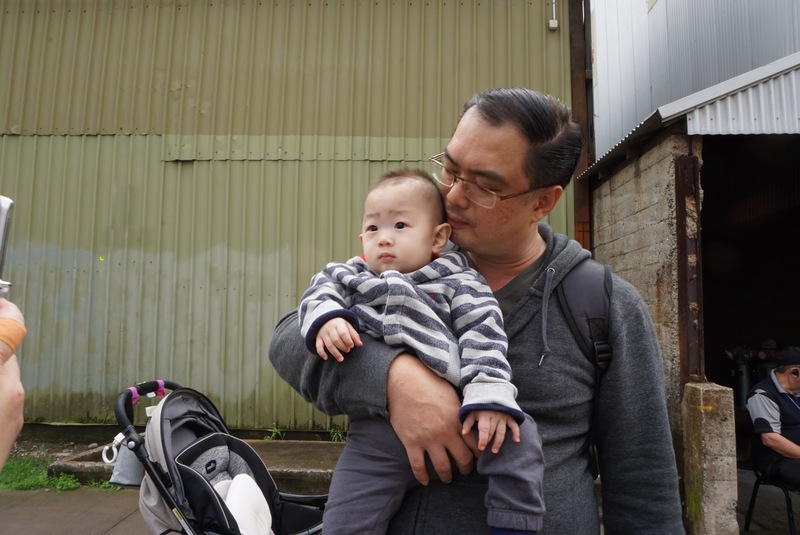 Instead of Chinatown, it felt like a place where the Asians congregate. 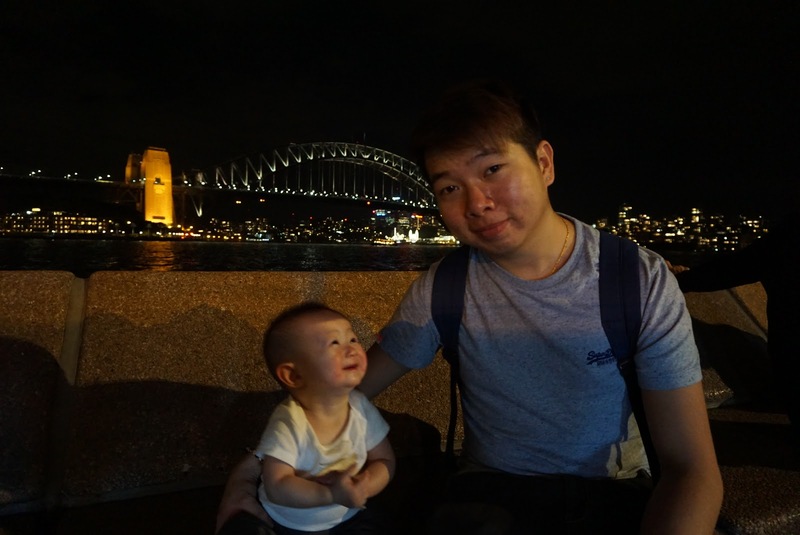 Interestingly, the different nationality who migrated to Sydney seem to cluster according to their country of origin. 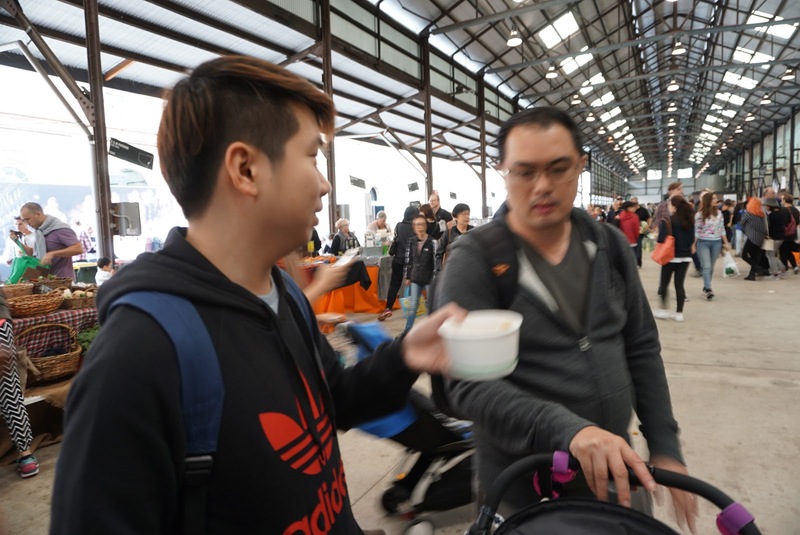 There is a cluster selling Taiwanese food and dessert, yet another cluster of restaurants selling Korean food and another selling Japanese food. 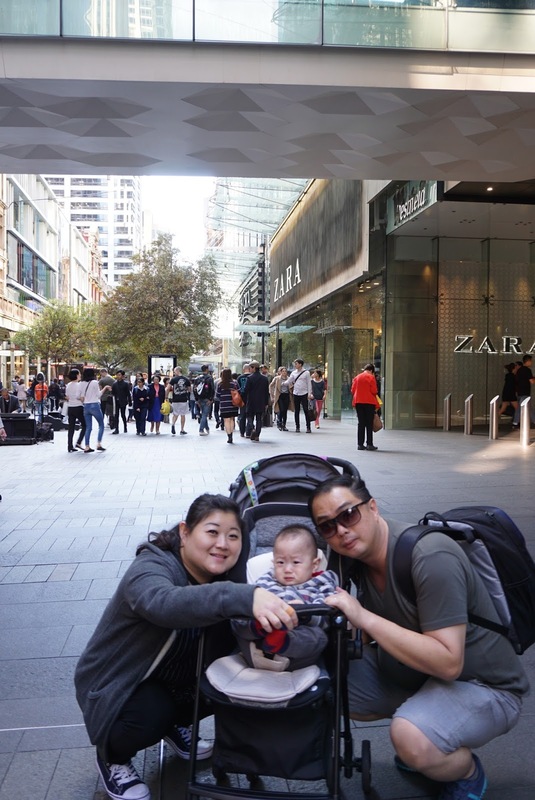 We came across this shopping mall – World Square, where there is a supermarket in its basement. Near to the World Square, is where one would find a street of Thai Restaurants. 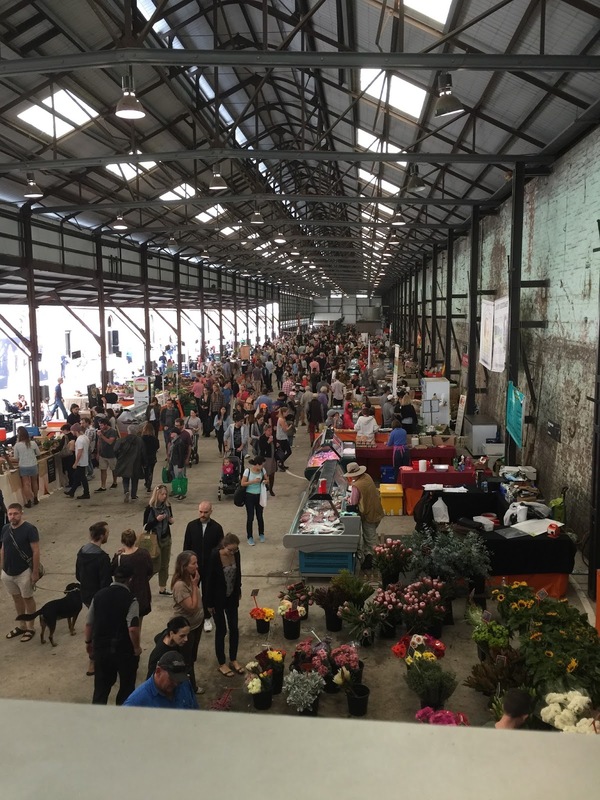 No trip to Australia would be complete without a visit to one of a numerous weekend markets. 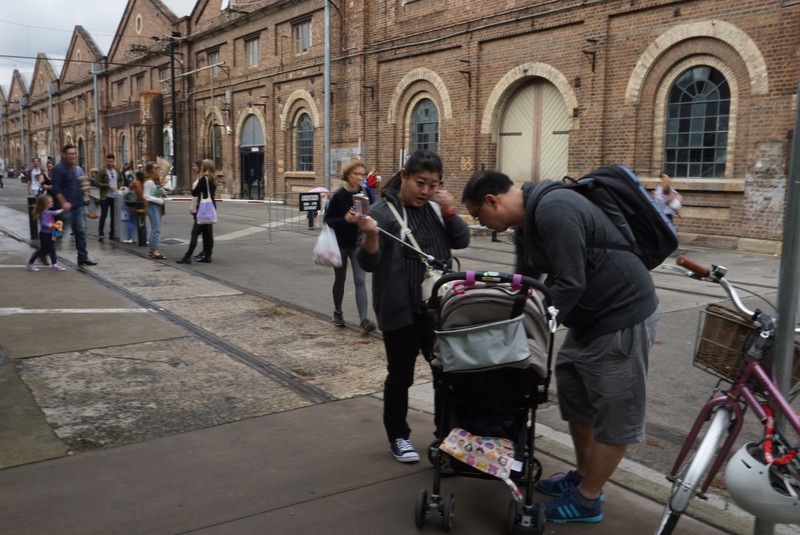 I read that Carriageworks Farmers Market is one of the top farmers market in downtown Sydney, offering a good variety of the freshest produce the land down under has to offer in Sydney region. 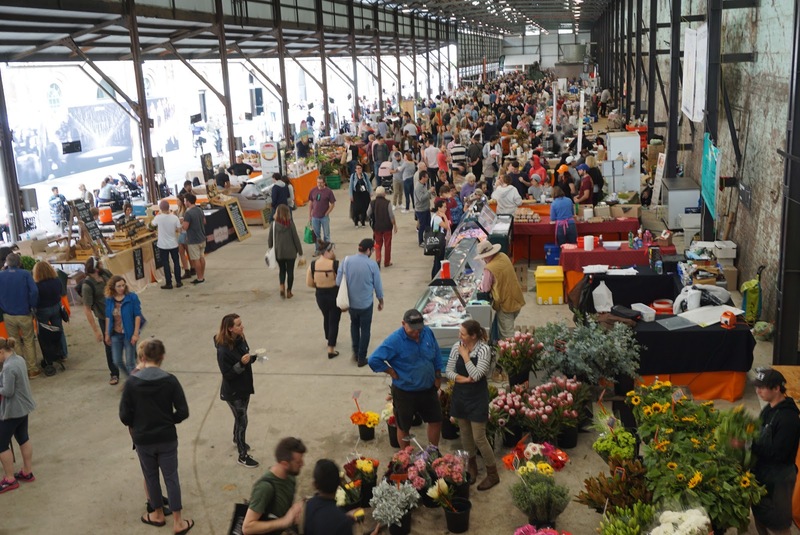 We made our way to Carriageworks Farmers Market in Sydney, which is around 30 mins drive from Sydney Olympic Park. 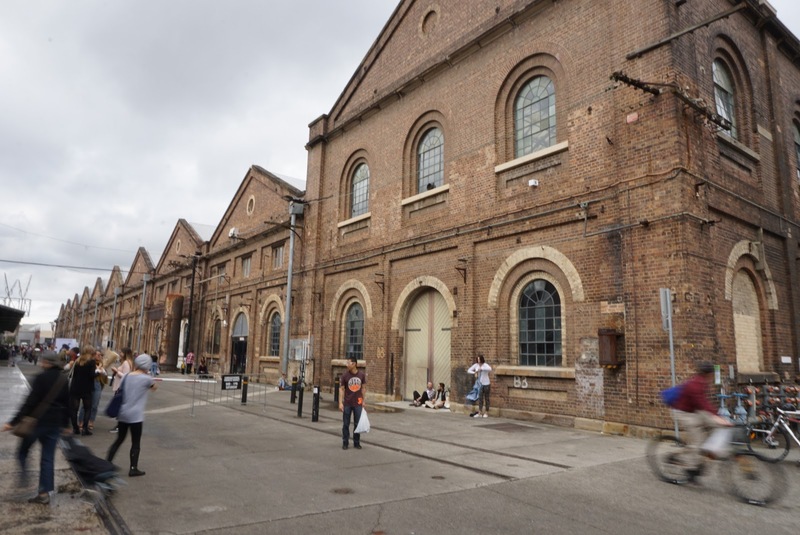 Carriageworks Farmers Market is housed what seemed to be some abandoned industrial area. 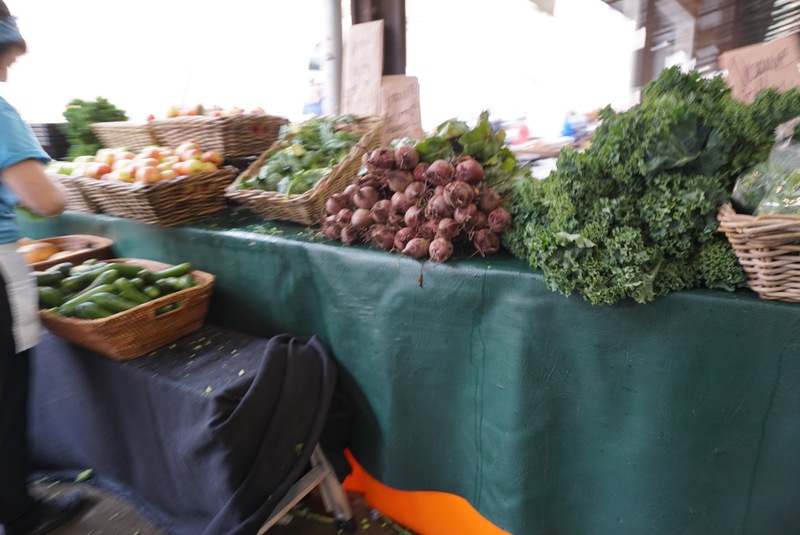 The market is rather small, selling mostly vegetables and fruits. 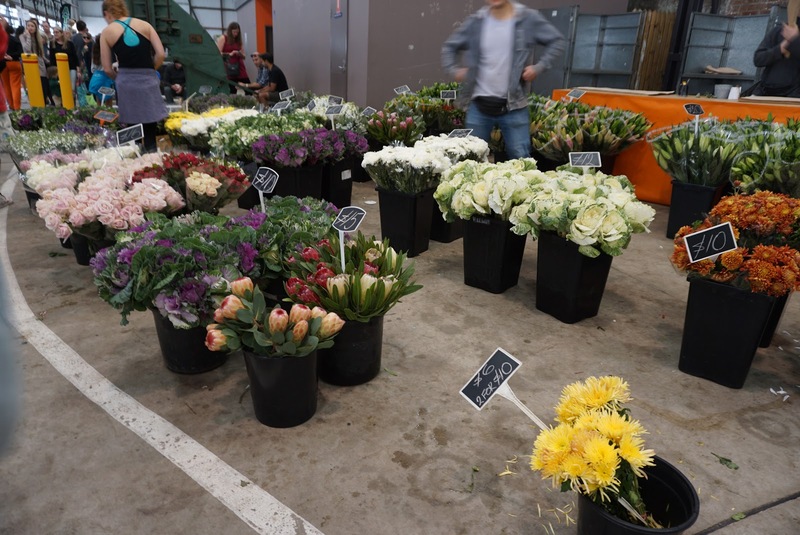 There are some stalls selling flowers and meats, while other selling homemade products such as cheese, biscuits, etc. 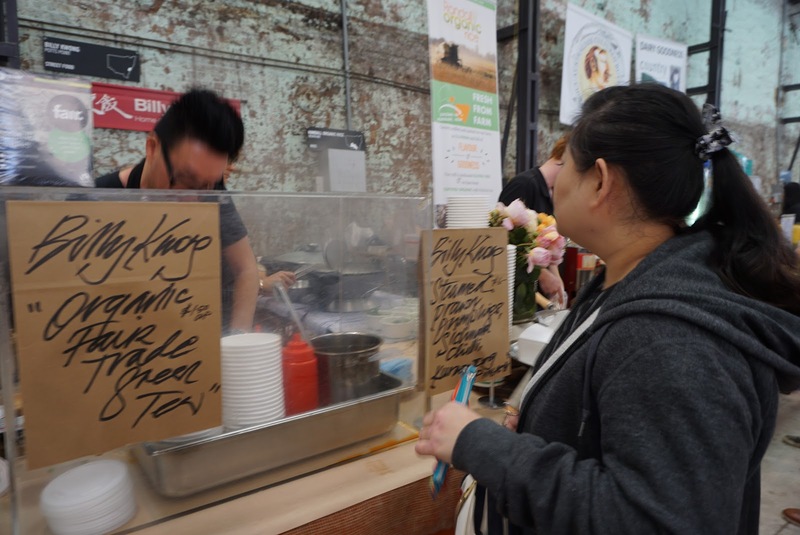 There are a limited number of stalls selling food from Chinese dim sum to coffees to freshly pressed juices and steaks. 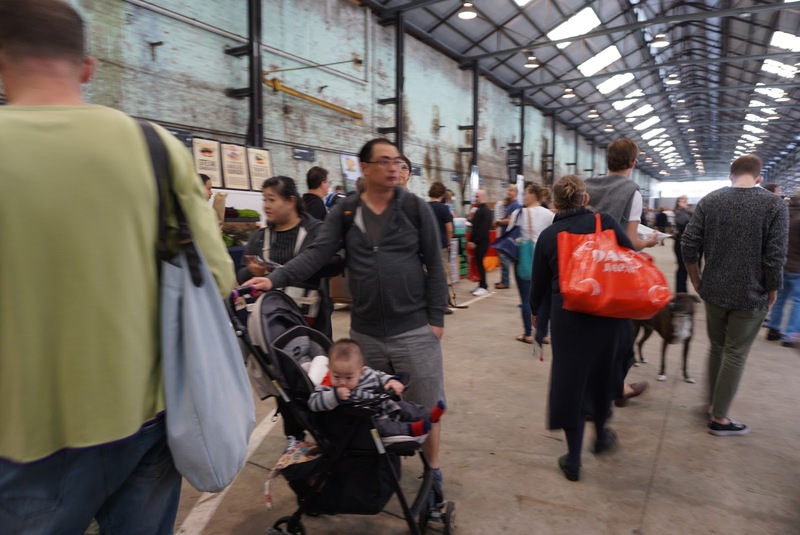 Carriageworks Farmers Market is rather small, it only took us 15 mins to finish the entire market. It is not as big as we imagined it to be. 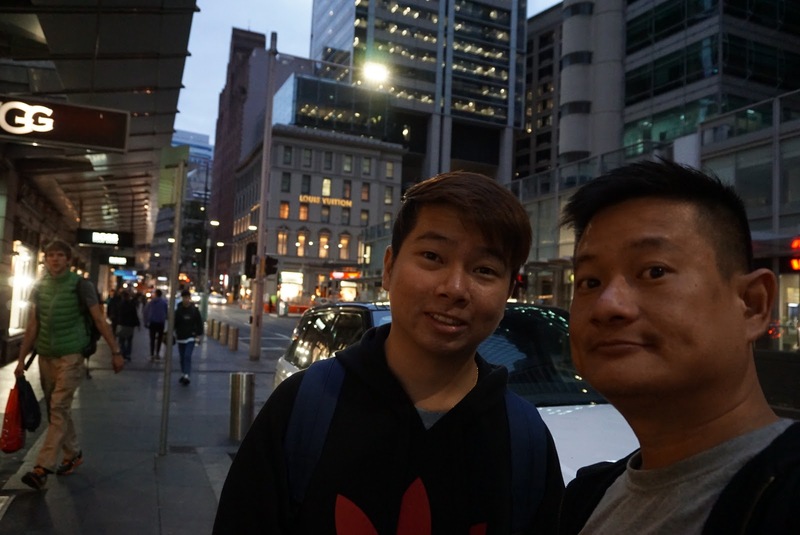 Feeling disappointed, we headed to downtown Sydney to look for lunch. 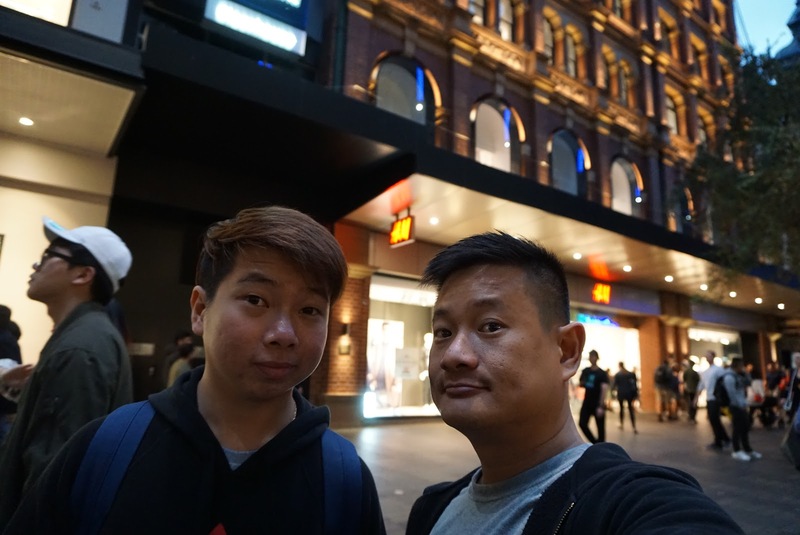 We had lunch in Kings Cross before heading to Sydney Eye Tower in the middle of Sydney CBD. 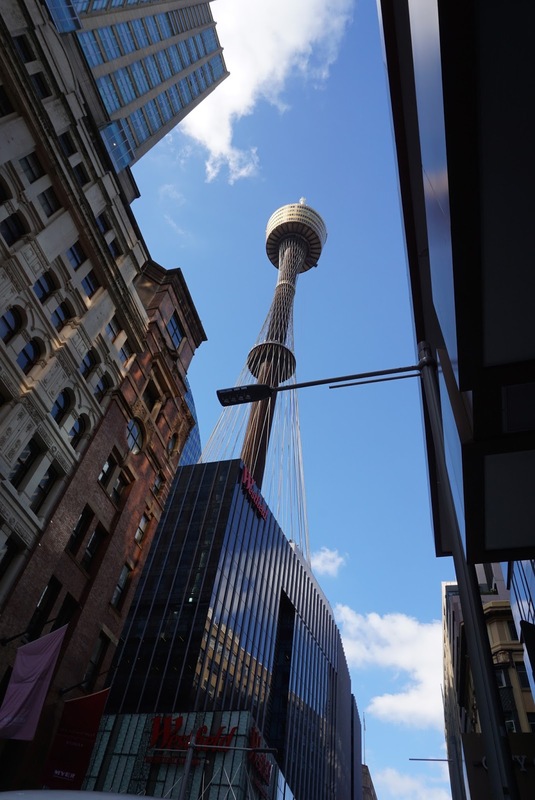 Sydney Eye Tower is located on top of Westfield Shopping Centre in the heart of Sydney’s shopping precinct. Parking is a tad difficult to find in this area as we had to go around a few rounds before being able to find a parking spot. 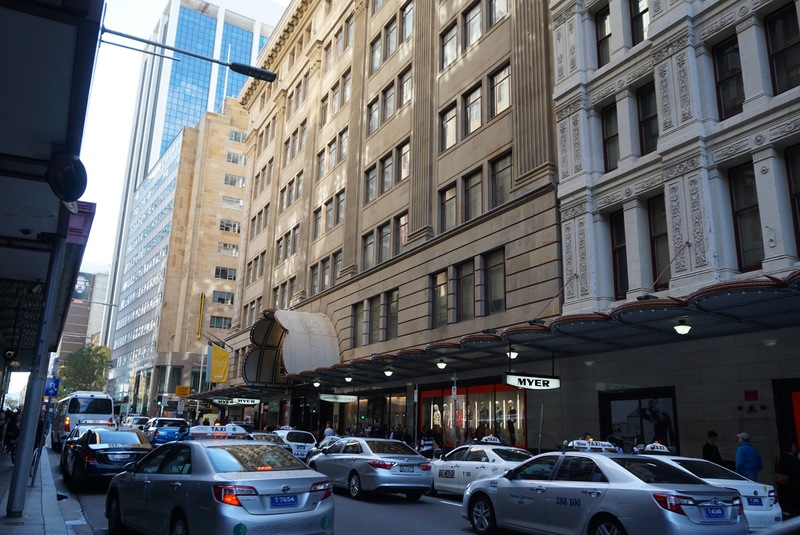 As it is located in the heart of Sydney, parking rates can be a tad expensive. 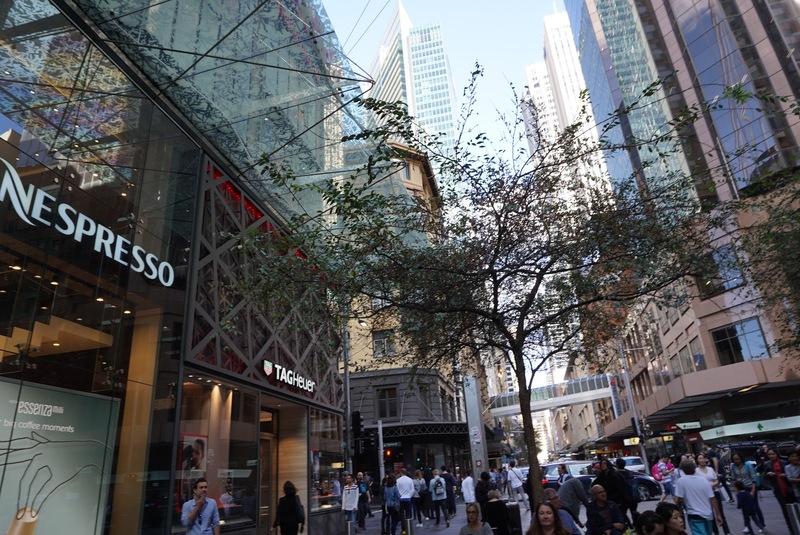 Westfield Shopping Centre stands out among the shopping malls in downtown Sydney, it is the building with a single tall tower affixed on top. 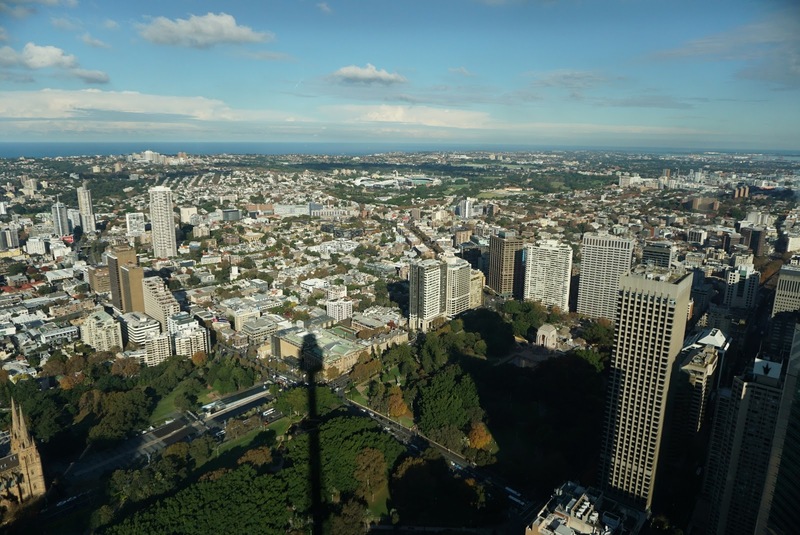 Sydney Tower Eye is the tallest building in Australia, standing 309m tall. 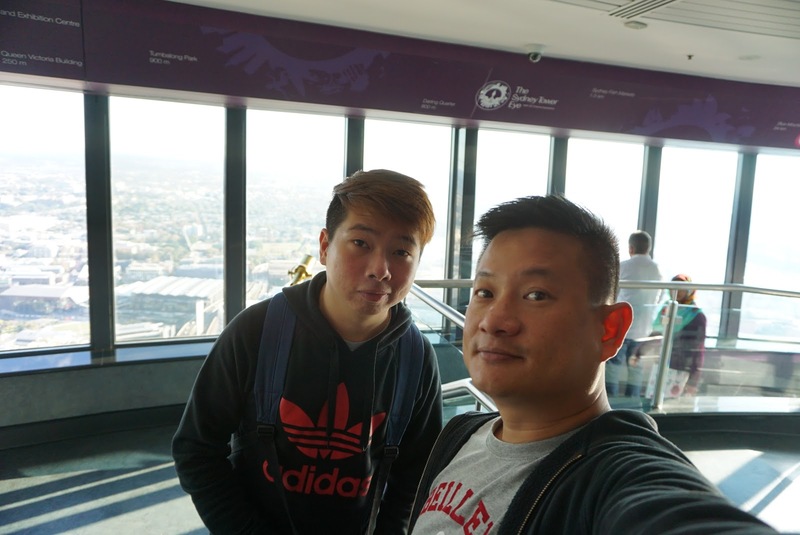 The observation deck is some 268m from the ground. 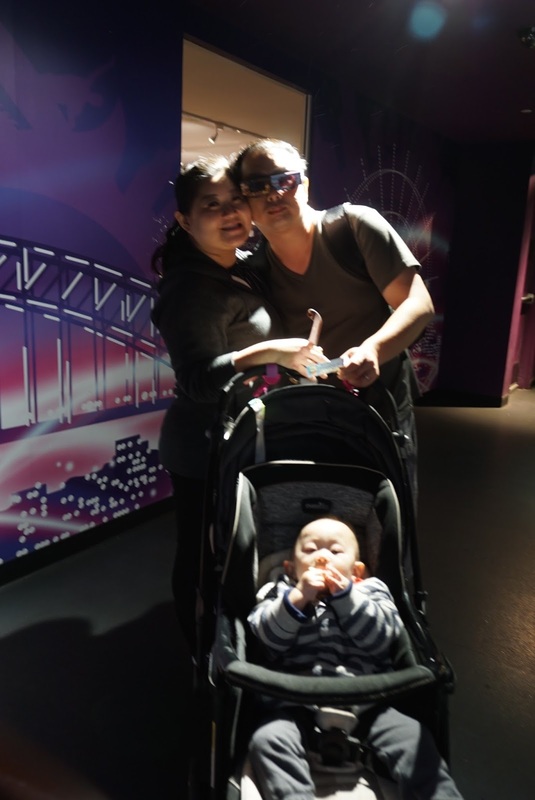 We got a 2 attraction pass from Experience Oz and NZ website, which is value for money and allowed us to choose how many attractions we wanted to visit. The ticket prices are discounted and we did not have to pre-select the attractions when buying the tickets. 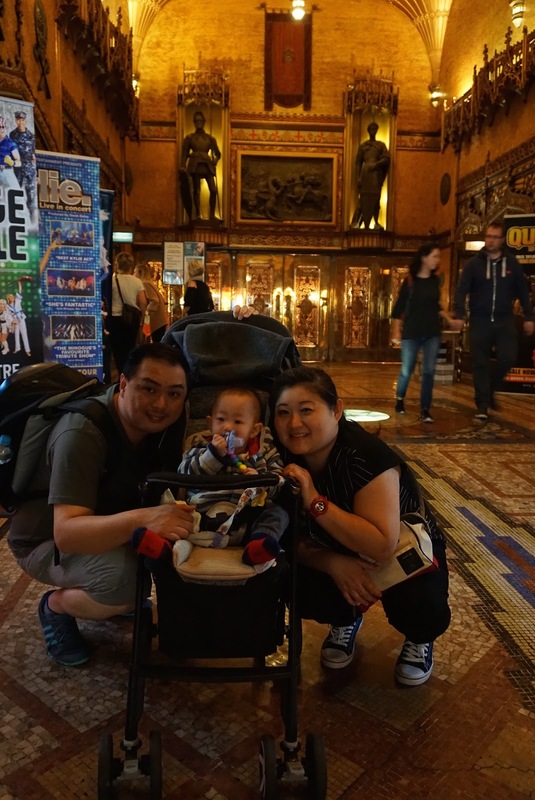 We can appear at one of the 5 attractions and get our ticket validated and visit the rest within 30 days of the first attraction. 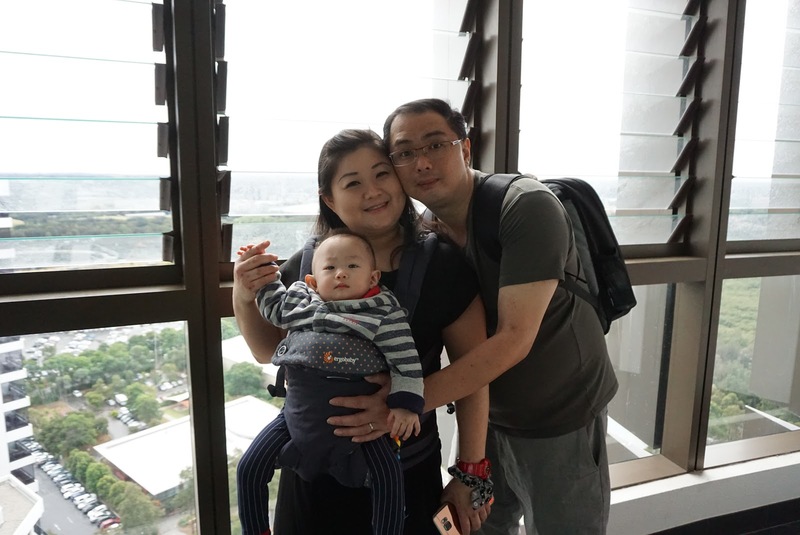 The lift to the observation deck is located on the 5th floor of Westfield Shopping Centre, where the food court is located. Tucked away in one corner of the food court is where ticketing and the lift up to the observation deck are located. 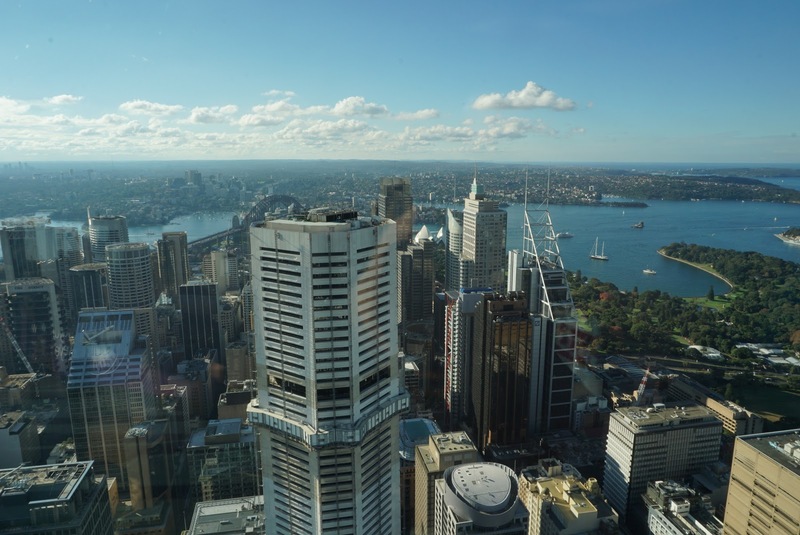 I visited the Sydney Tower Eye almost 20 years ago (it was known as Sydney Tower back then), there are a couple of new additions to the tower. 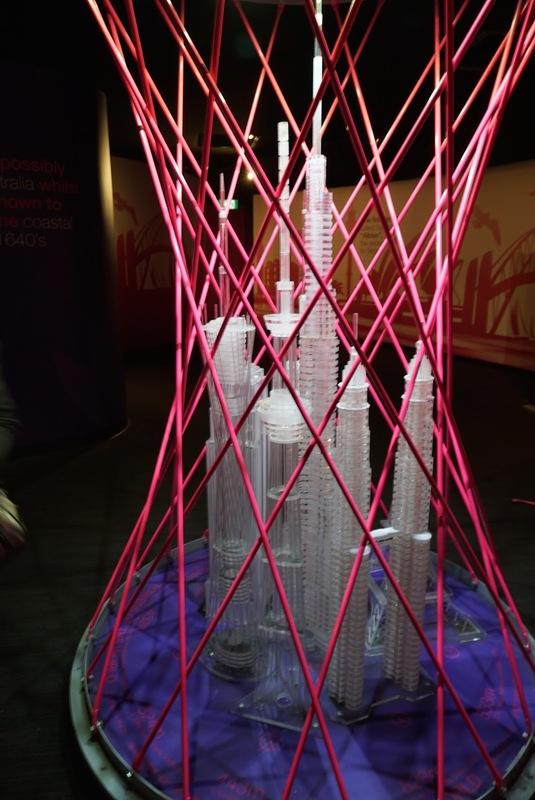 There are some models of the tallest buildings in the world, where one can see how tall Sydney Tower Eye stacked up against other giants around the world. Another new addition is a 5 mins 4D show in an auditorium prior to the lift up to the observation deck. 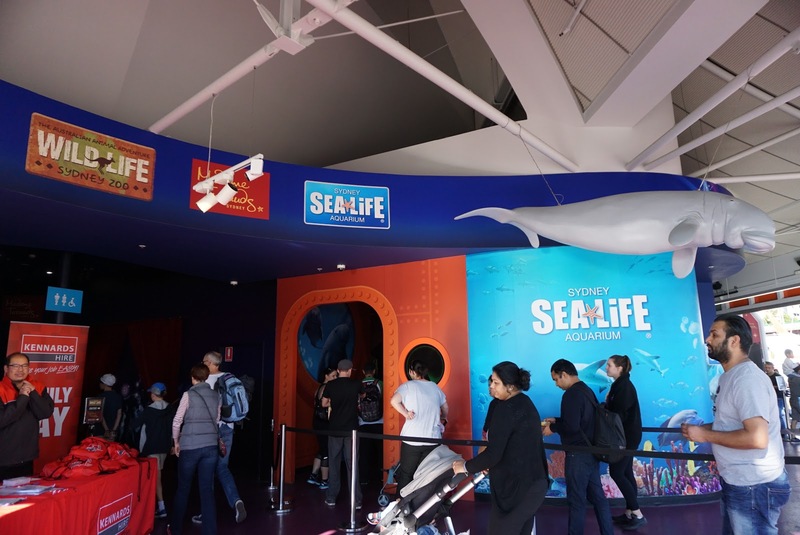 The show is rather unique in that it introduces Sydney to visitors from the eye of a bird flying through some of the tourist attractions in Sydney. 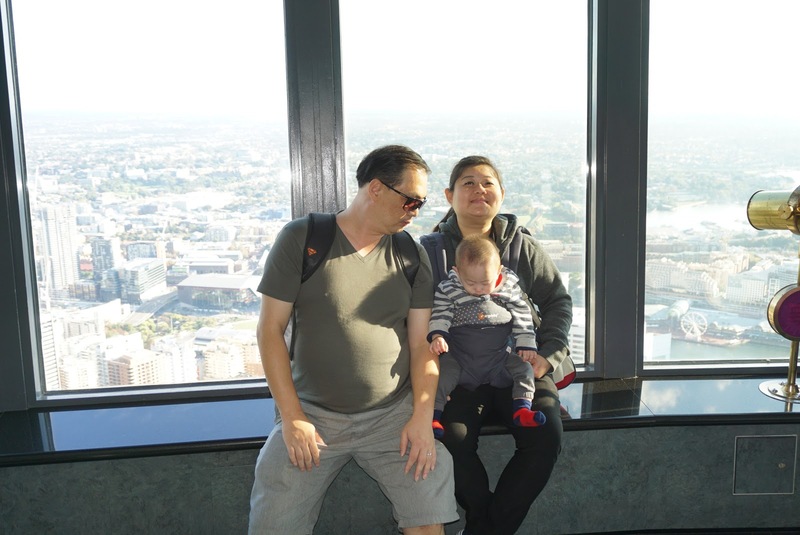 After the show, we took the lift that whizzed us up 268m into the sky within minutes to the observation deck. 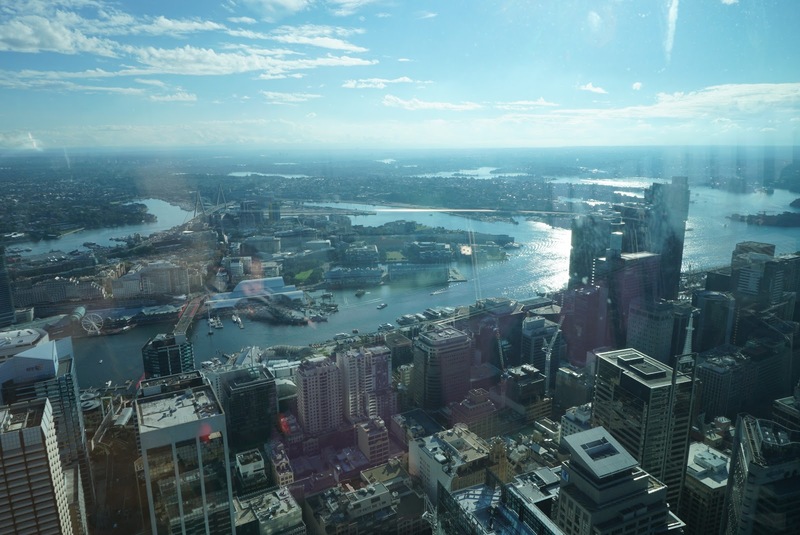 Stepping out of the lift, we were treated to an unobstructed view of the entire Sydney. 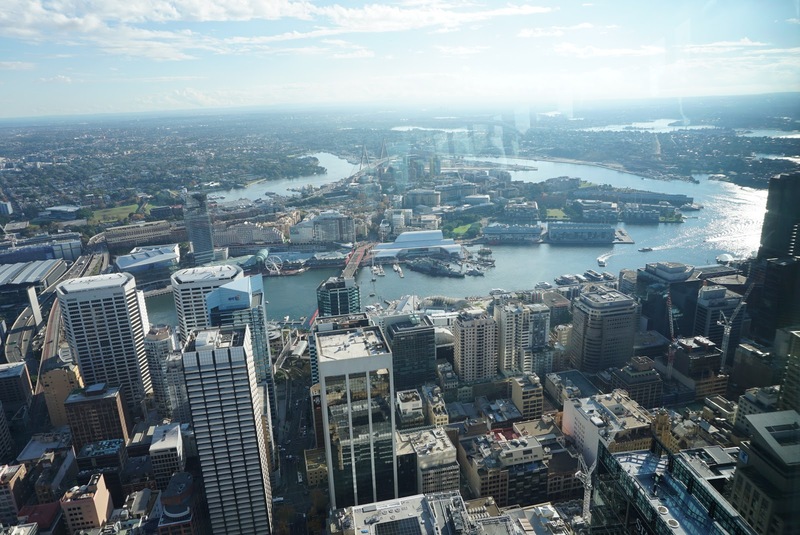 Sydney Tower Eye is a good place for visitors offering a 360° view of the city, especially great for first timers to Sydney to get a glimpse of how massive the metropolitan city is. 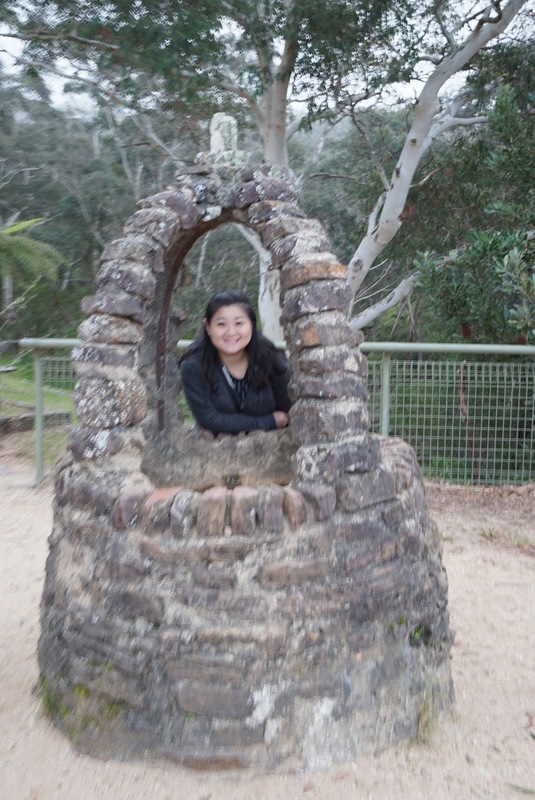 It is also a great place to orientate one on where’s where of Sydney. The side that faces Sydney Harbour Bridge was the most crowded, as visitors are here to get a different perspective of the famed icon of the city. 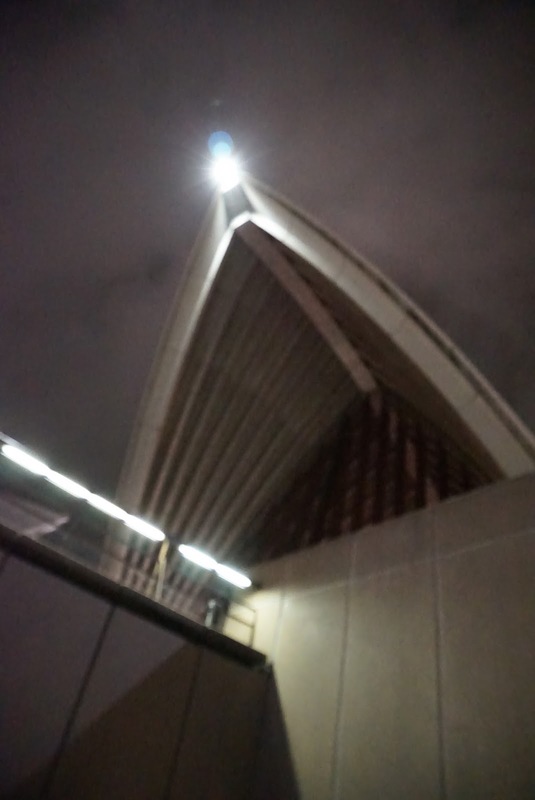 However, the Sydney Opera House is obscured. 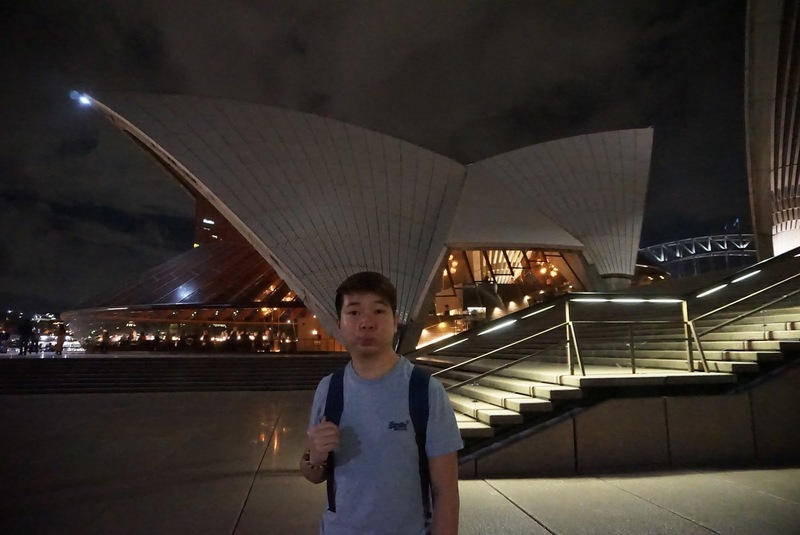 I managed to find the Opera House peeping out in between 2 buildings. 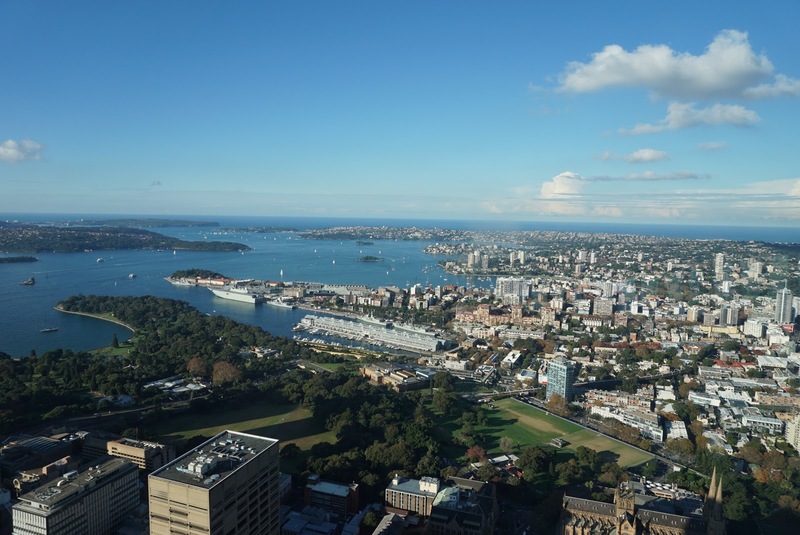 One can also see the entire Sydney Harbour Bay from the observation deck. 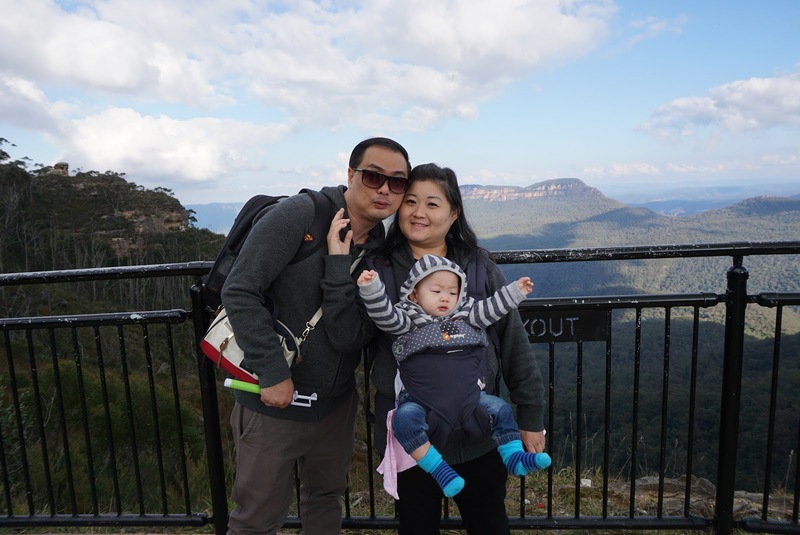 We spotted the Blue Mountains sitting afar from the observation deck, as well as the Sydney Airport and the many suburbs. Walking one round takes around 5 mins (provided one do not stop and take pictures). There is a souvenir shop on the observation deck selling overpriced souvenirs (Hay Market in Chinatown offers souvenirs at half the price here on average). 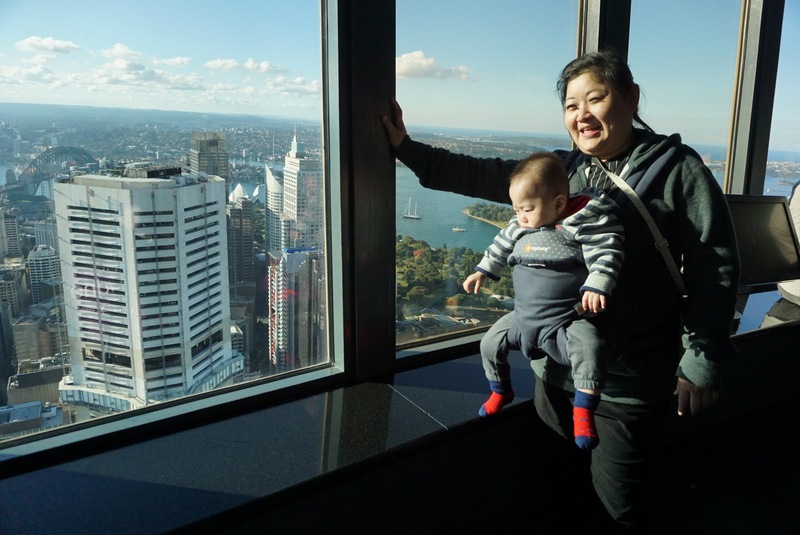 We stayed in Sydney Tower Eye for about 1 hour as my nephew needs to be fed, however, Sydney Tower Eye can be done within 20 mins on average. 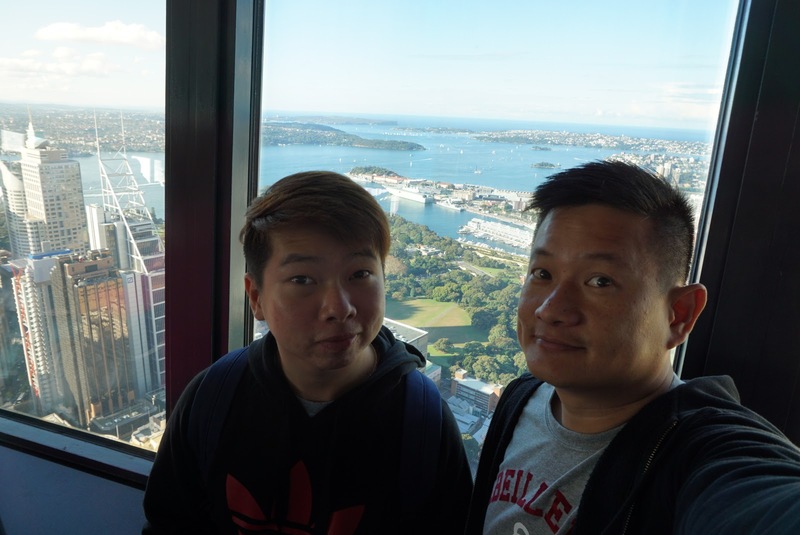 Coming down from Sydney Tower Eye, we spent some time exploring the shopping malls in downtown Sydney. 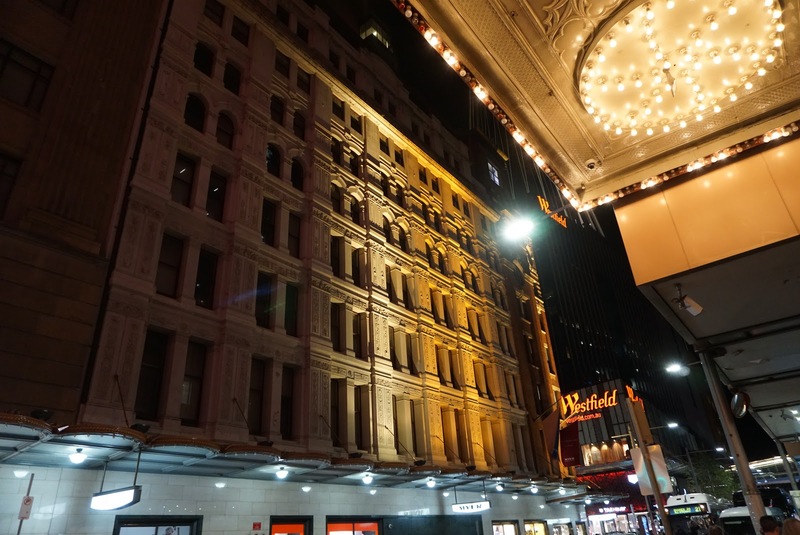 There is no lack of shops ranging from Myers department store to upscale boutiques to mid-range boutiques around this area. One would be spoilt for choice with the numerous amount of shops here. 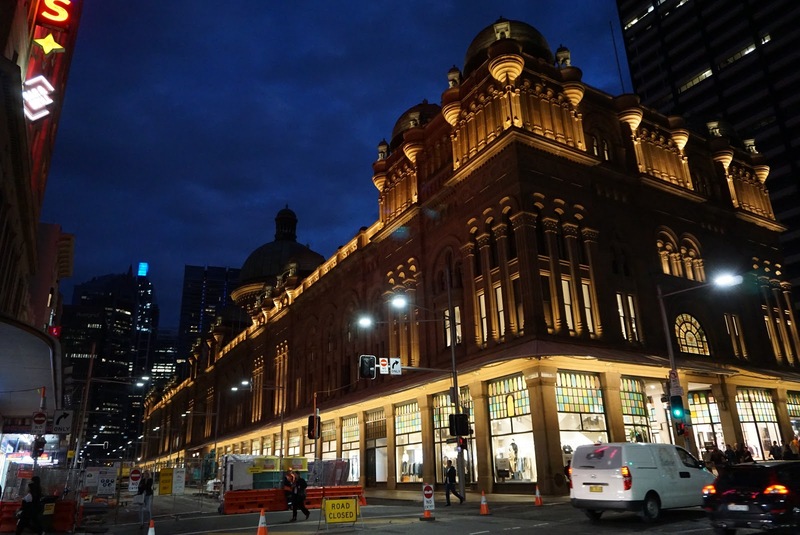 There is even an Apple Store around the corner in downtown Sydney. 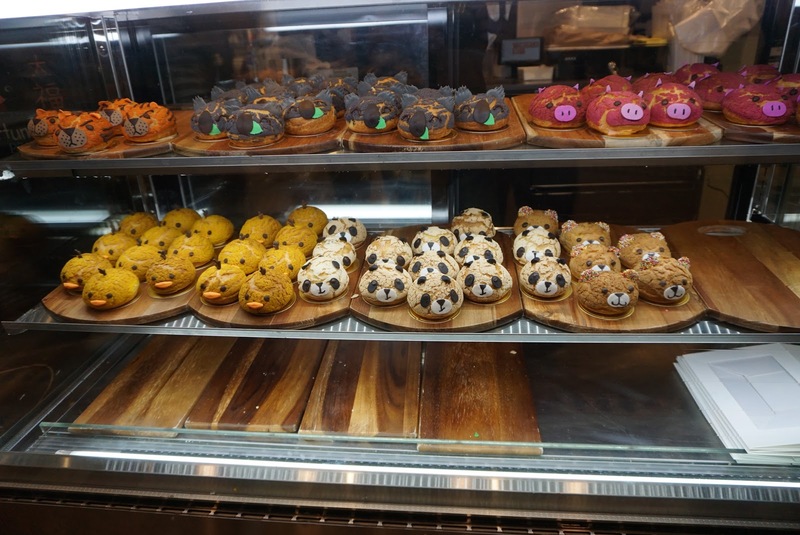 Do not miss some of the small stores selling finger food such as sushi and cream puffs in the basement of some of these shopping malls. 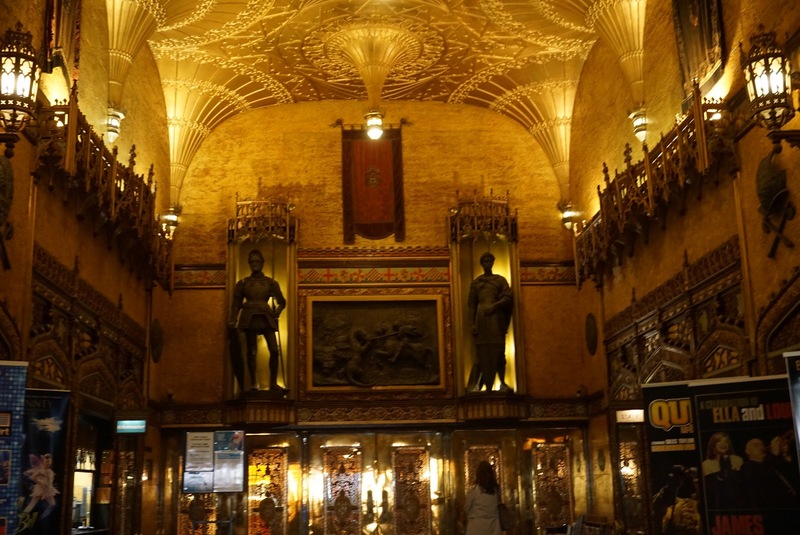 The nearby Queen Victoria Building, a Romanesque architectural building built in the late 1900 Century, that once housed government offices and the public library is hard to be missed. 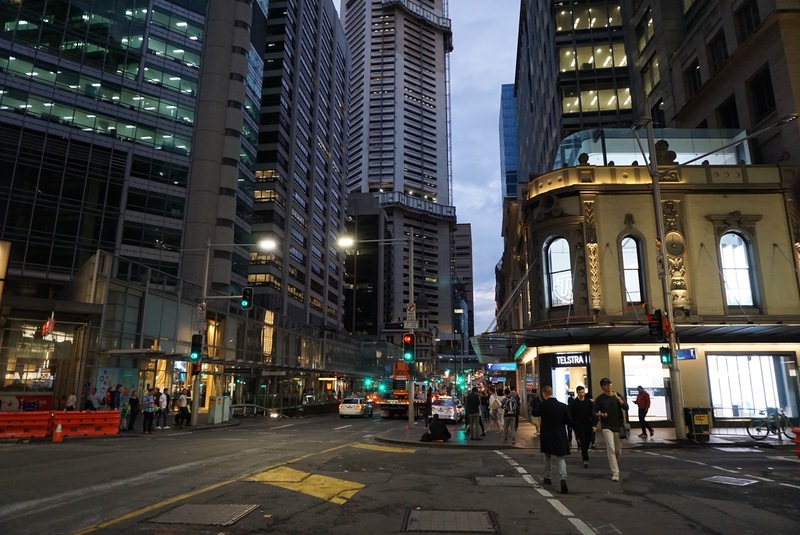 The well-preserved building, spotting a large dome right in the centre of the building stands out from the rest of the modern skyscrapers. 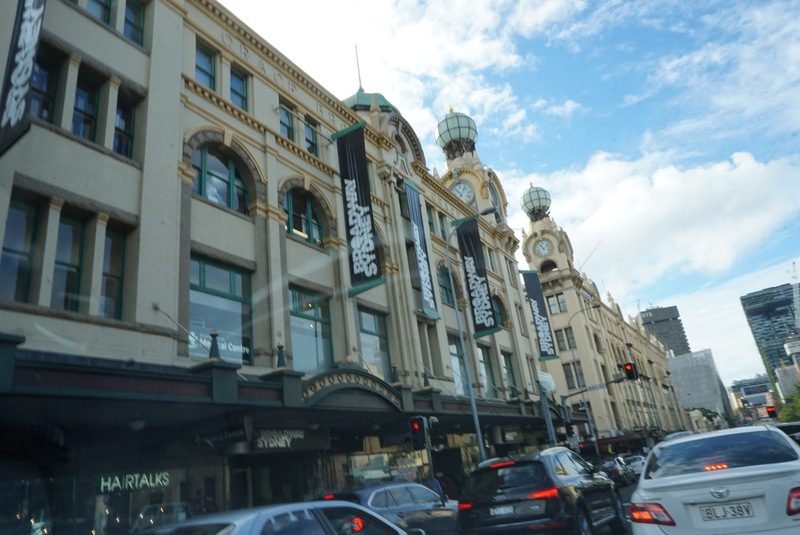 Queen Victoria Building now houses a 4-storey shopping mall in its most recent reincarnation. 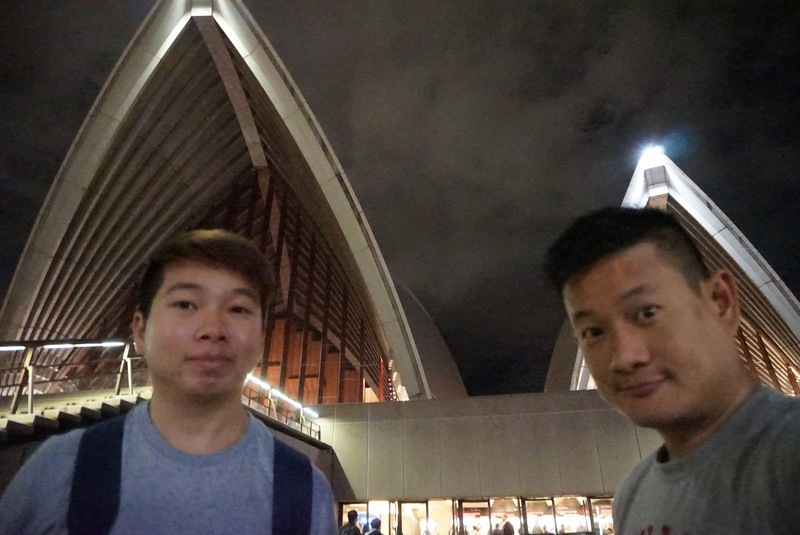 We did not spend much time to shop around here and headed over to the iconic Sydney Opera House. 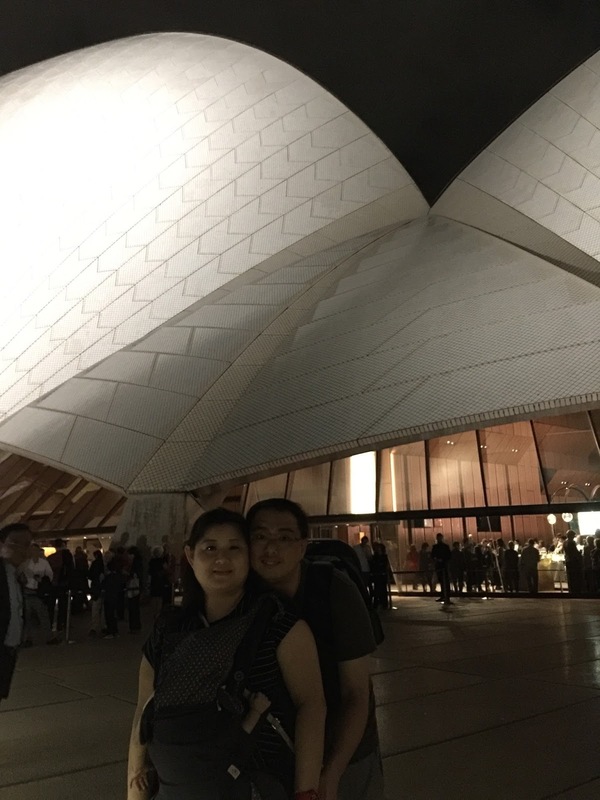 The iconic Sydney Opera House is a good 30 mins by foot from Sydney Tower Eye. As we had Baby Ryker in tow, we decided to drive there instead. 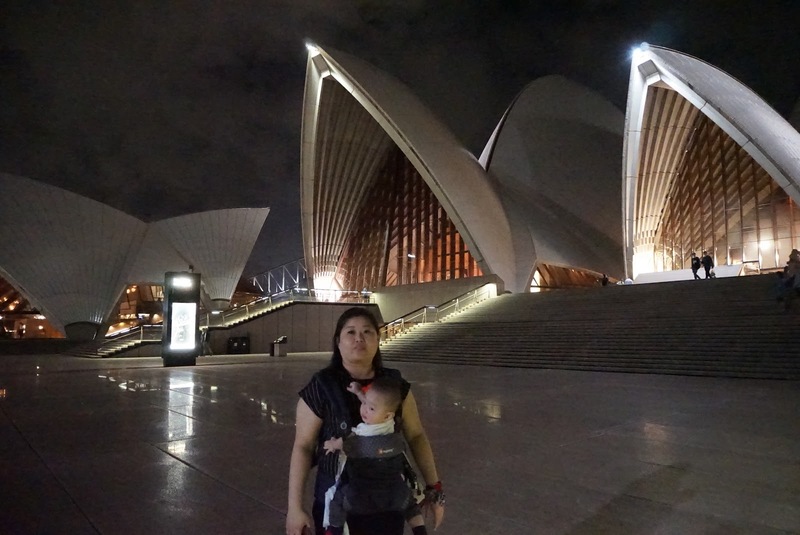 There are ample (but expensive) parking spaces in the carpark of the Sydney Opera House. 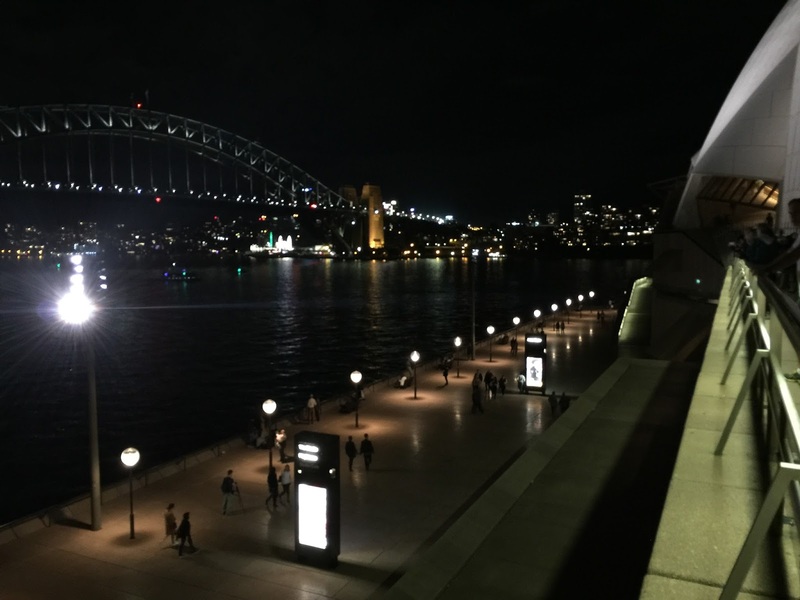 By the time we reached the Opera House, it is already nightfall. 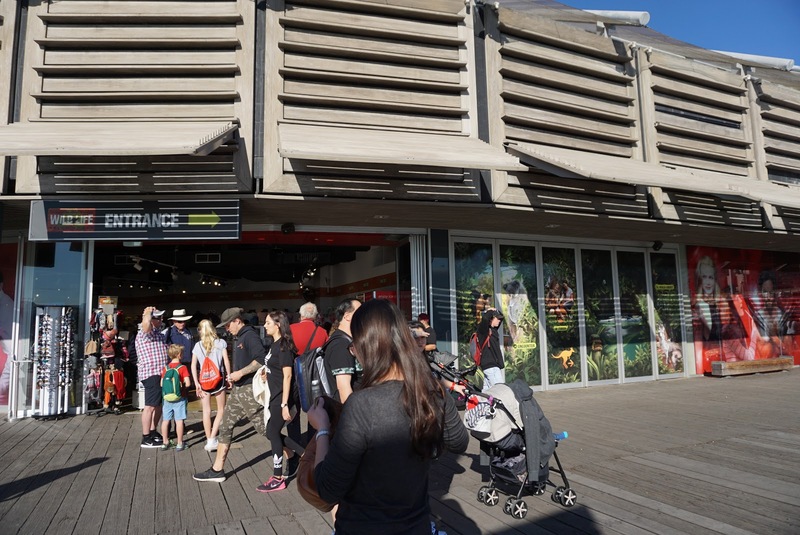 This is when the restaurants in the Sydney Opera House promenade is bustling with life. 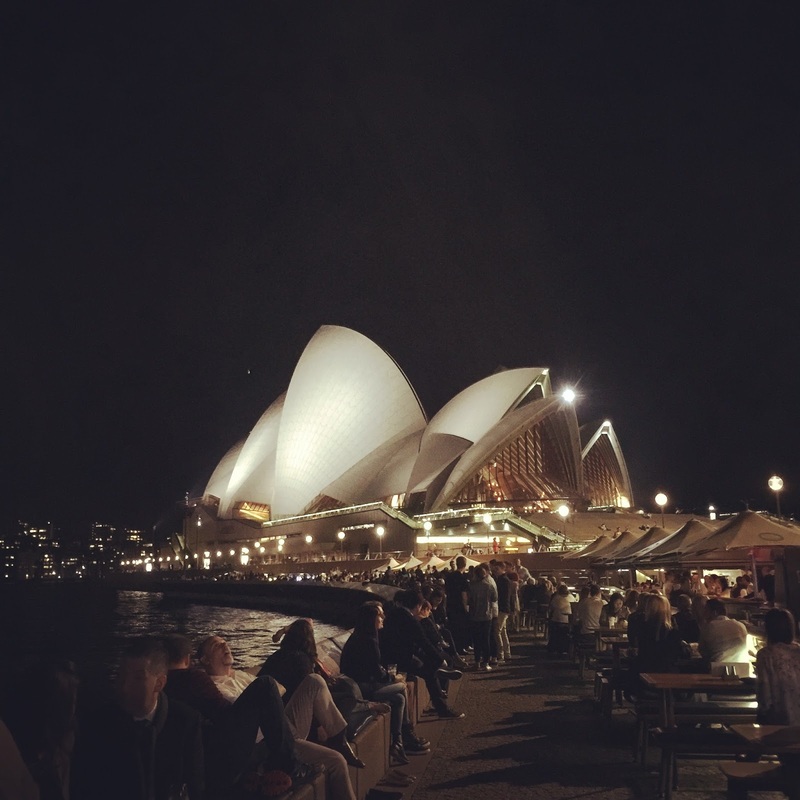 Sydneysiders gathered here in the evening to chill out in the night, while some others come here to watch performances. 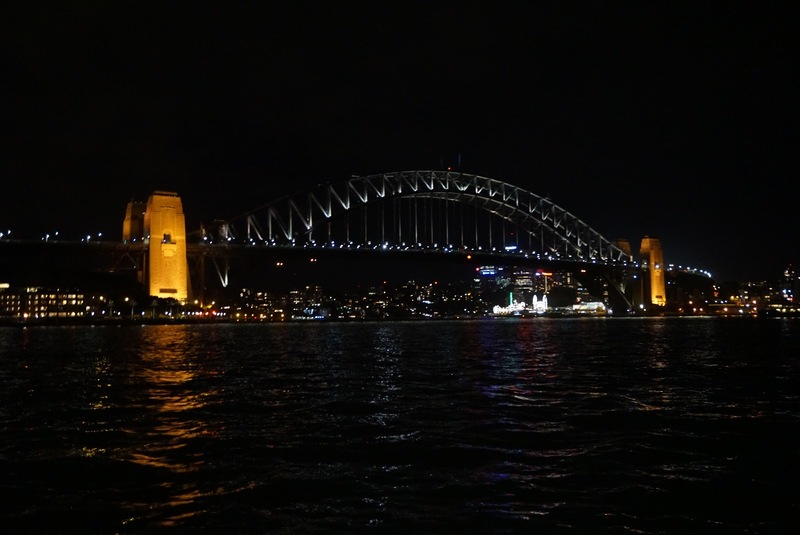 From the promenade, one can get a good view of the Sydney Harbour Bridge. 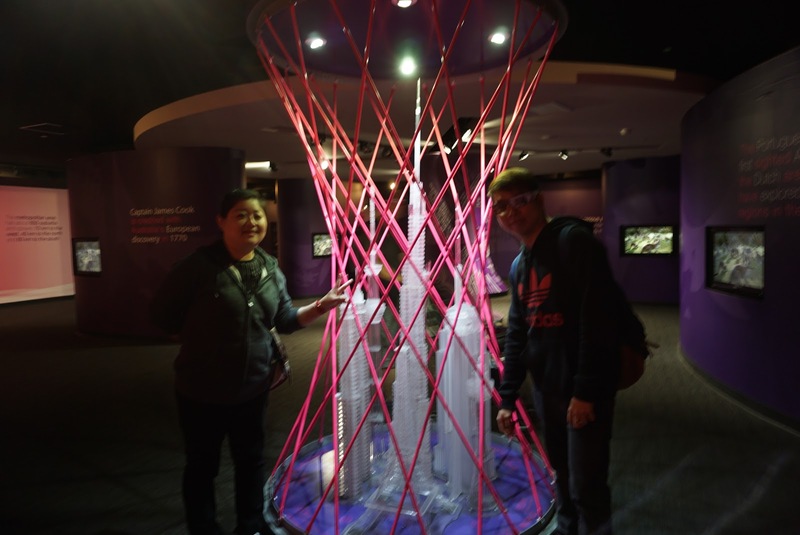 We headed towards the Sydney Opera House, comprising of 7 “shells” which look more like sails. 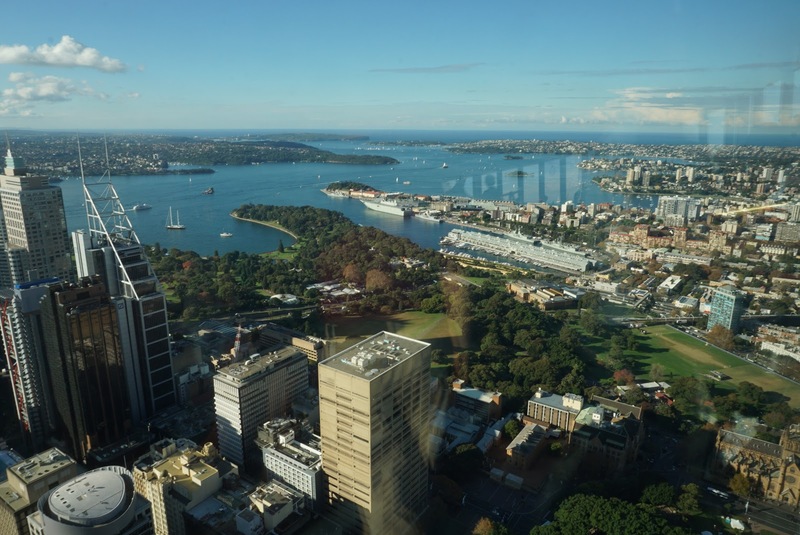 From a distance, the Sydney Opera House resembles a sailing boat sailing in Sydney Harbour Bay. The iconic white roof looked as if it is coated with a blanket of white paint from afar, up close, these white parts of the buildings are tiled with uniform mosaic tiles. 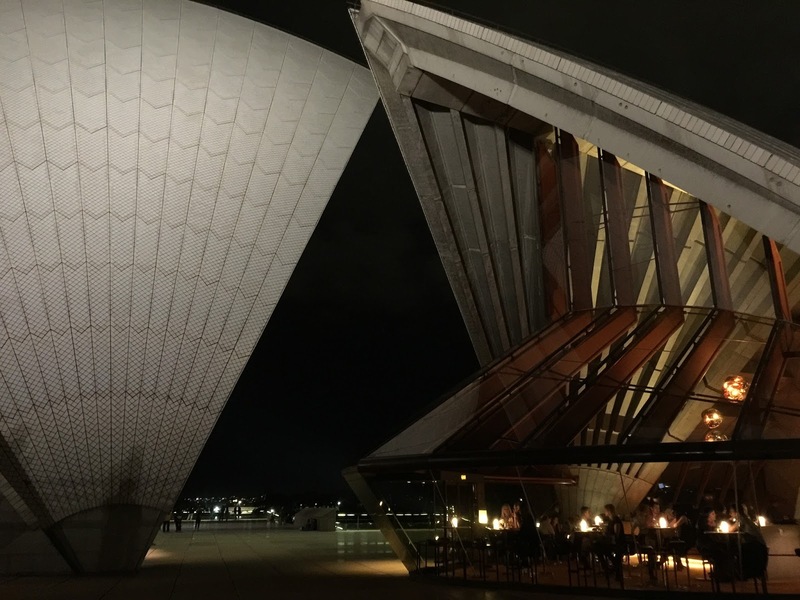 Getting up close to the Opera House, it seems to emit a sense of timeless beauty and classiness. 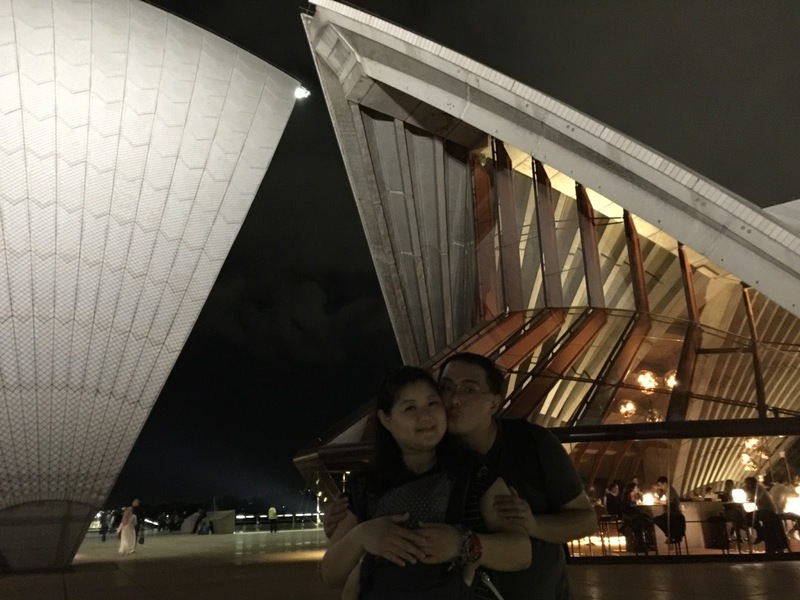 There are plenty of photo spots around the Opera House buildings, however, one would not be able to the entire building into the picture. 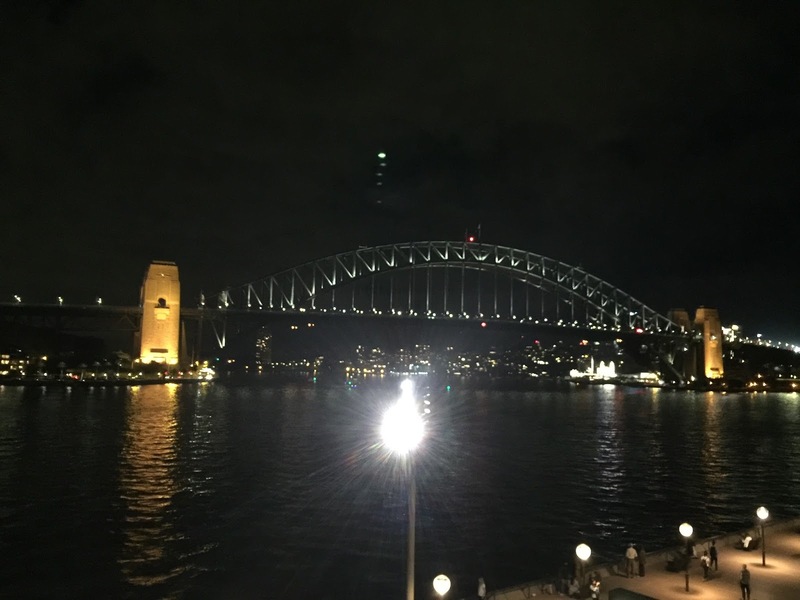 For a great view of both Sydney Opera House and Sydney Harbour Bridge, head to Mrs Macquarie’s Point, a short 10 mins drive from the Opera House. 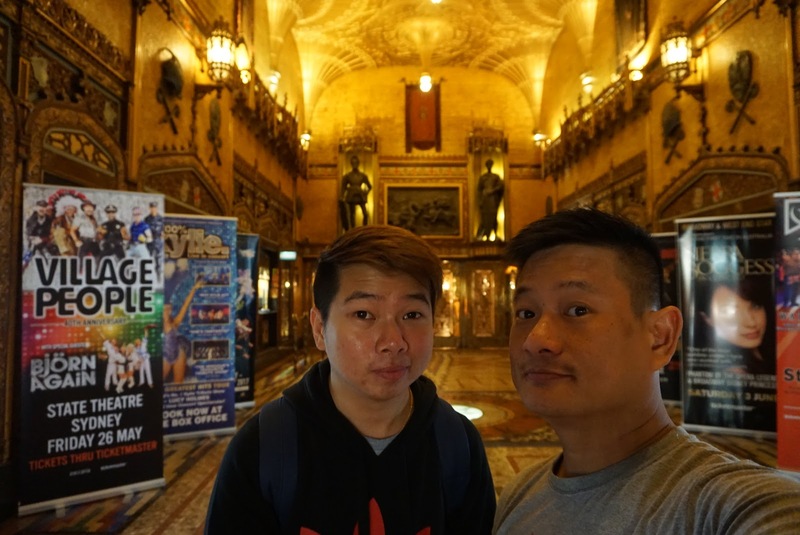 We headed inside the Opera House. 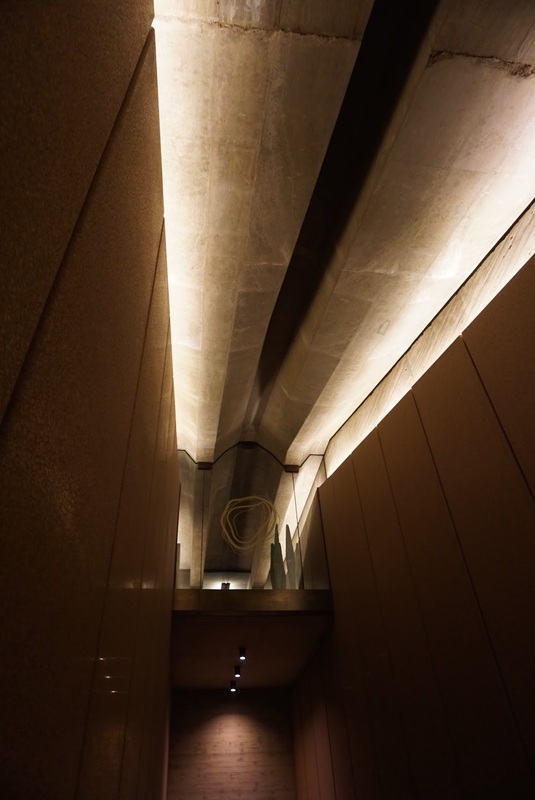 The ceilings are decked in the concrete grey, as though telling visitors no fanciful dressings are required for its interior. The building is already magnificent even with the plain grey concretes. There is a shop inside the ticketing area of the Opera House selling memorabilia. 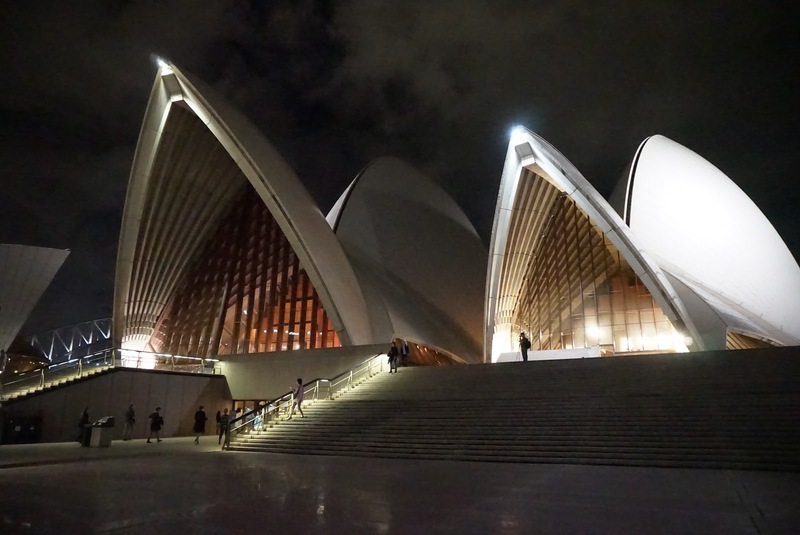 One can also opt to join a 1 hour guided tour of the Opera House (costs A$37) to get a better understanding of the history and architecture of the building explained in detail by the staff. 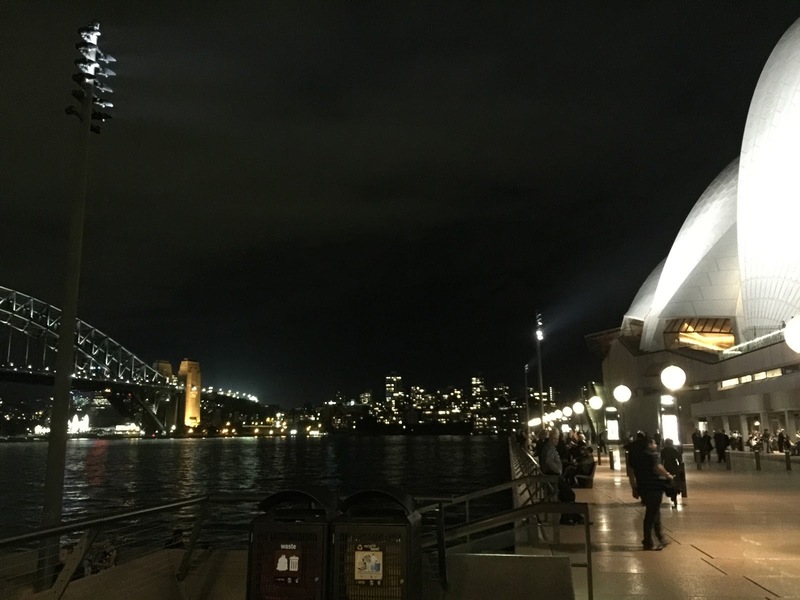 We stayed here for quite awhile to admire the grandeur of this iconic structure that visitors and locals come to identify Sydney with before heading back to rest for the night. 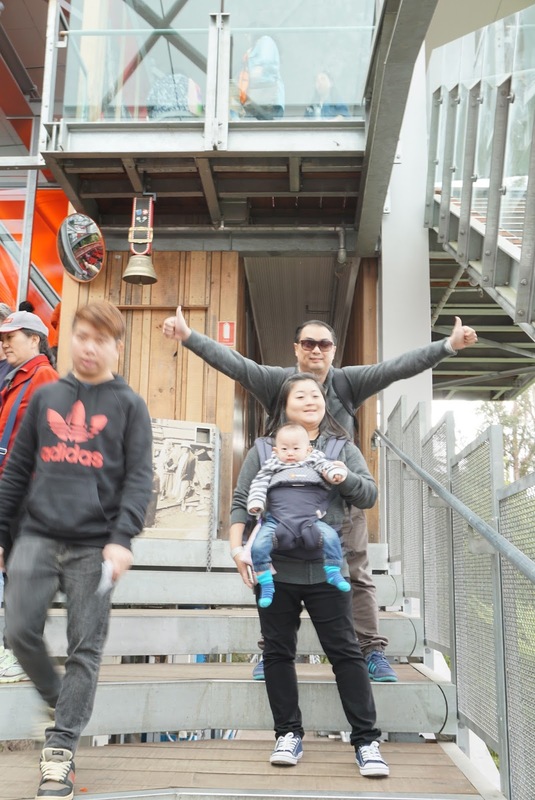 Our plan today is to visit the Finchley lookout and the Chocolate Factory as well as some wineries in Hunter Valley, New South Wales premier winery region. 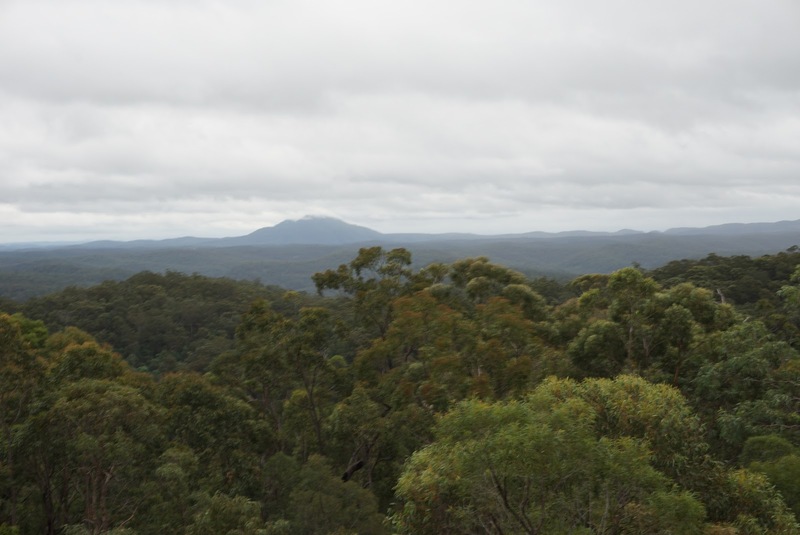 However we did some last minute change in plans after our visit to Finchley Lookout in Yengo National Park. It is autumn at this time of the year in Australia, this means that sun will set at around 5pm, after which it would be dark. My previous experience with driving in Australian roads tells me that we would have to rely on reflectors along the road when driving after dark in suburban roads. 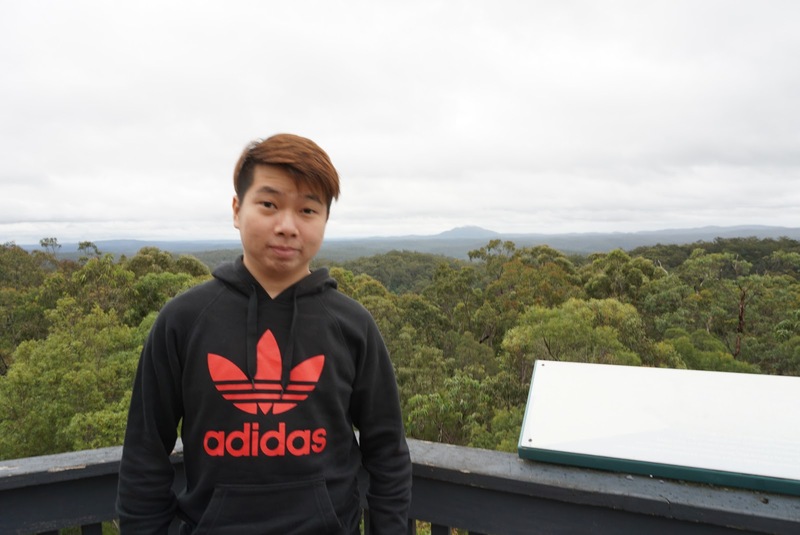 Hence we visited the Finchley Lookout on our way to Hunter Valley. 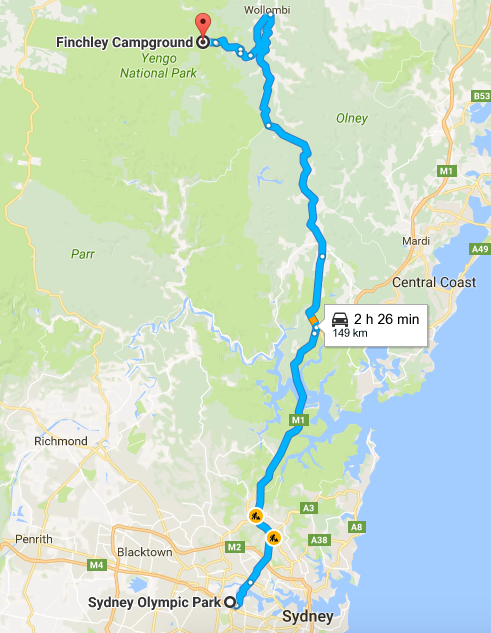 The drive to Finchley Lookout takes around 2 hours from Sydney Olympic Park. 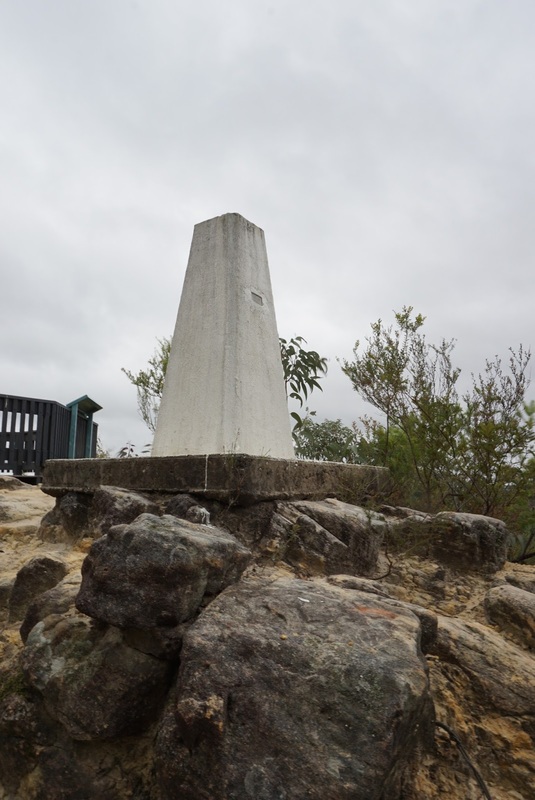 Finchley Lookout is located some 150km northwest of Sydney Olympic Park. We set out about 3 hours later than planned as my nephew, Baby Ryker, woke up pretty late. 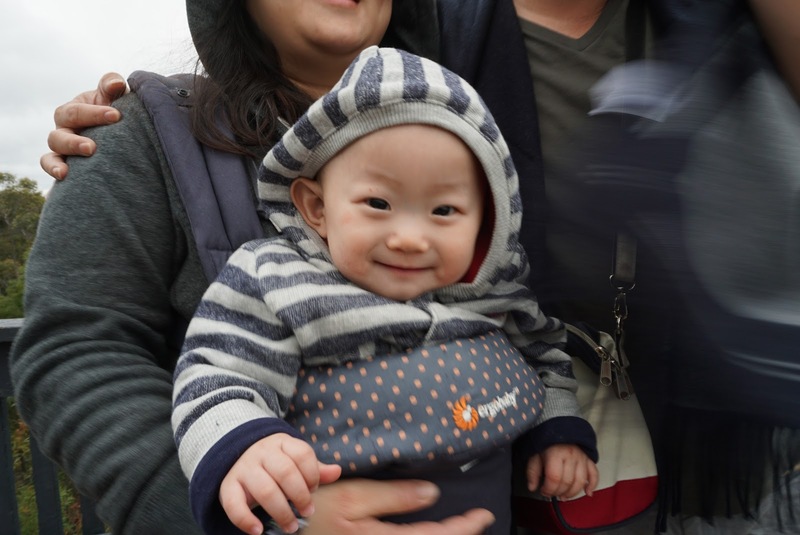 We wanted him to sleep a little more before setting out. As we were driving towards Finchley Lookout, the 3-laned highway turned into one-laned (2-way) country road, zipping pass some farmlands and rural areas. Whizzing up and down mountainous roads, we eventually ended up into a single lane gravel road. This is when a sense of adventure begins. There are no reflectors nor barriers as we were driving up and down slopes. The drive from where the gravel road starts to Finchley Lookout takes around 45 mins, longer than I had expected. 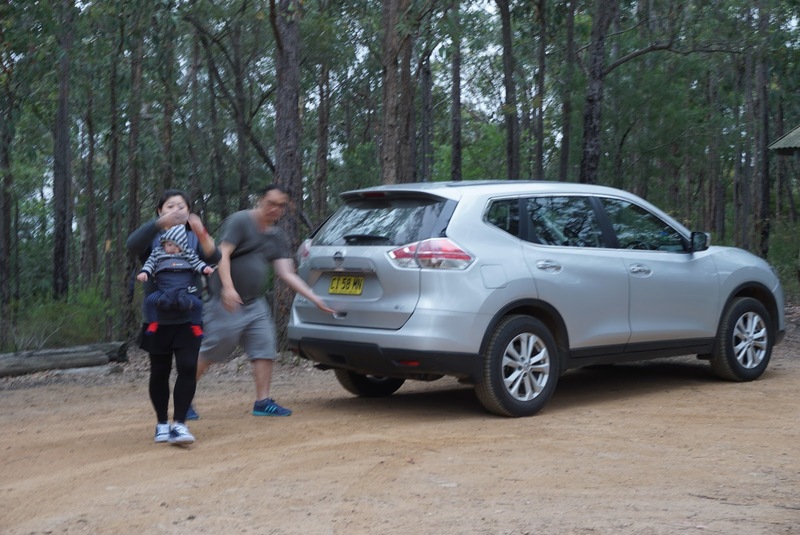 From my research prior to the trip, I was expecting gravel roads before we reach Finchley Lookout, but I did not expect the drive to take 45 mins. 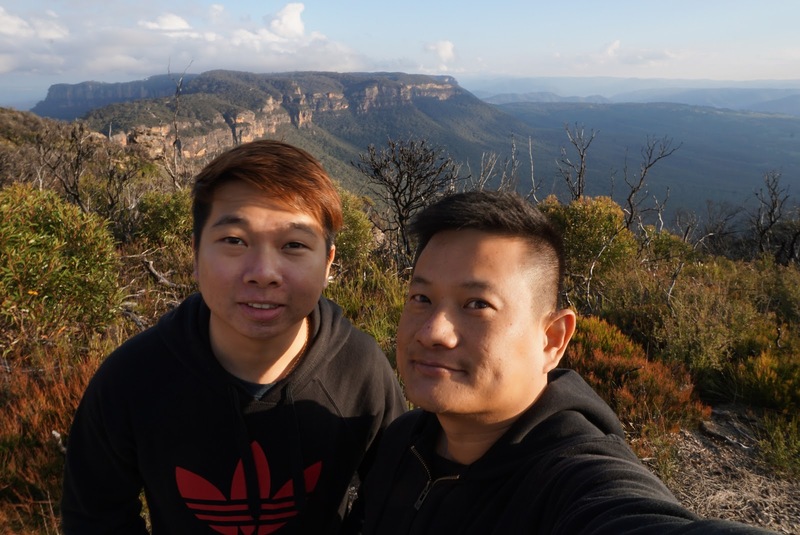 At this point, we were glad that we made the decision to visit this lookout during daylight and I thought to myself, the view better be worth the drive. 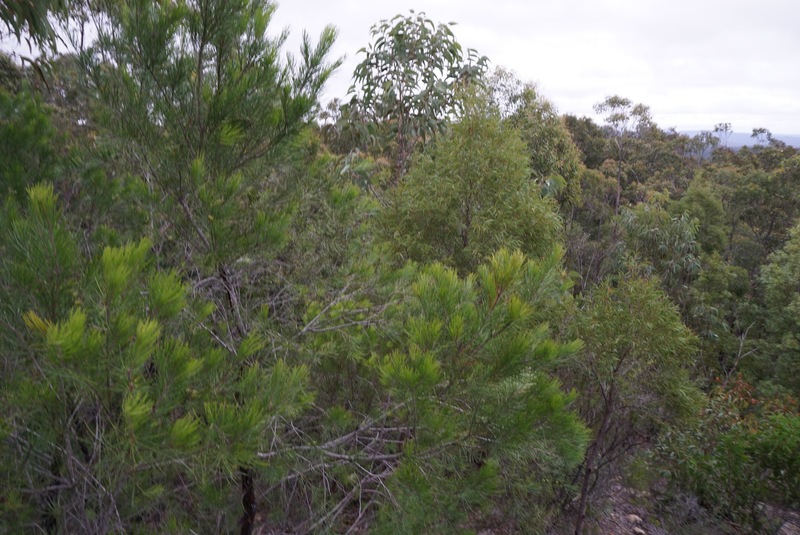 As we were driving along the gravel road, a sign was in sight pointing to Finchley Lookout. We finally arrived at our destination after 2 hours on the road. There are no proper parking facilities, but just some space for us to park our vehicle. 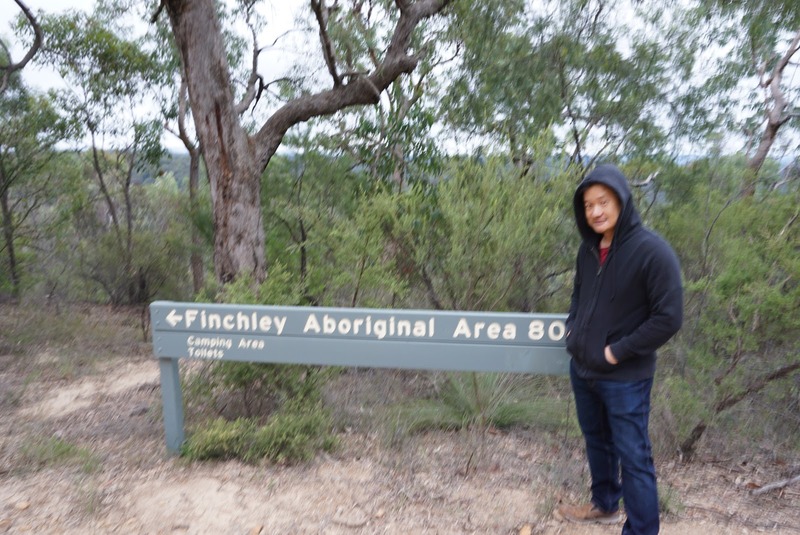 There are no one here when we reached Finchley Lookout. 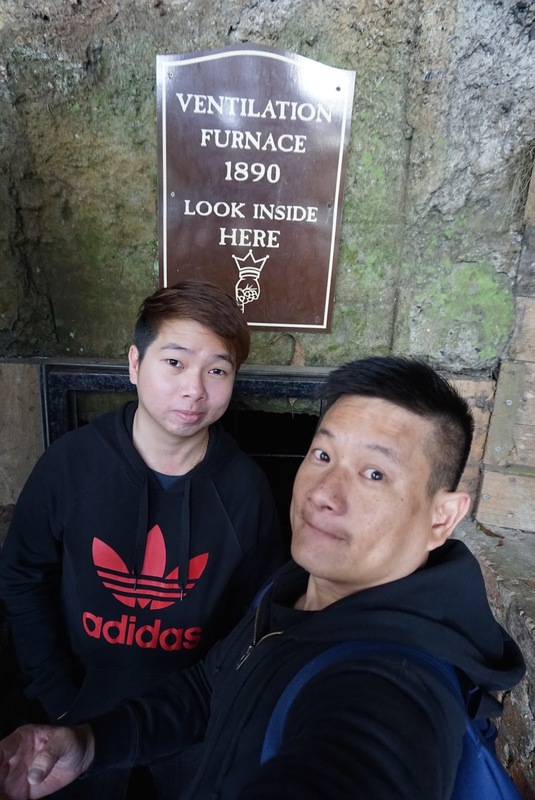 We will soon find out if the drive was worth it at the bottom of a small flight of stairs that led to a wooden platform – The Finchley Lookout. 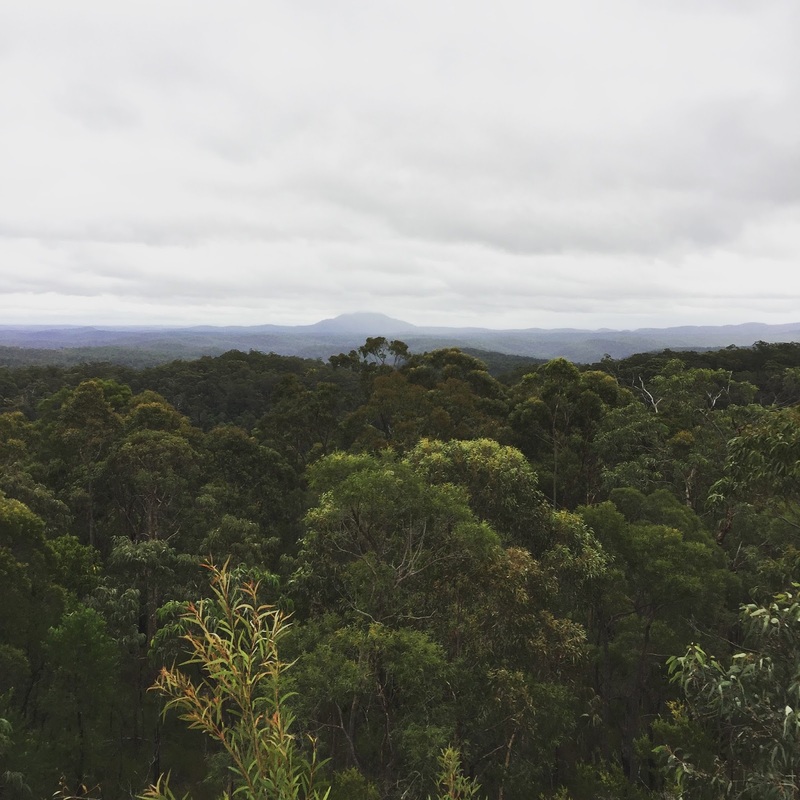 We reached the Finchley lookout after climbing up the stairs, the surrounding opened up from deserted forest to a remote land of wilderness stretching beyond the horizon. 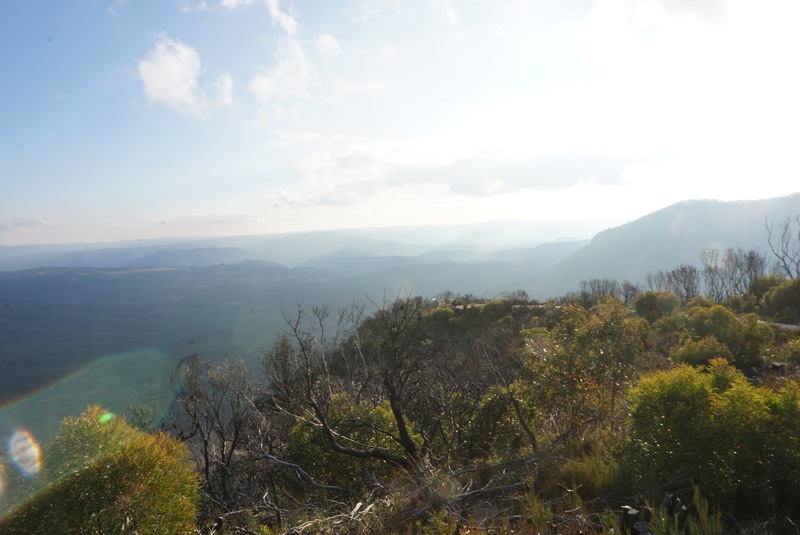 We were awed by the view and soon felt the drive was indeed worth it! 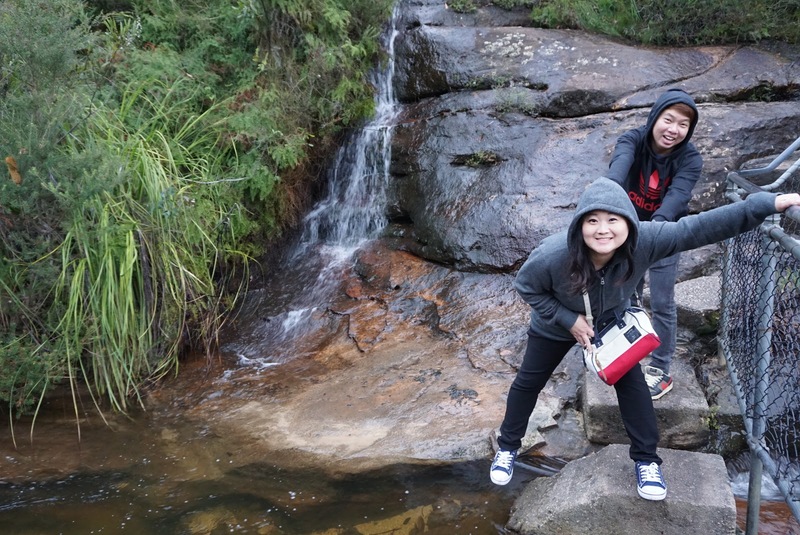 Coupled with the fact that we were the only ones here at the time of our visit, it felt like we had the entire Yengo National Park to us. 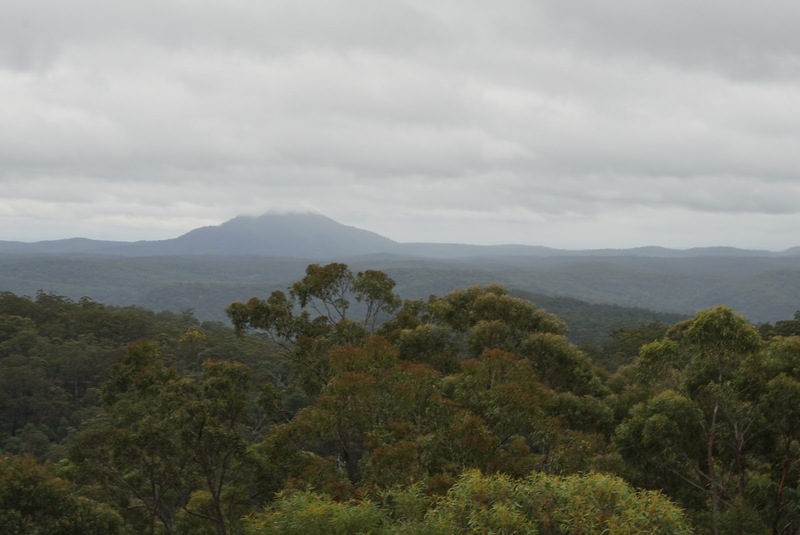 From Finchley Lookout, we spotted Mt Yengo standing majestically afar from the forest, as though it commands the entire Yengo National Park. 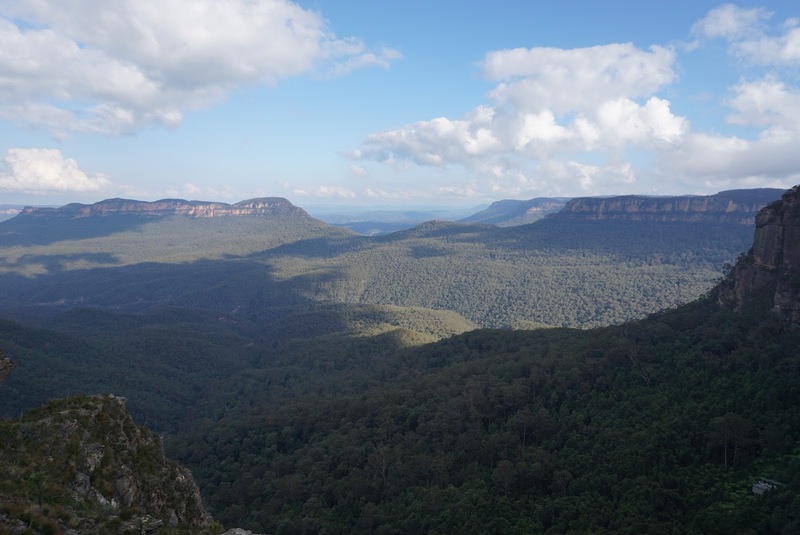 We could almost see the entire Yengo National Park, which is one of the eight protected areas in Blue Mountains Region that was enscribed to form part of the UNESCO World Heritage list. 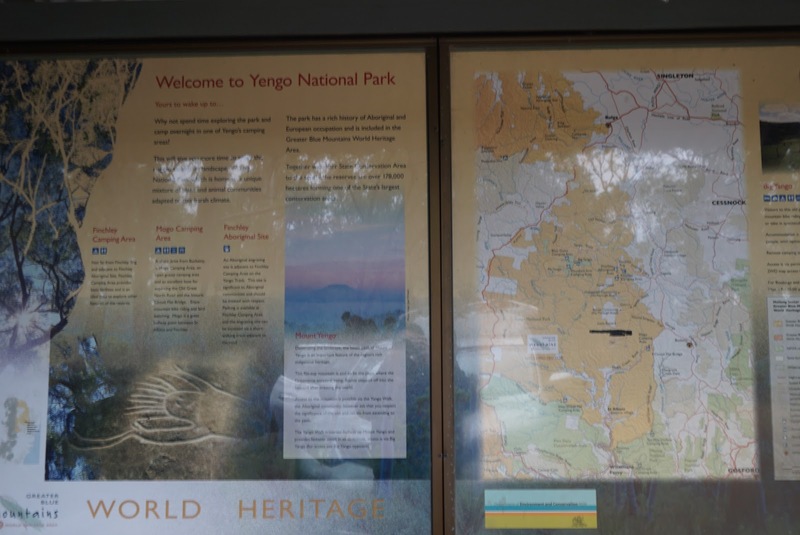 Yengo National Park holds a special place in the hearts of the Aborigines in this region as it is an important spiritual and cultural area for them for thousands of years. 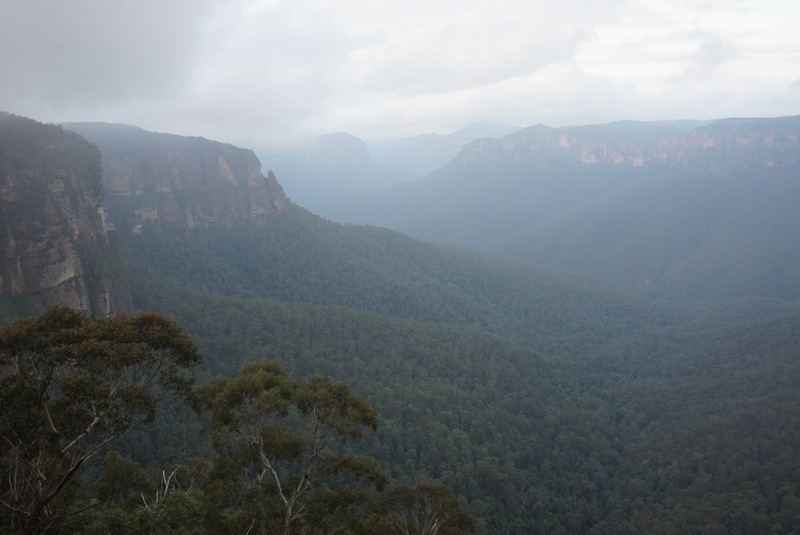 There are over 600 recorded Aboriginal cultural sites in this national park. 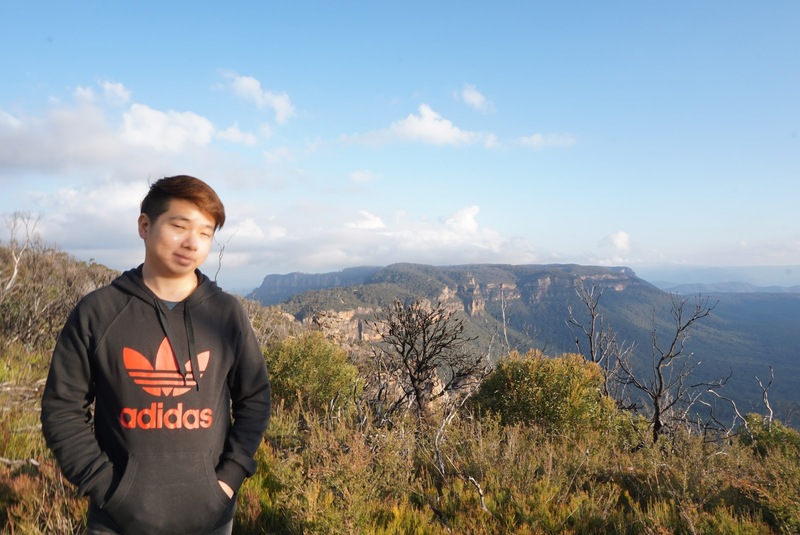 It is legended that the ancestral being stepped off Mt Yengo into the sky after finishing his creation. 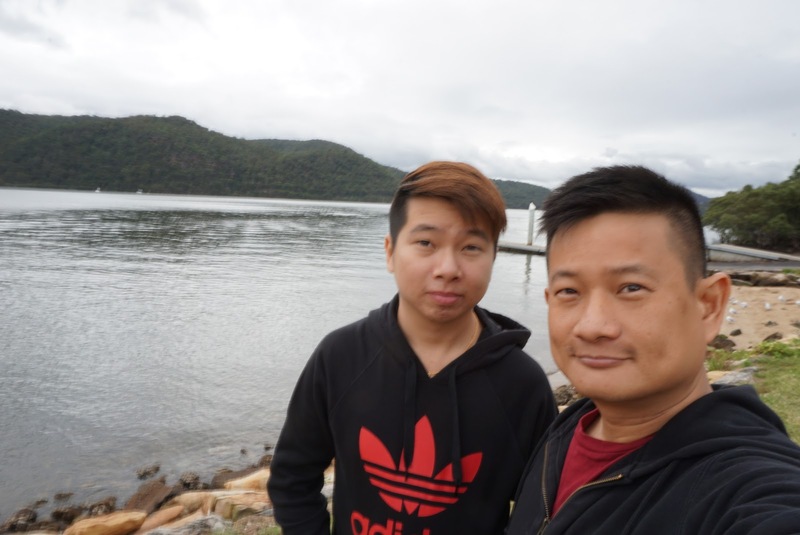 As it is getting late, we headed off to Hunter Valley before it turns dark. 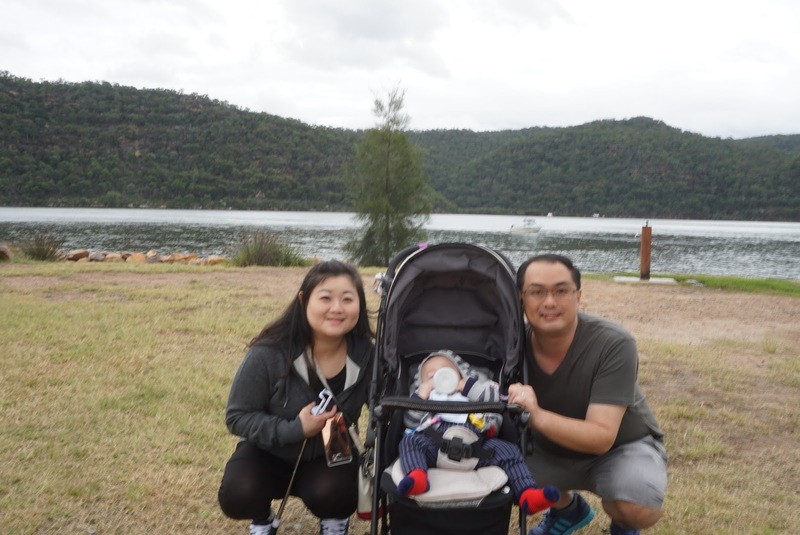 As we were driving towards Hunter Valley Winery region, gravel road turned into tarred roads and civilisation were once in sight. About 1 hour into our journey, it started to pour heavily. We were glad that we got off the gravel roads before it started to rain. 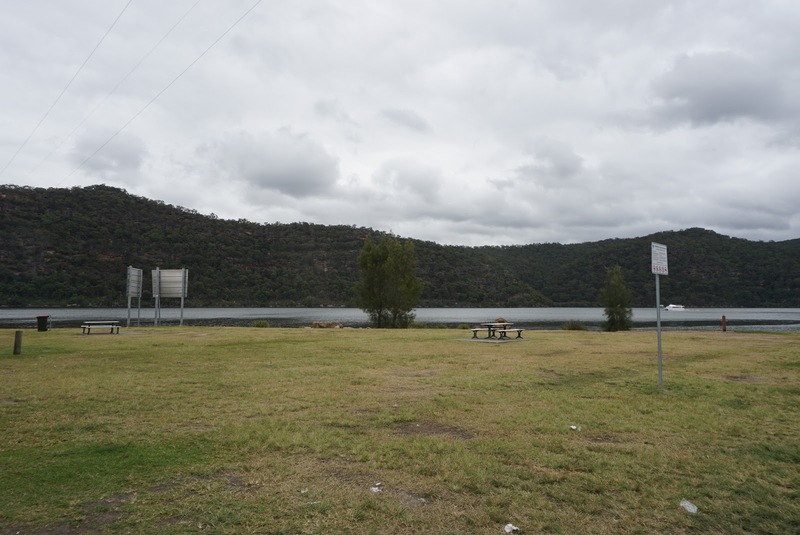 Soon we found ourselves in the town of Wollombi, the last town before we reached Hunter Valley Chocolate Factory. Along the way there are signs that points towards some Wineries. As we missed our lunch and we were getting hungry, we stopped by to grab some food. It is already 4.30pm now. Knowing that shops close around 5pm, a check with the Chocolate Factory’s website confirmed the closing time. 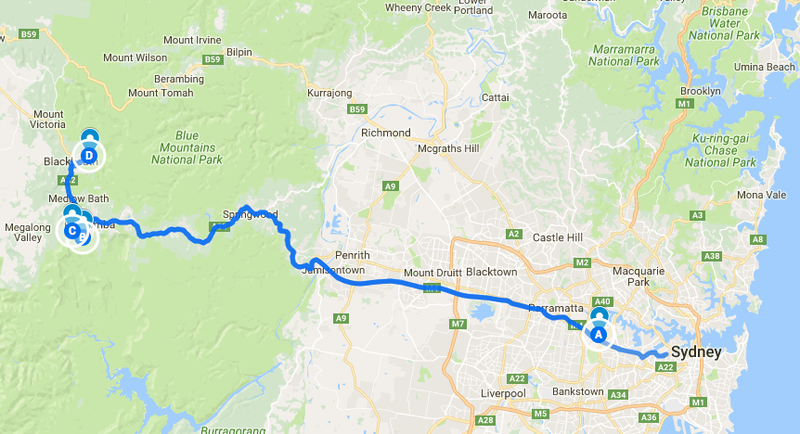 At this time, I proposed to change in plan and head back to Sydney instead as the factory will be closed by the time we reach (we still have another 30 mins drive from Wollombi to the Hunter Valley Chocolate Factory). As we were driving towards the main roads, we spotted a shopping mall with supermarket. My sister wanted to check out the supermarket and we headed there. We spent some time at the supermarket. 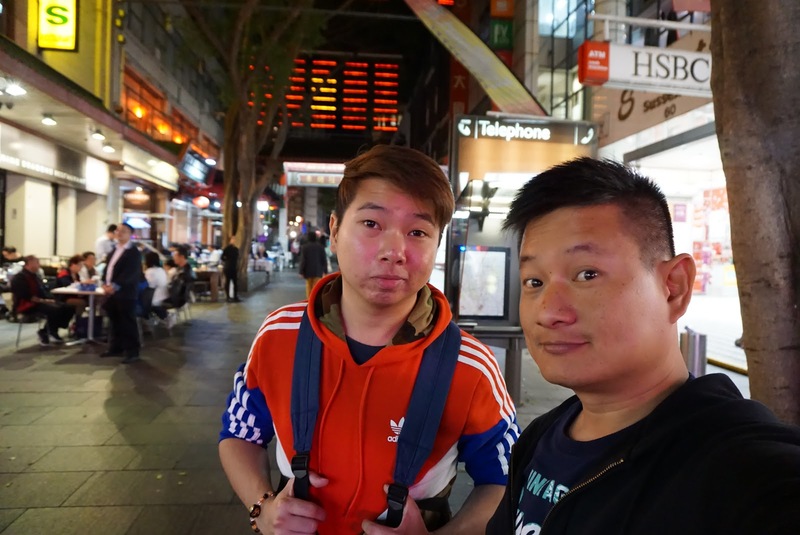 The night was still young, we headed straight to The Star Casino in Sydney, hoping to find some food before we head back to our apartment to rest. 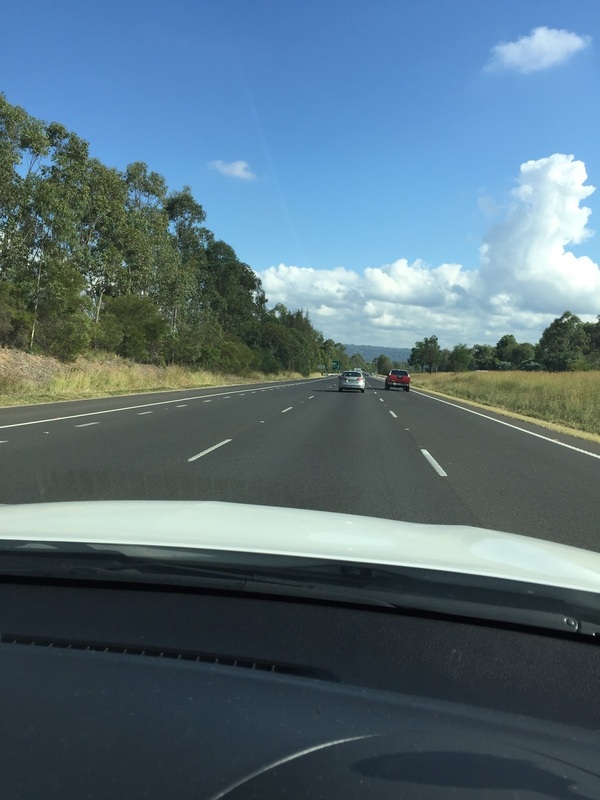 The drive back to Sydney took another 2 hours. 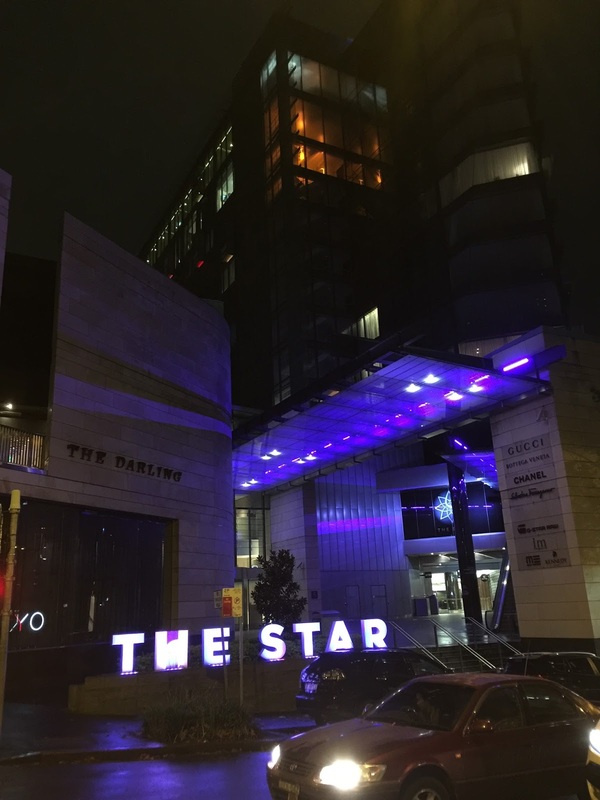 It is around 11pm when we reached The Star Casino. Most of the eateries in the Casino has closed for the day. 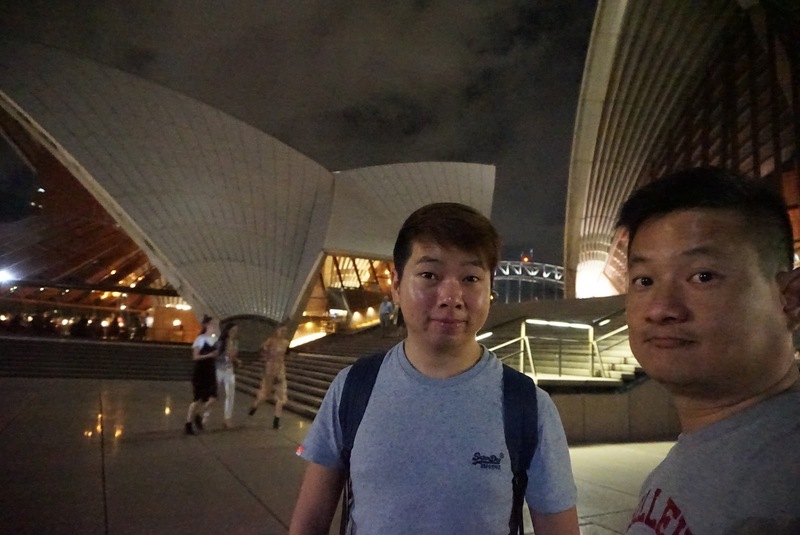 We headed to the nearby Harbourside Shopping Centre for later dinner before heading back to Sydney Olympic Park. 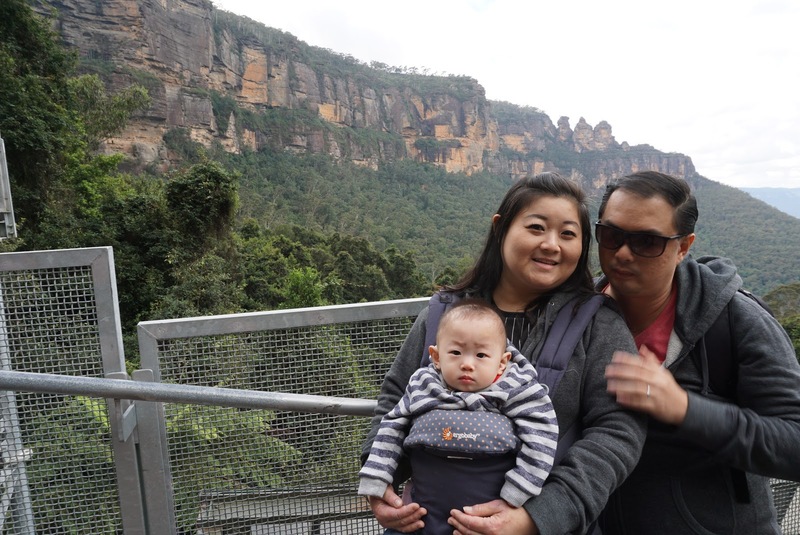 My sister wanted to visit Sydney when she did not managed to visit Gold Coast last year due to her pregnancy. 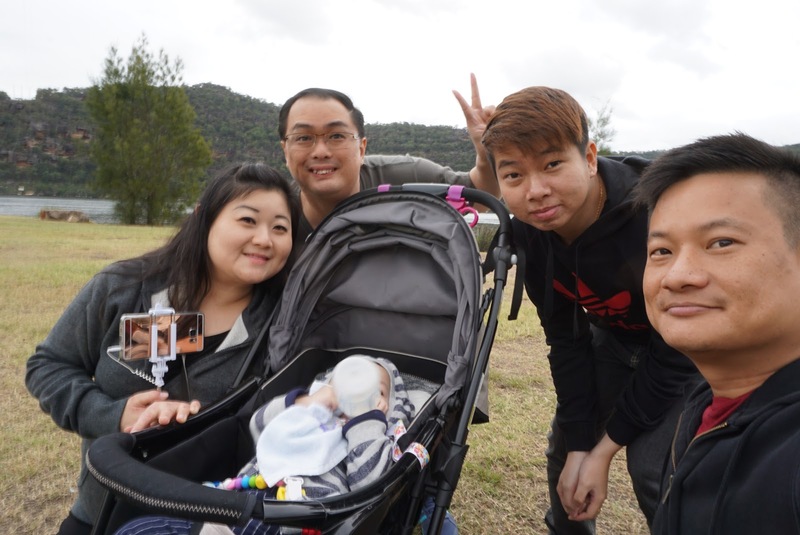 As the rest of the party had never been to Sydney, we made a 6-day trip to the capital city of New South Wales state in Australia. 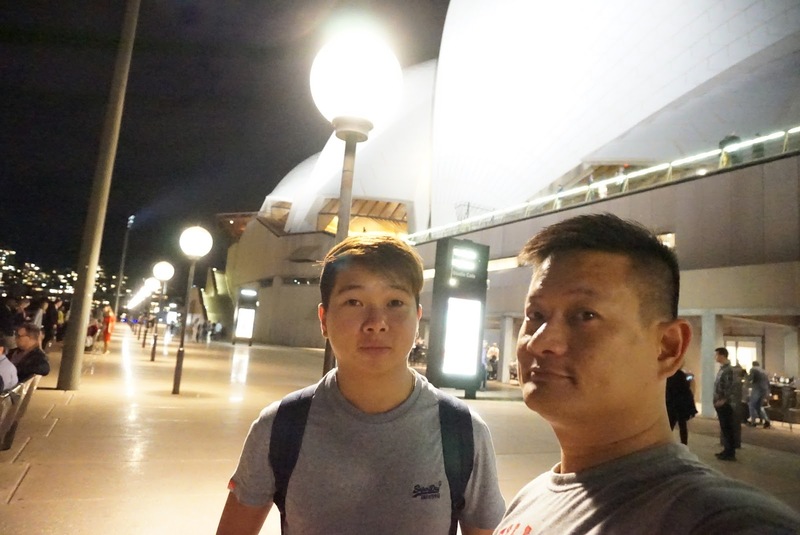 After a tiring overnight flight from Singapore, we finally reached Sydney Kingsford Smith Airport, the city’s international gateway. 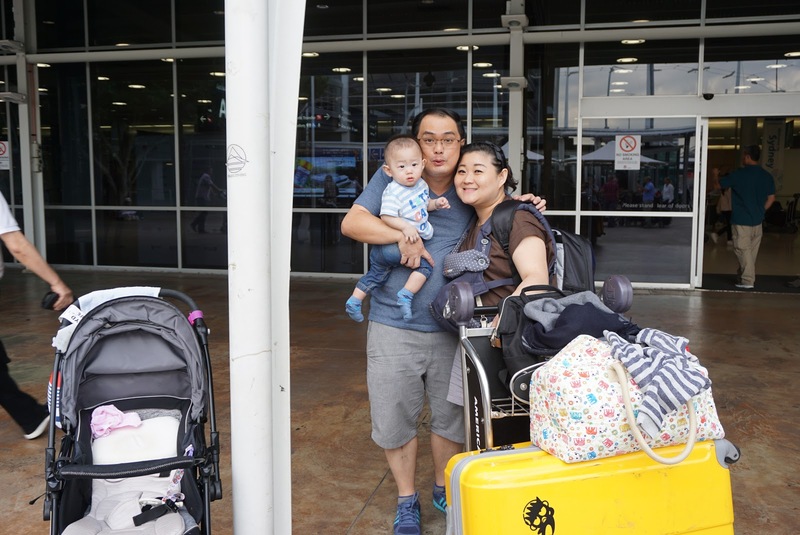 Clearing custom was a breeze thanks to the efficient automated gate clearance and the numerous airport security staff directing visitors who are eligible to use the automated custom clearance. 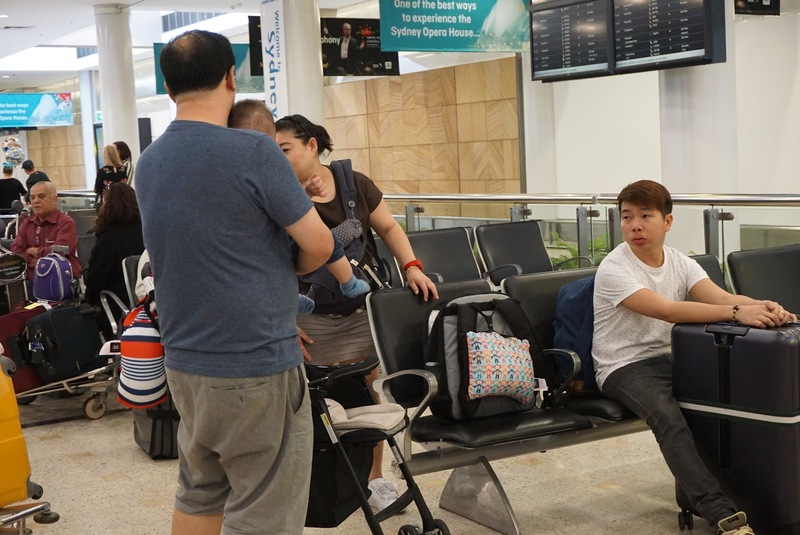 No pre-registration is required for visitors to use these automated custom clearance gates, which is a plus unlike some countries where one is required to pre-register in order to use these facilities. We wasted no time and quickly got our SIM cards from one of the 2 telco counters (Optus and Vodafone) to the right of the immigration gates. 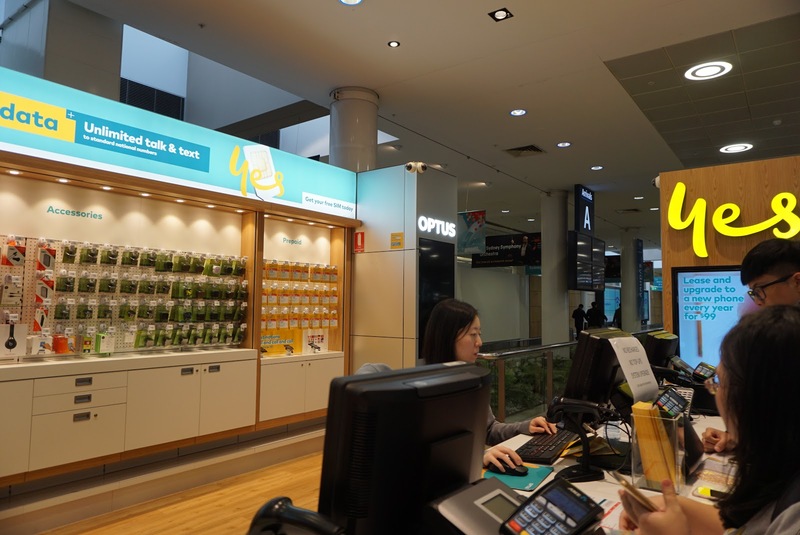 Personally I prefer Optus due to the value for money (we paid A$10, including SIM Card, for 5 days of data and phone usage) and the reliable connection from my previous experience last year while traveling in Gold Coast. After the staff had our phones set up for data usage, we proceeded to the car rental counters, located to the left of the immigration exit to pick up our rented car. It is expected that we will be drained from the overnight flight, we intentionally kept today’s itinerary very light. 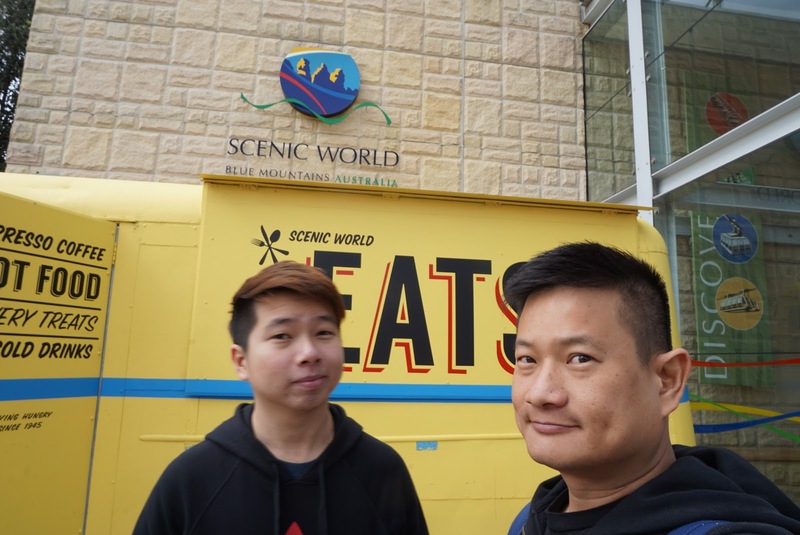 We drove to our AirBnb accommodation located in Sydney Olympic Park, located about 30 mins drive from Sydney Central. Our host was already waiting for us with the keys to the spacious 2 bedroom apartment. Sydney Olympic Park was the venue for the 2000 Sydney Olympics games, complete with villages where the athletes were housed back in 2000. 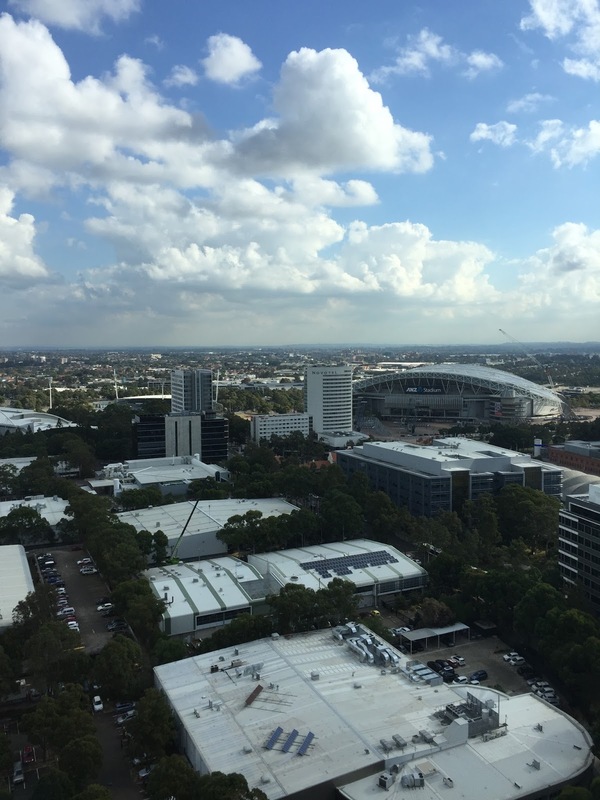 Today the Sydney Olympic Park is a major suburb, twice the size of Sydney Central Business District, where residential and commercial activities are located. Other then being a commercial and residential suburb, Sydney Olympic Park is also a major sporting hub, where sporting facilities used during the 2000 Sydney Olympic Games are “recycled” for the public and professional athletes to use. There are shops, eateries and supermarkets within minutes drive from our accommodation, making it an ideal place to settle in for this trip. 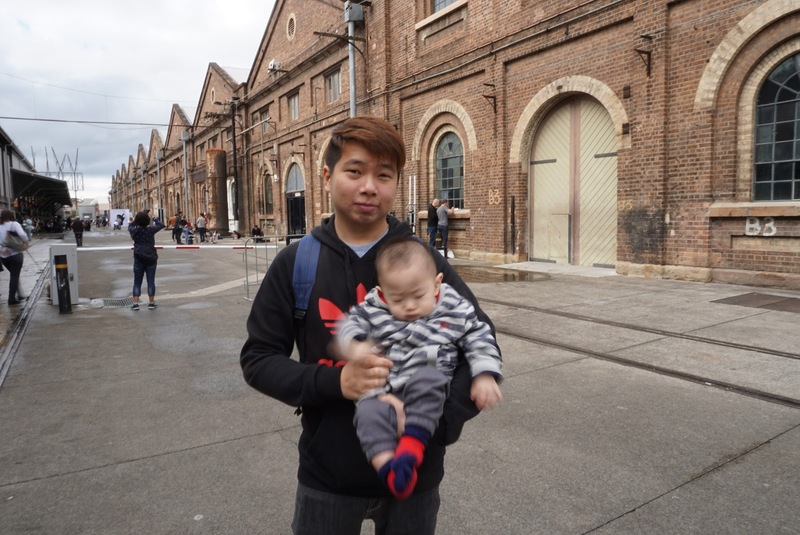 It is already getting late by the time we settled into our apartment, as planned we headed out to the factory outlet nearby Sydney Olympic Park. 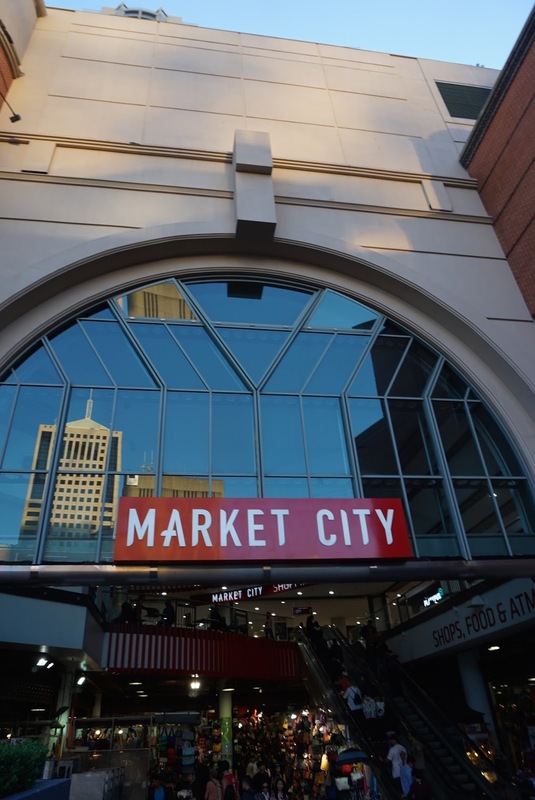 The only outlet mall around Sydney, the DFO Homebush outlet mall is a mere 5 mins drive from our accommodation in Sydney Olympic Park. The 2-stoery outlet mall is rather disappointing, compared to Harbour Town in Gold Coast. Unlike Harbour Town, DFO Homebuswh feels dead with not much people shopping around. There are no eateries, except for a few cafes that were closing at the time we visited. 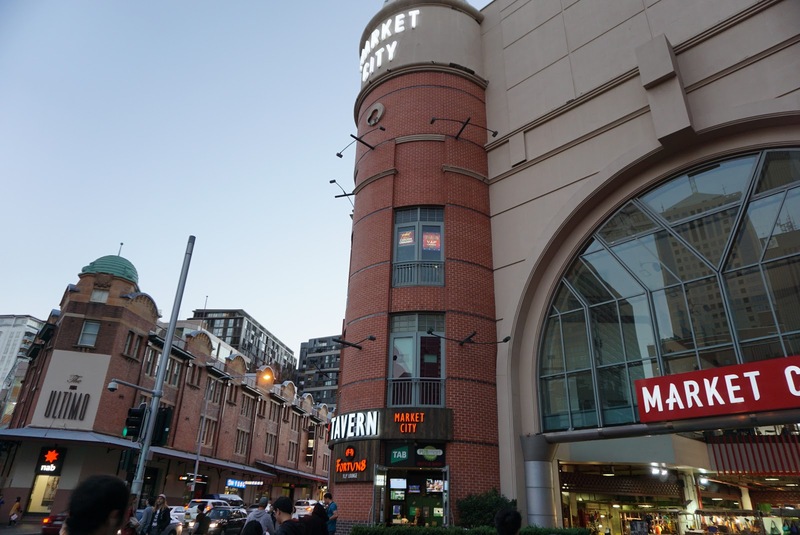 The outlet shops are located on level 1 of the shopping mall, while the home living shop and a couple of sports gear outlet shop occupies the ground floor of the building. We only spent about 1 hour here in DFO due to the disappointing shopping experience. 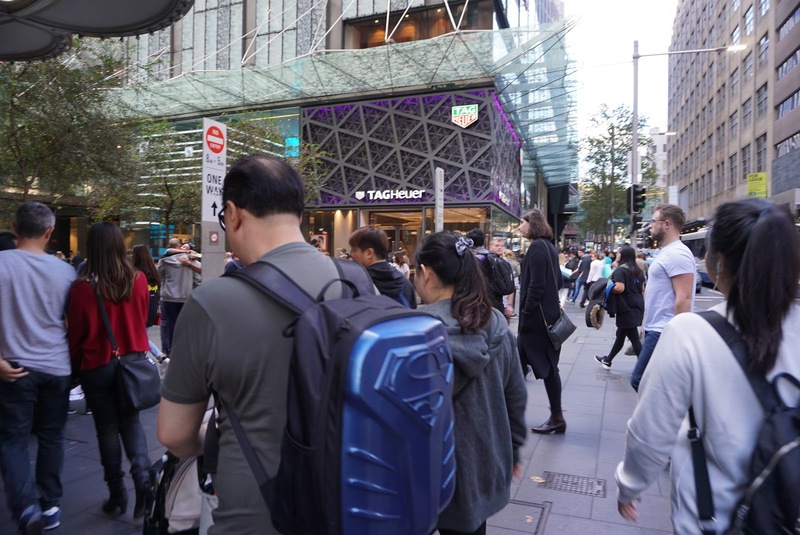 While some of the big brands such as Burberry, Calvin Klein offers good discounts, the goods on offering did not appeal to us. 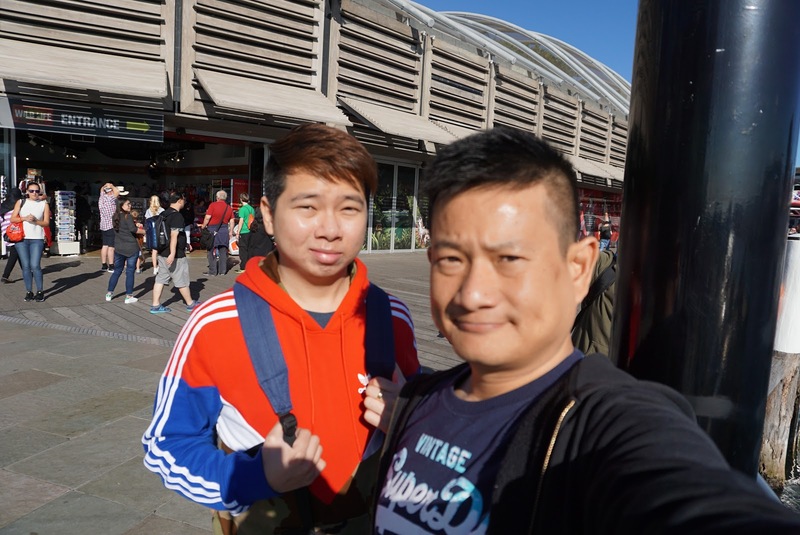 Before heading back to our accommodation, we headed to the supermarket to get some food for breakfast in Rhodes Waterside Mall, which is a 5 mins drive from DFO Homebush. This shopping mall is a vast world of difference from DFO Homebush, there are more people shopping in this mall. Rhodes Waterside Mall houses Ikea, Coles Supermarket, Target and Priceline amongst other shops. One can find most of the daily needs here. 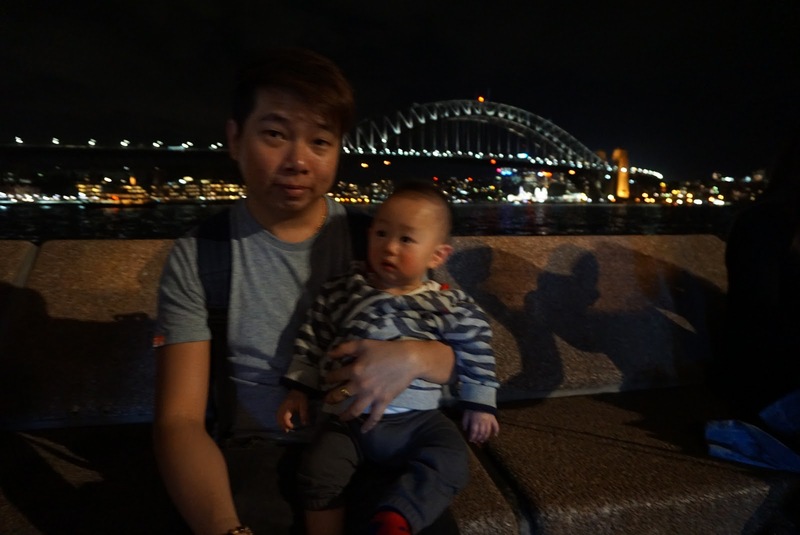 We headed back to Sydney Olympic Park to rest after getting what we wanted from Coles Supermarket (which opens still midnight). Before heading back to our accommodation, we got our dinner from Dominoes which is a mere 3 mins drive from our accommodation.